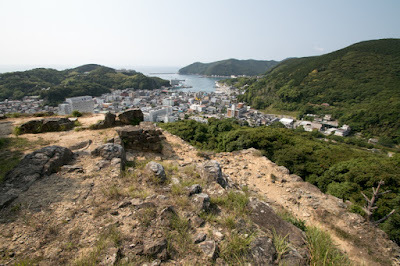 Shimizuyama castle (清水山城) is built from the peak to halfway of Shimizuyama mountain, a branch peak of Ariakeyama mountain at the backside of Izuhara port. Izuhara area is the center of Tsushima island at the east coast of southern island. 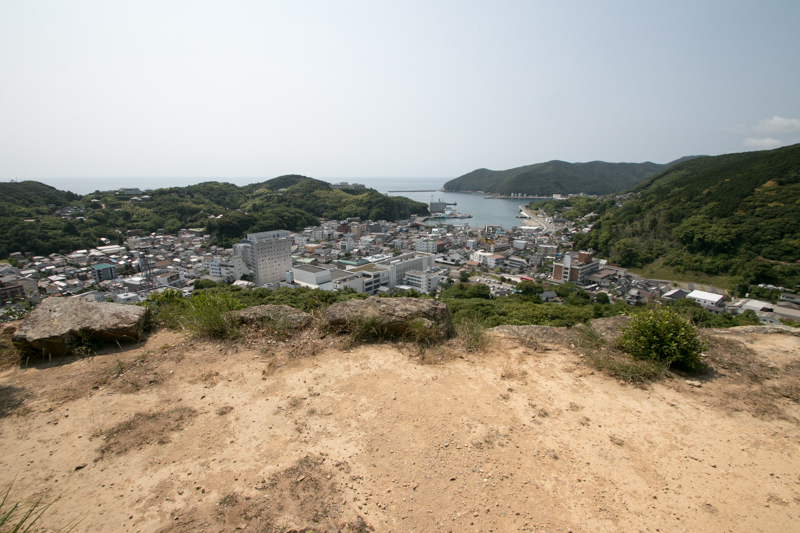 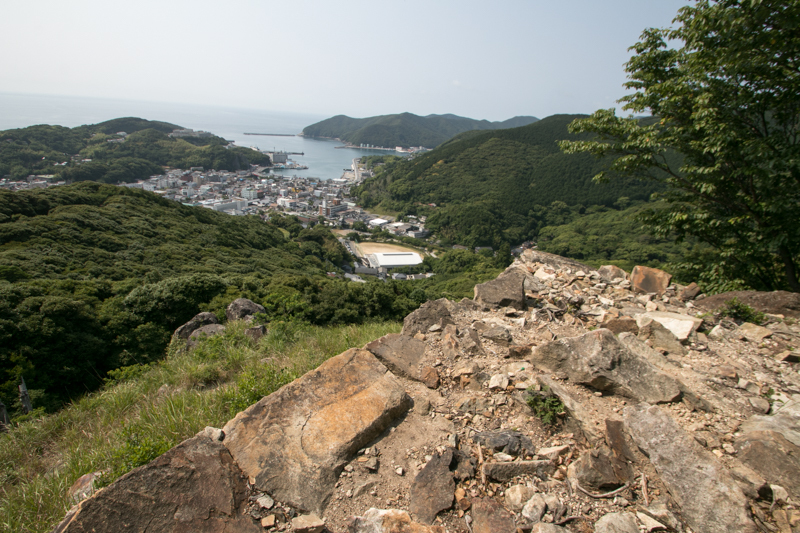 As Shimizuyama mountain is a slightly curved ridge a little oblique from the entrance of the port, it seems a step way climbing toward the sky. Izuhara area is a good port with narrow entrance and two beach like Y letter, with good size flat lands only seen here in the island. 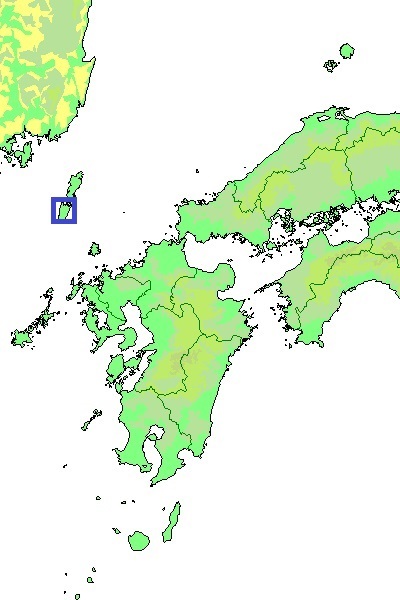 Besides, it locates at southeastern coast of the island, and an ideal place to prevent strong seasonal wind blows from northwest. 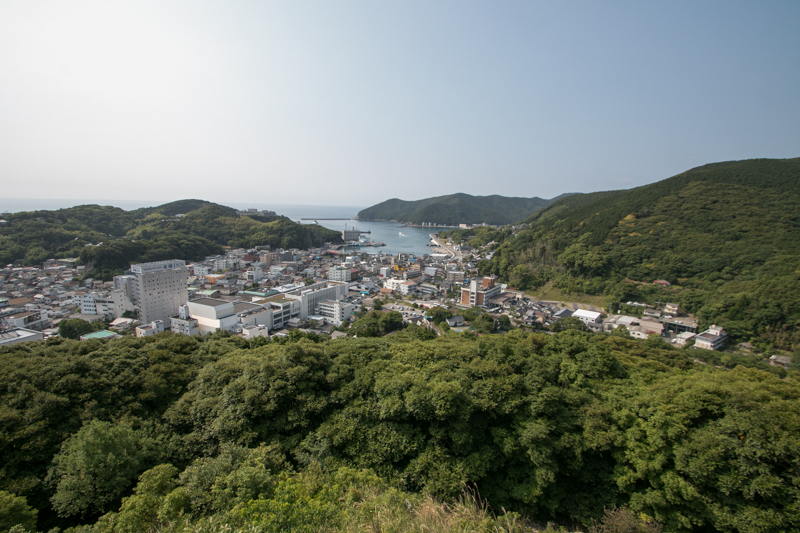 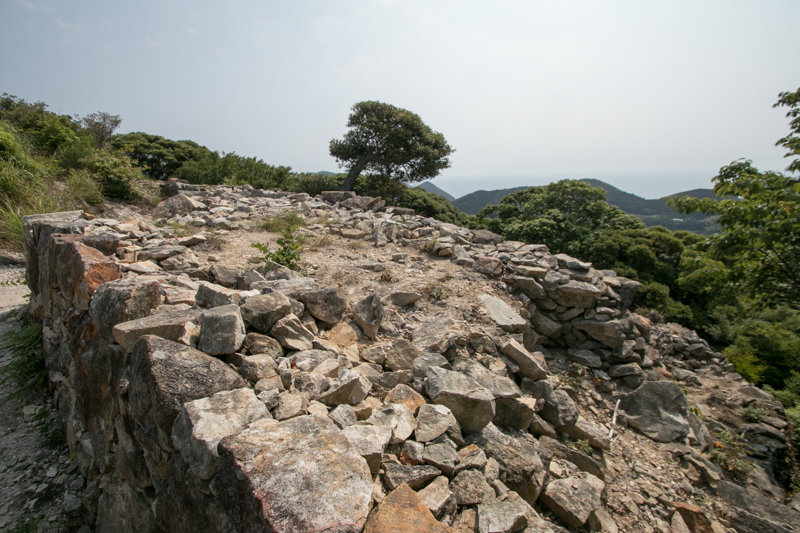 In 7th century, the administrative office of Tsushima province was built at this area, and since then this area has been the important place of the island. Shimizuyama castle was built in 1591 by Takamasa Mori (1559-1628), the retainer of central ruler Hideyoshi Toyotomi (1537-1598) preparing for his foreign expedition. 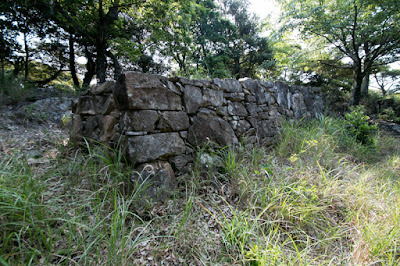 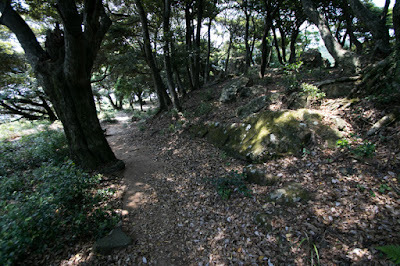 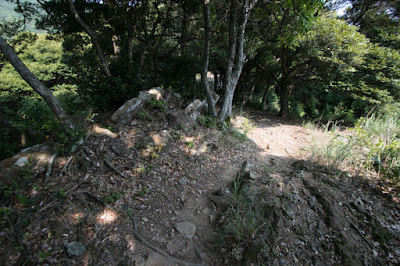 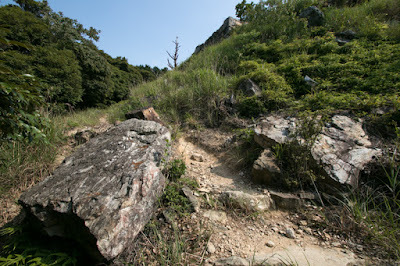 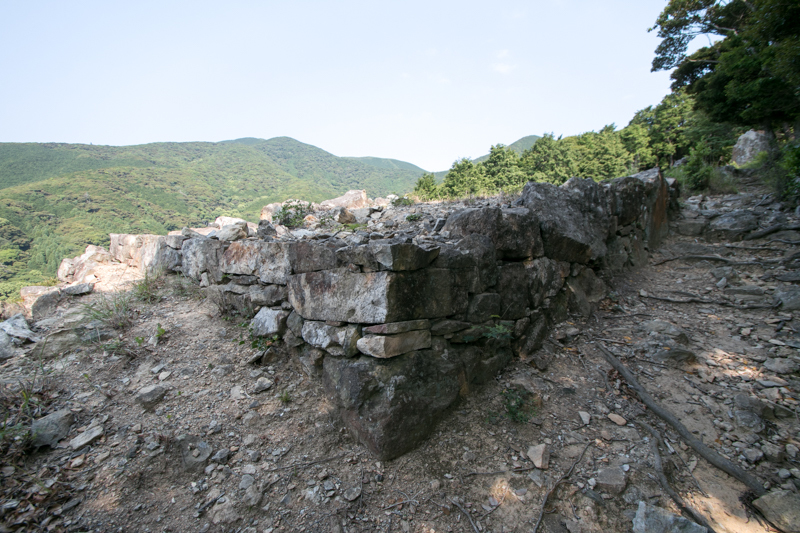 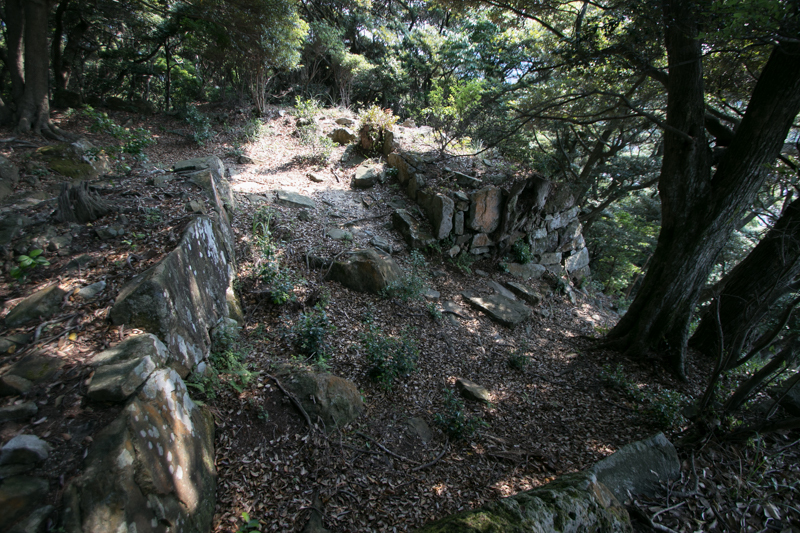 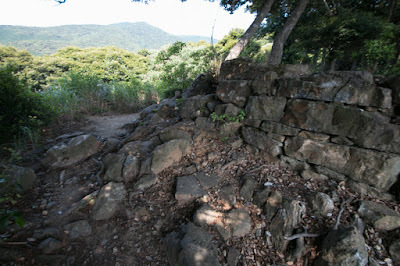 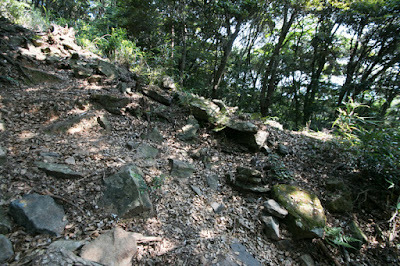 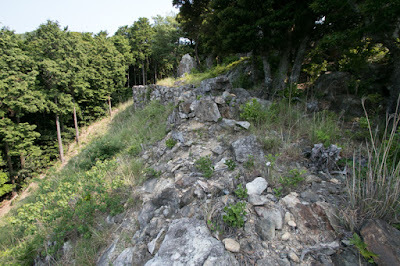 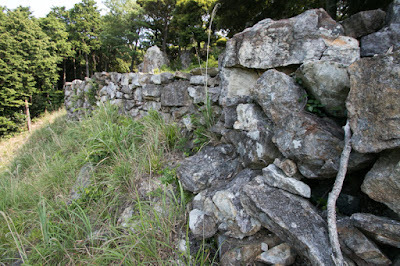 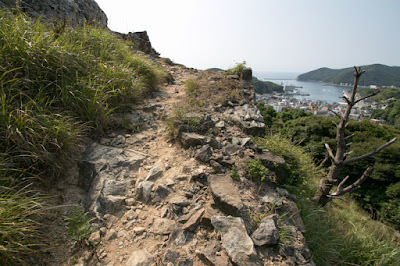 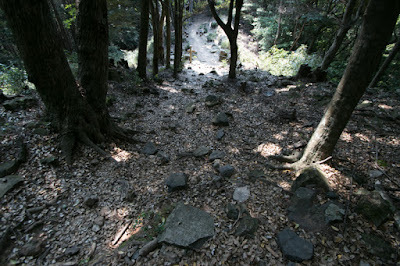 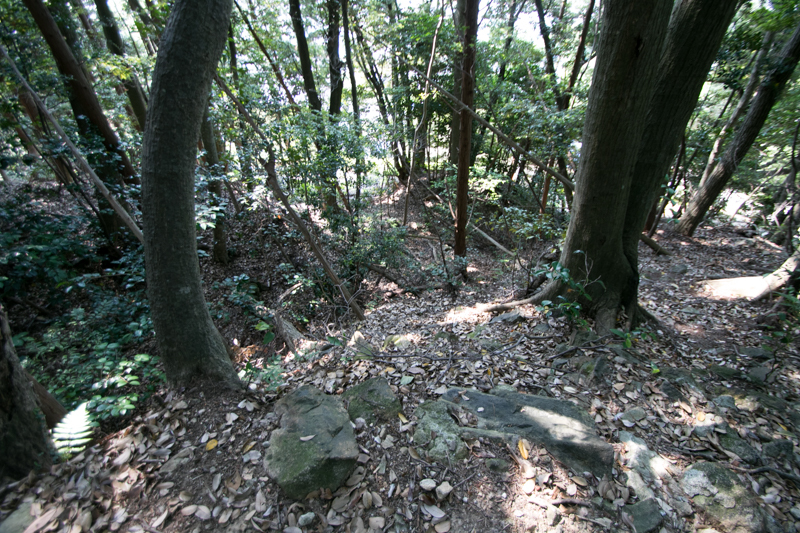 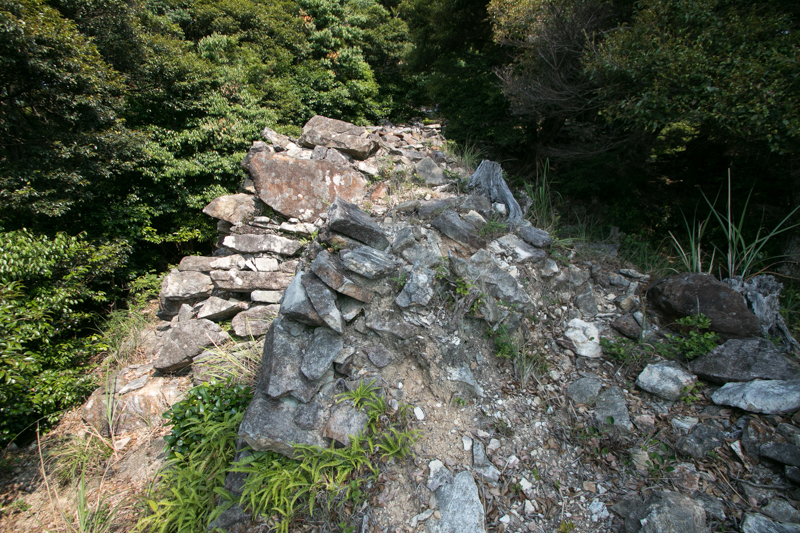 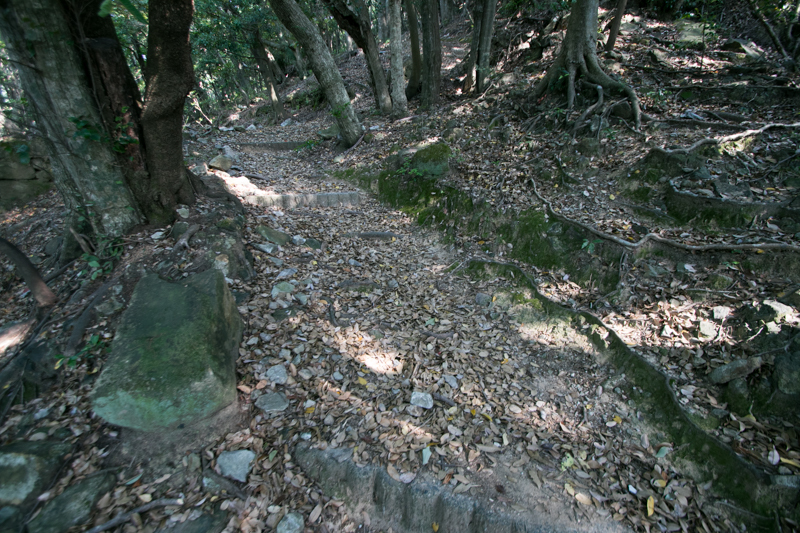 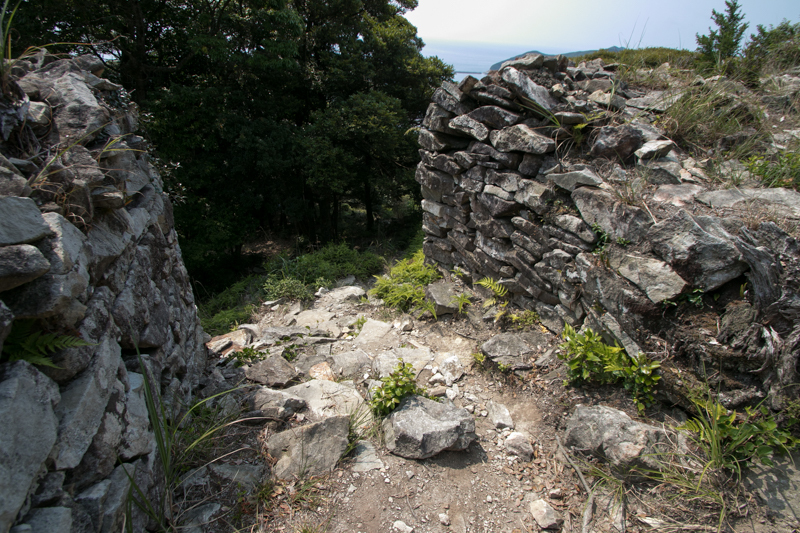 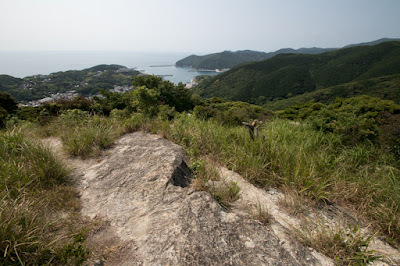 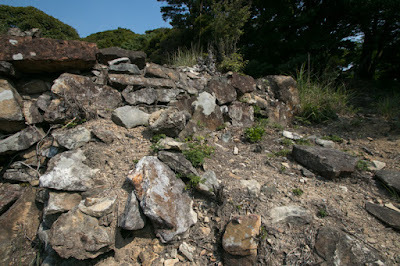 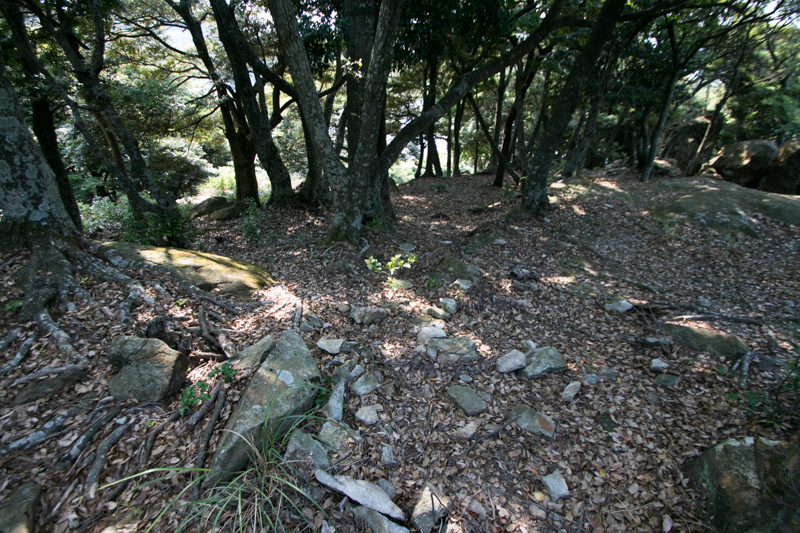 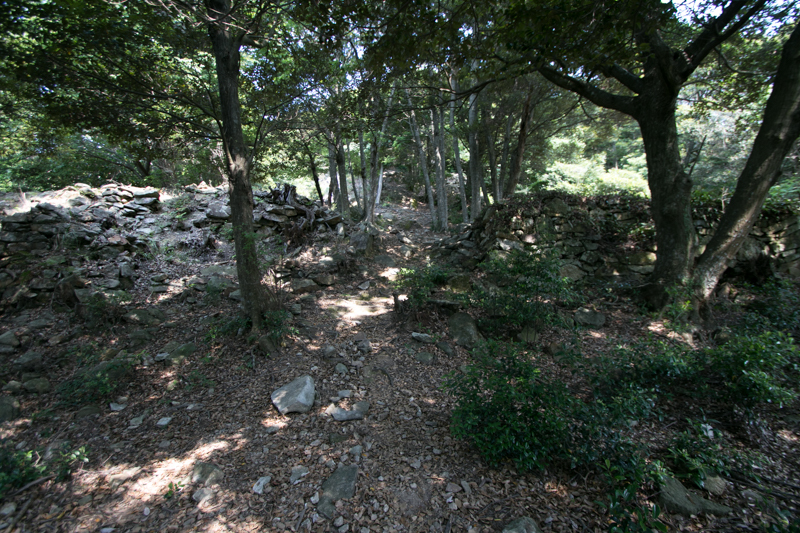 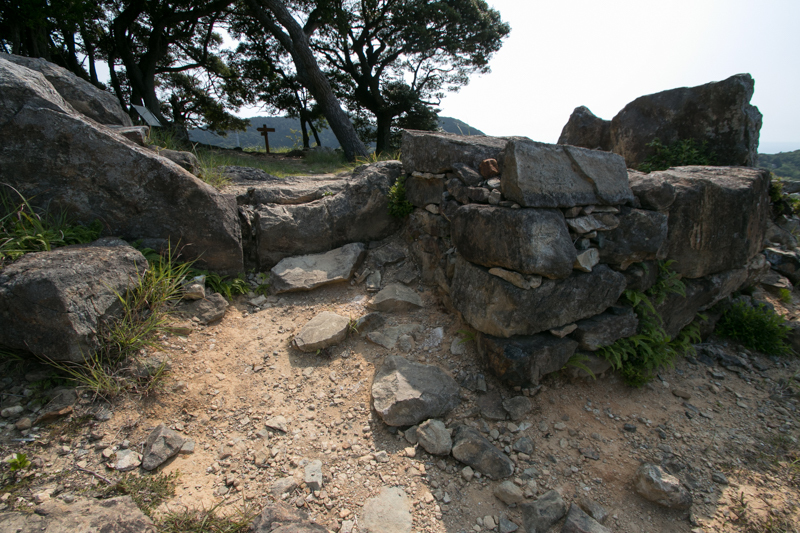 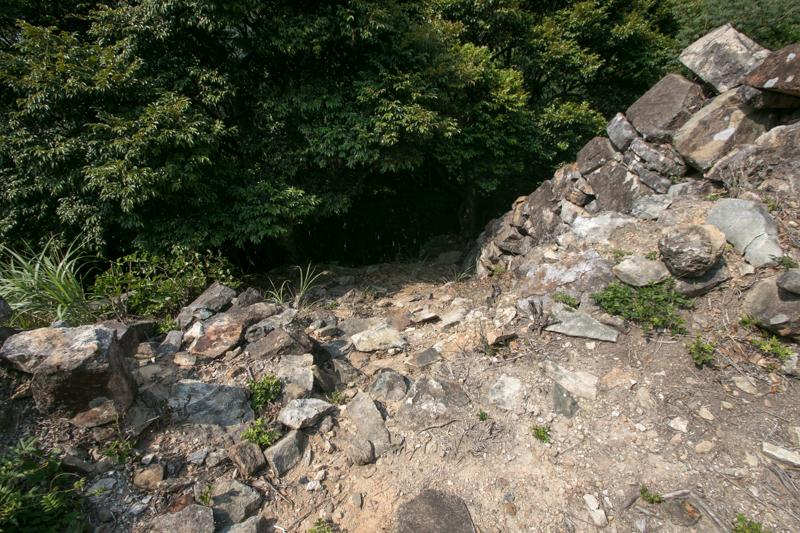 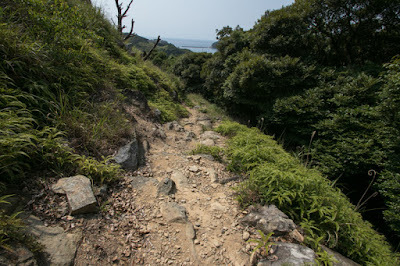 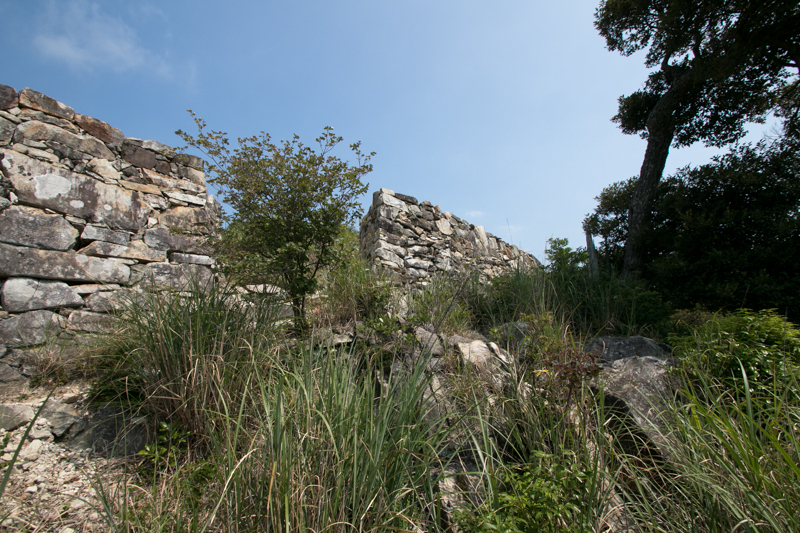 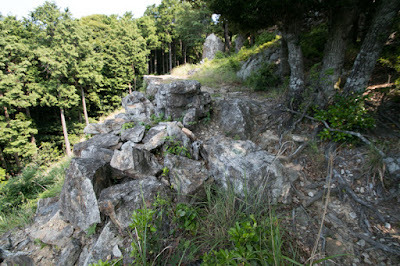 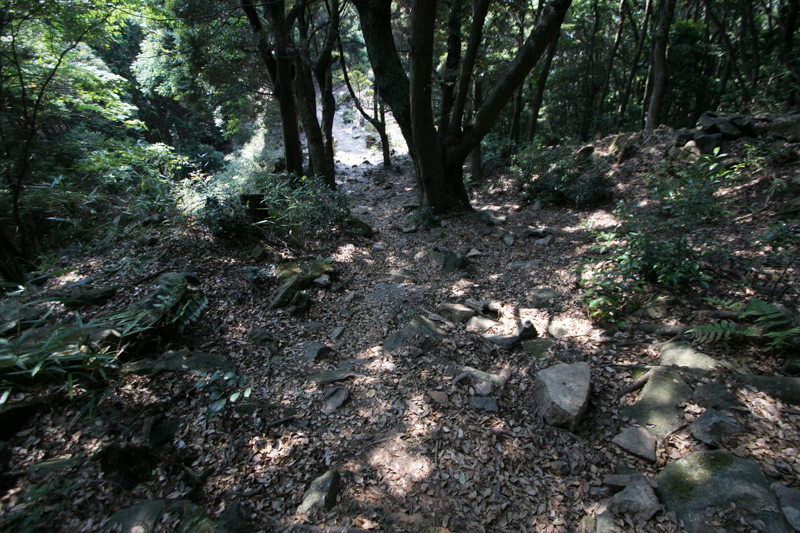 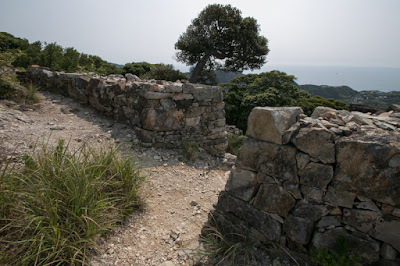 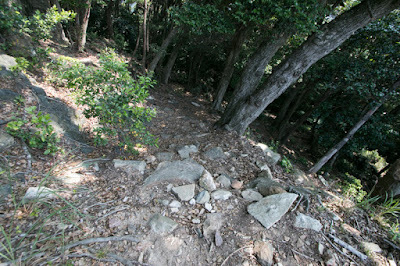 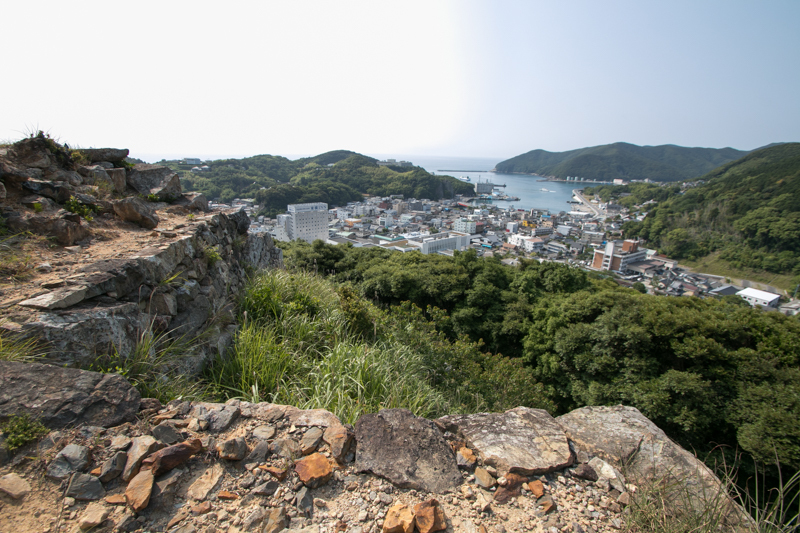 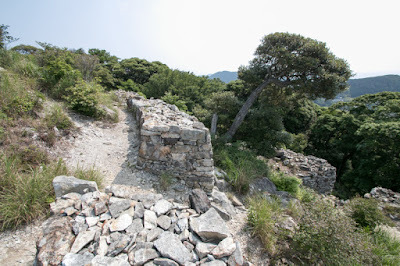 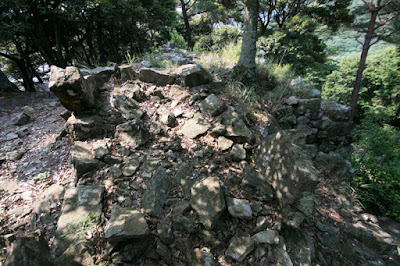 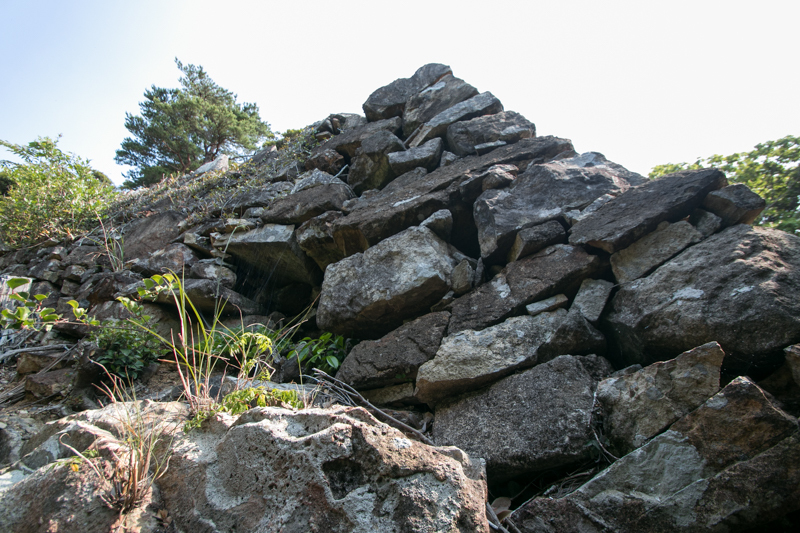 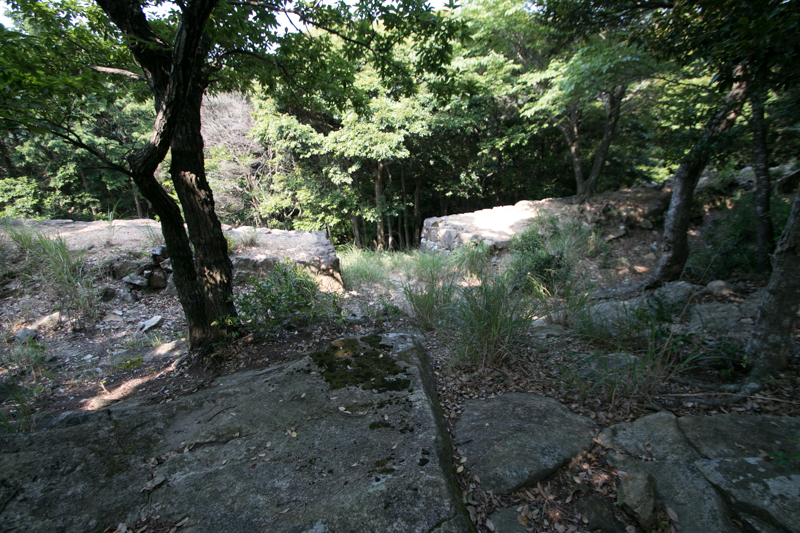 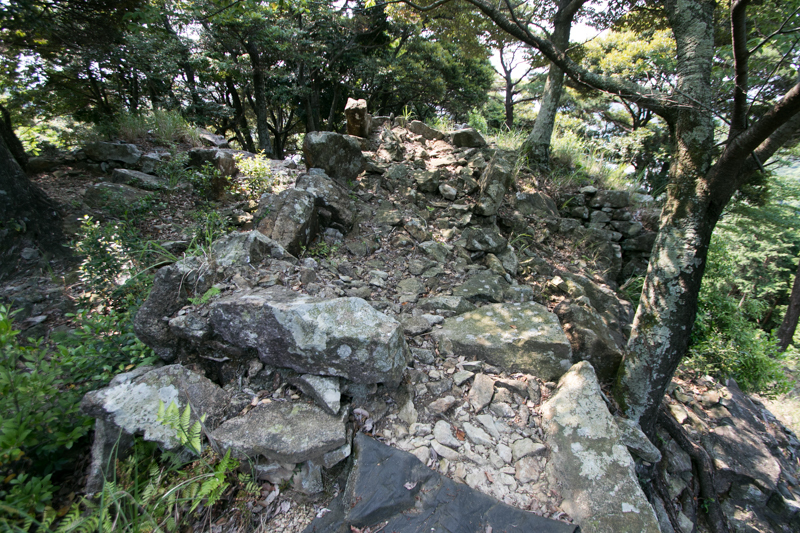 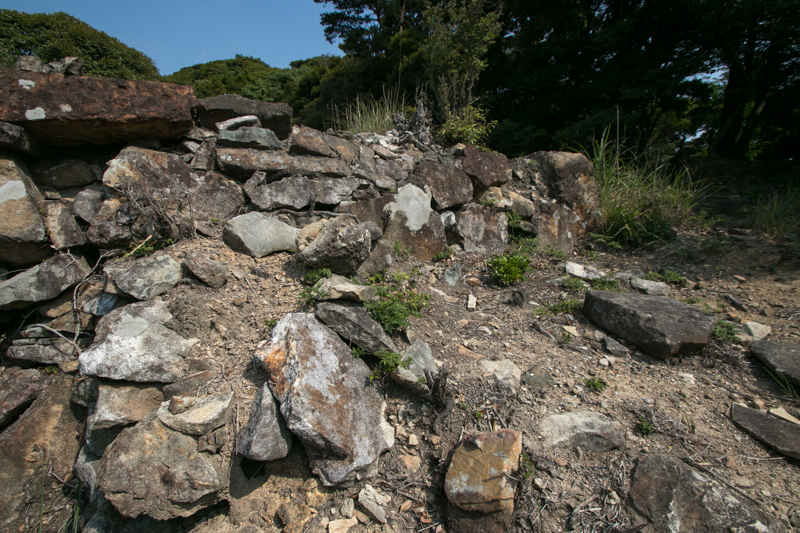 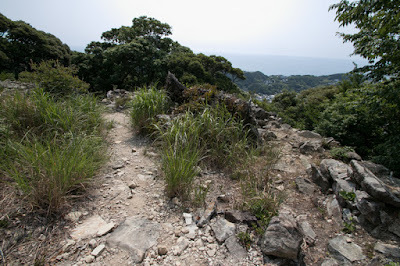 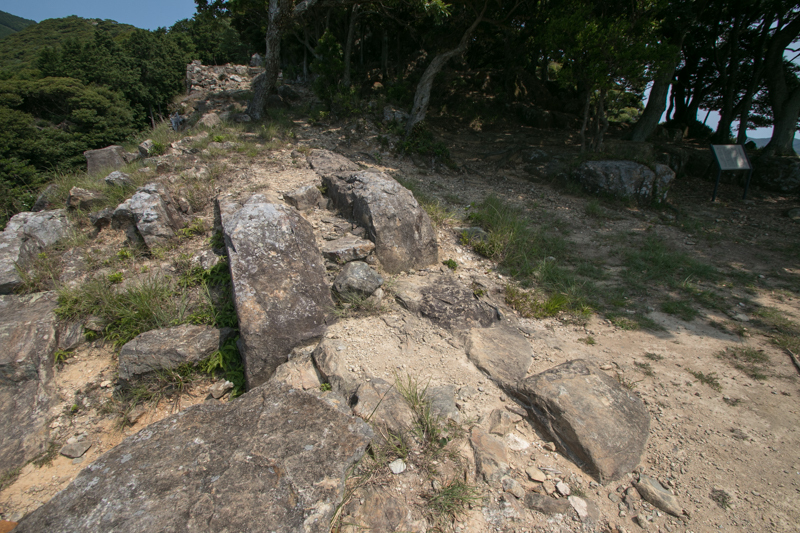 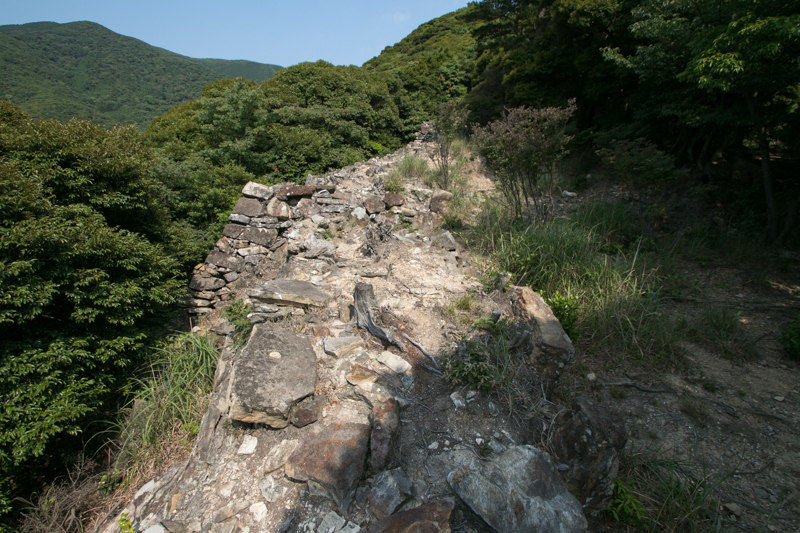 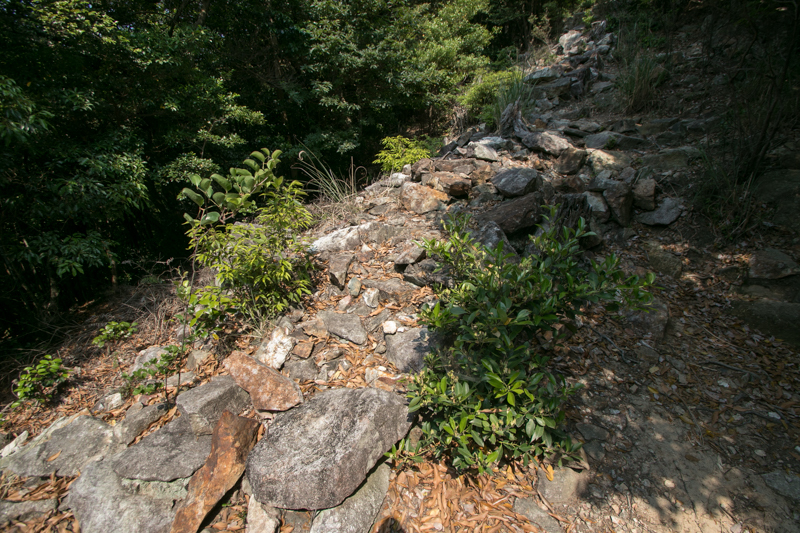 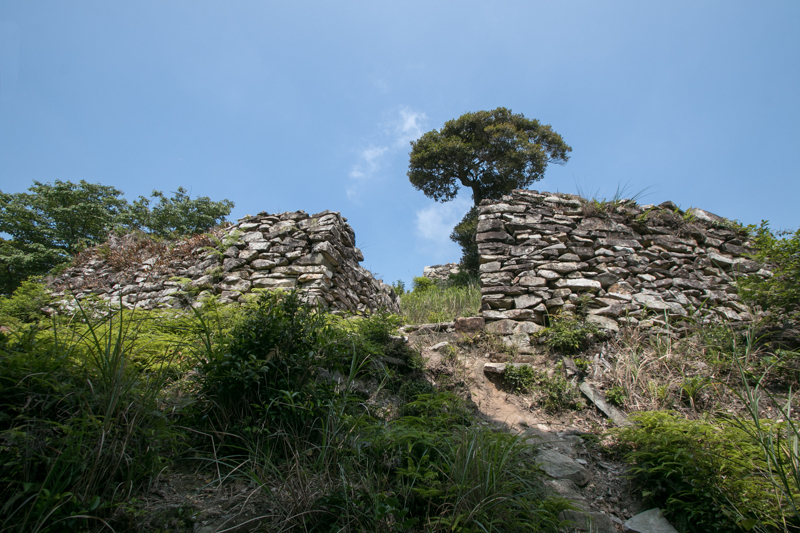 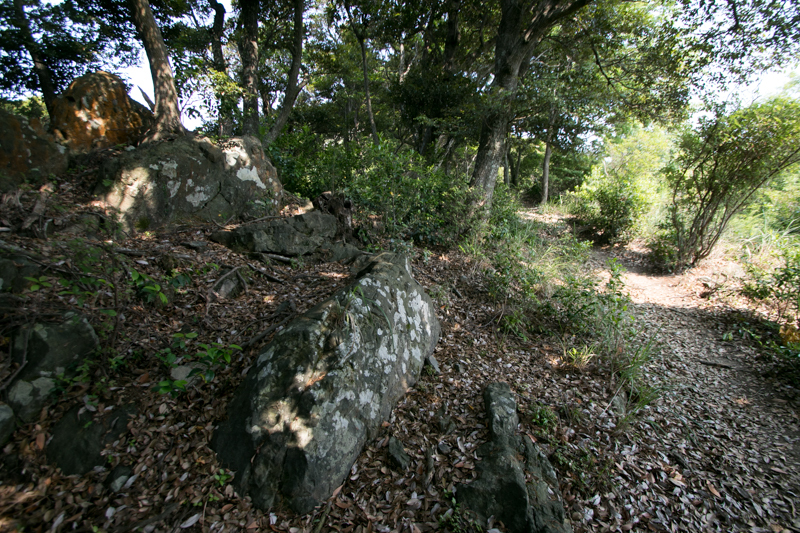 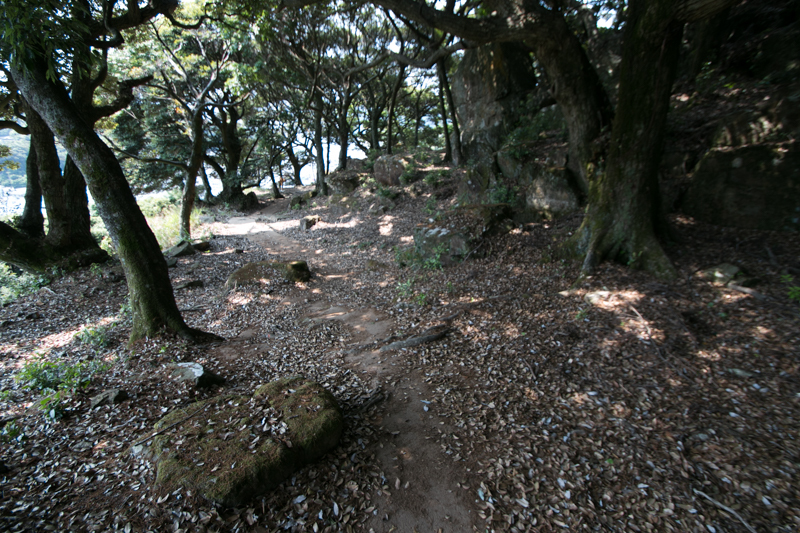 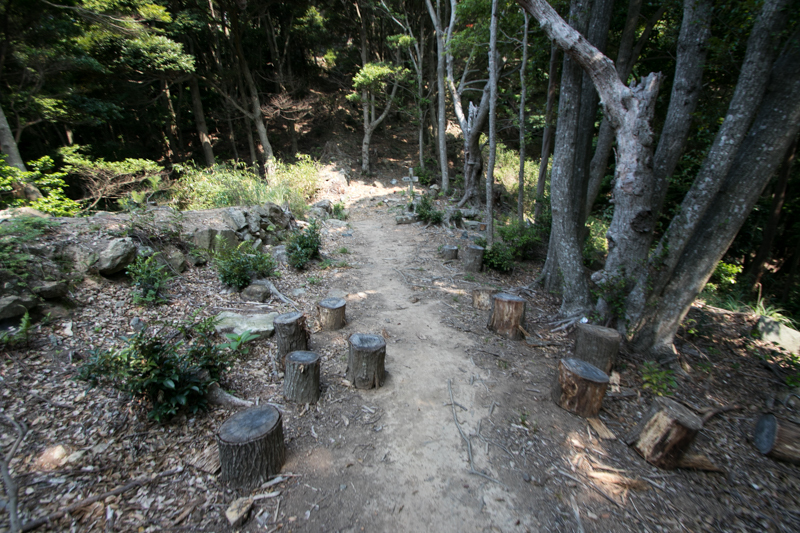 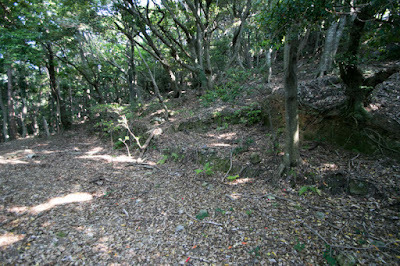 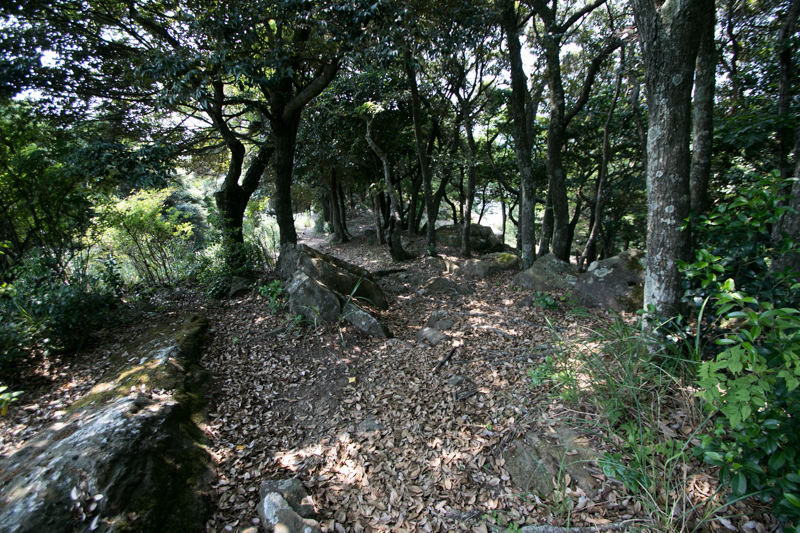 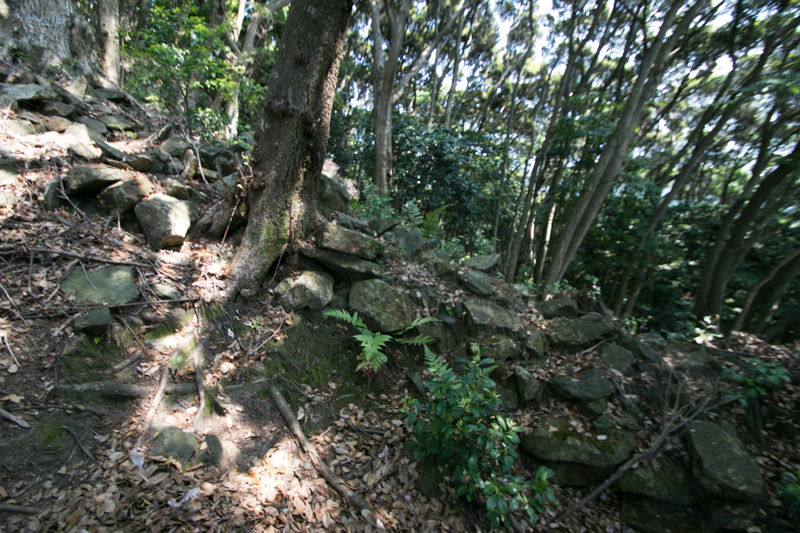 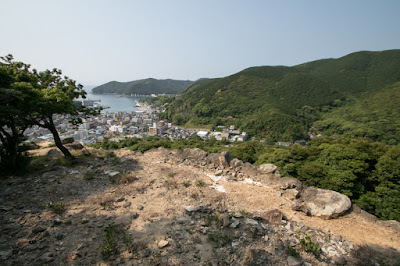 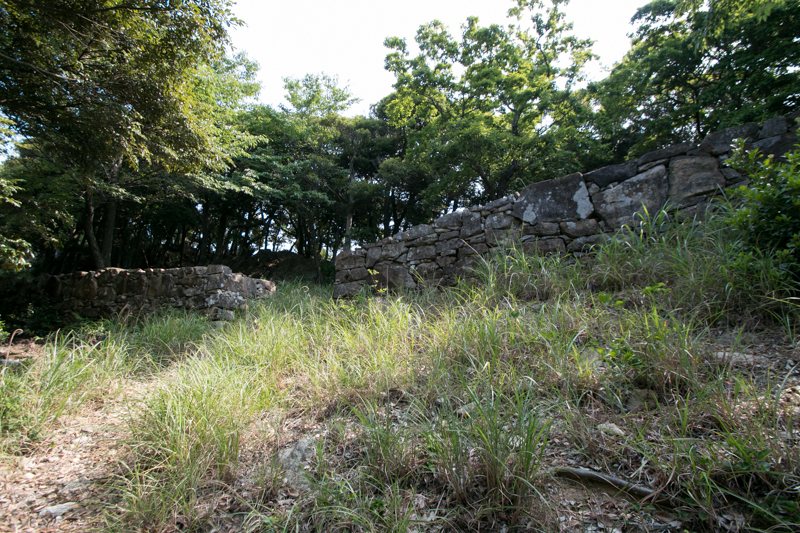 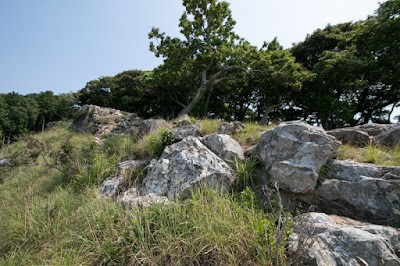 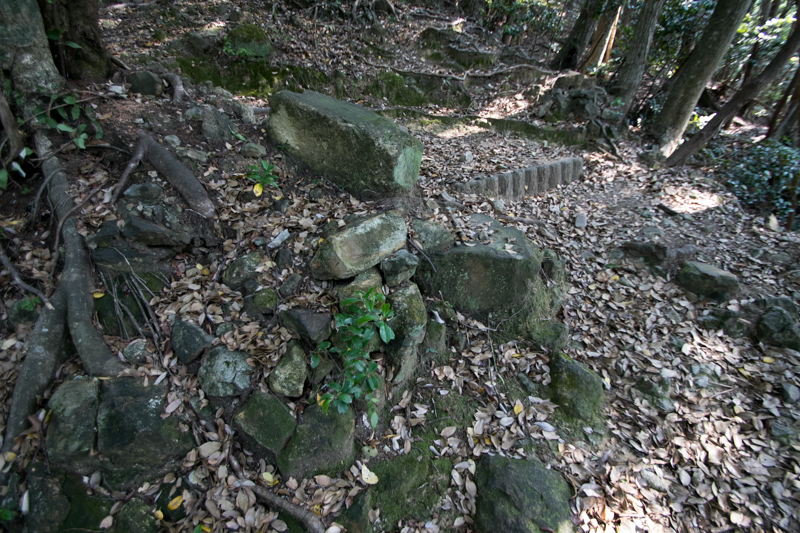 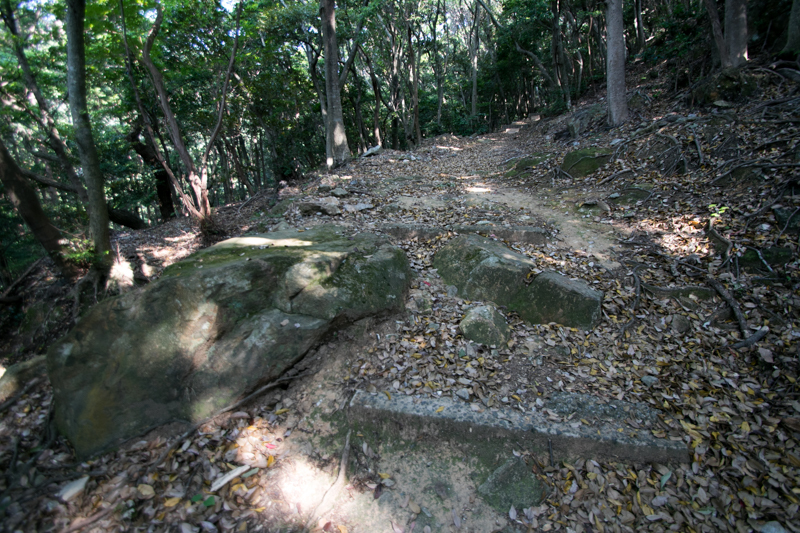 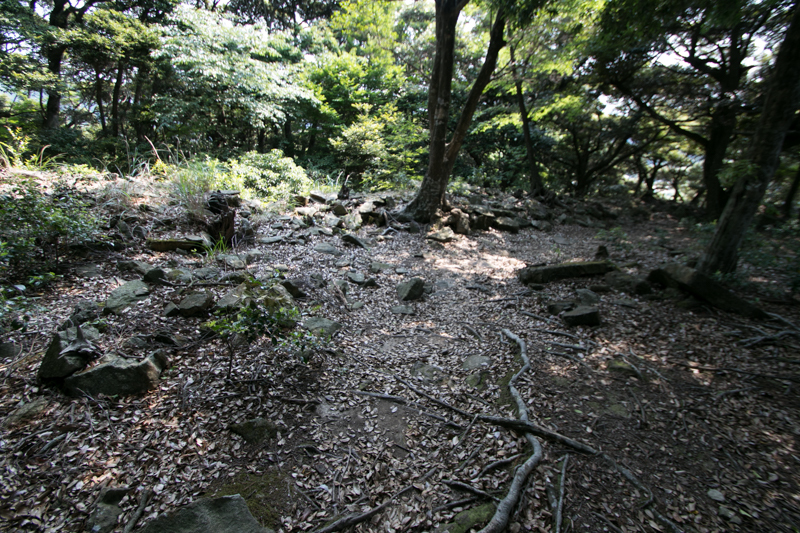 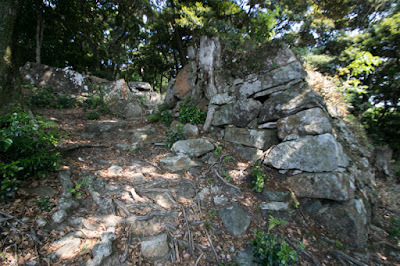 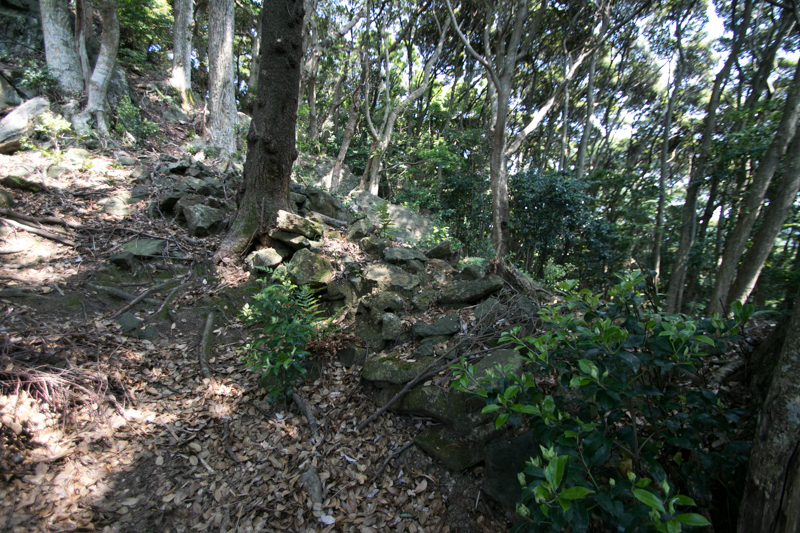 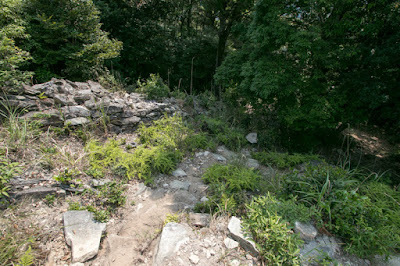 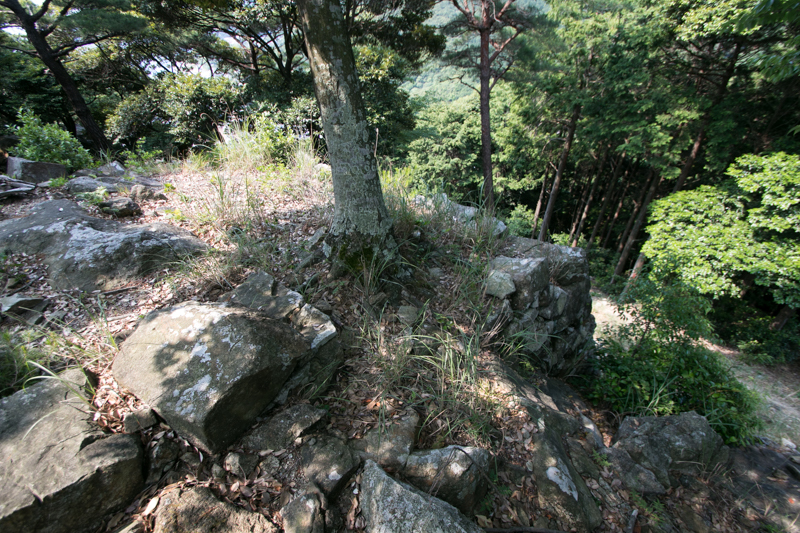 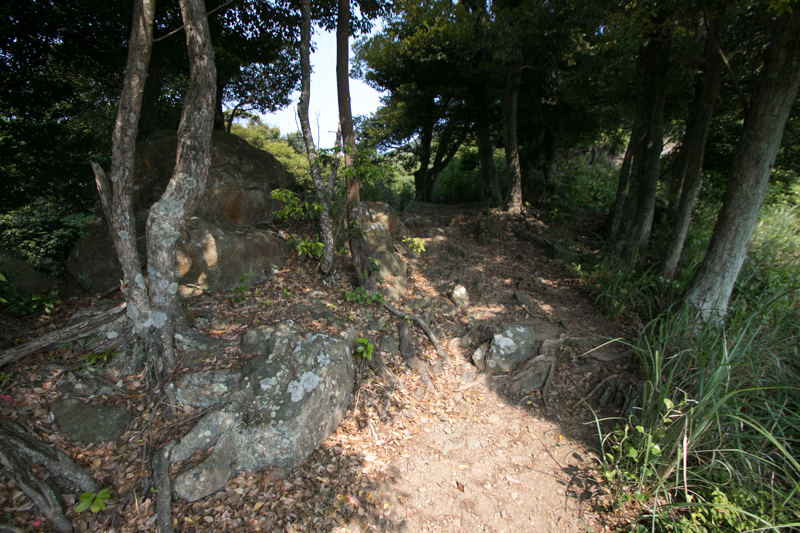 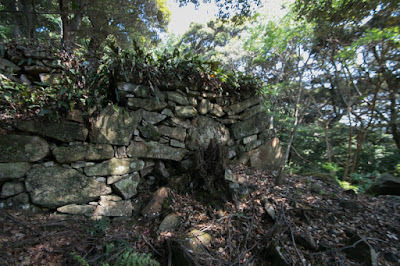 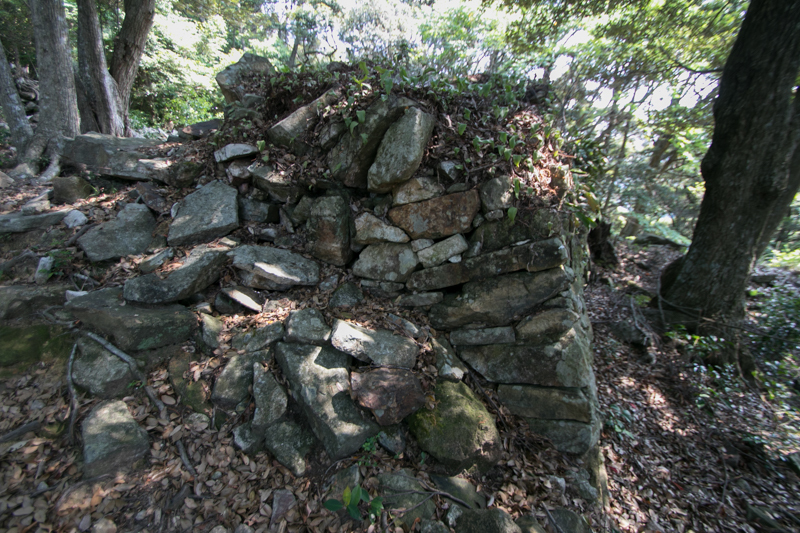 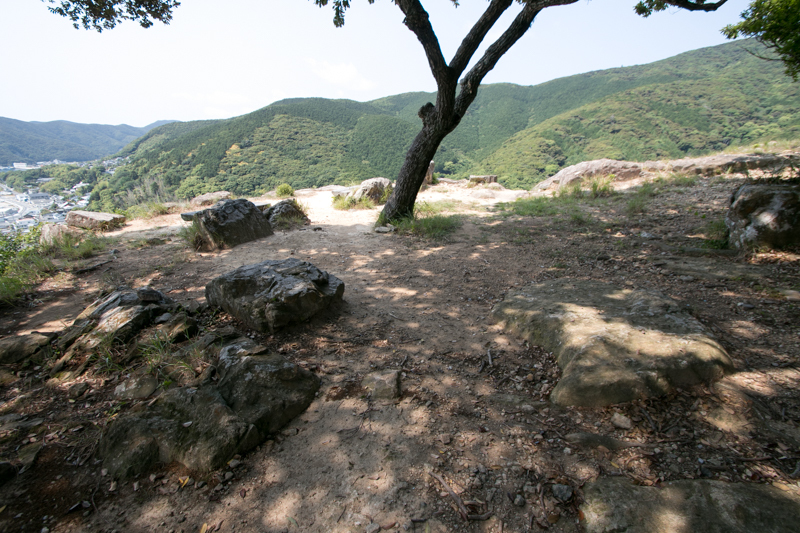 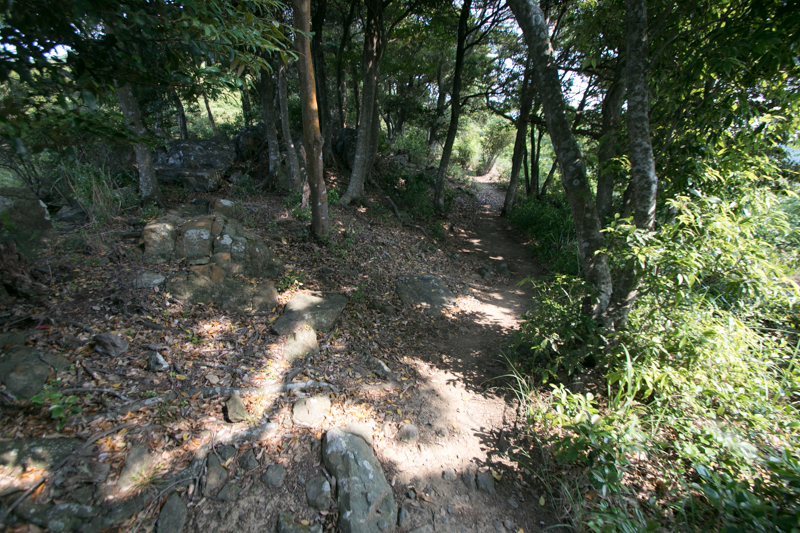 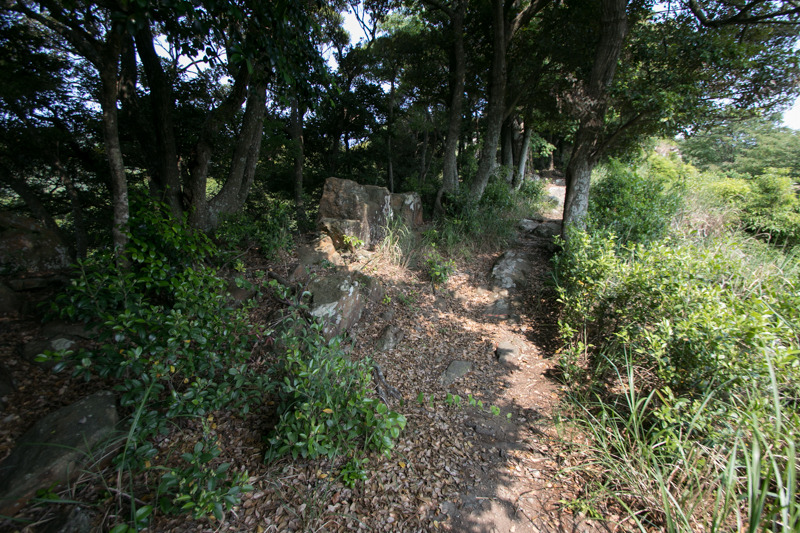 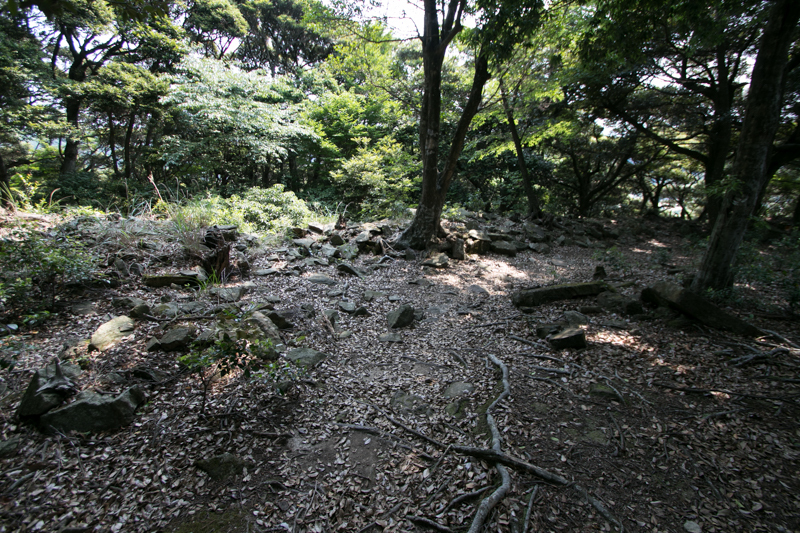 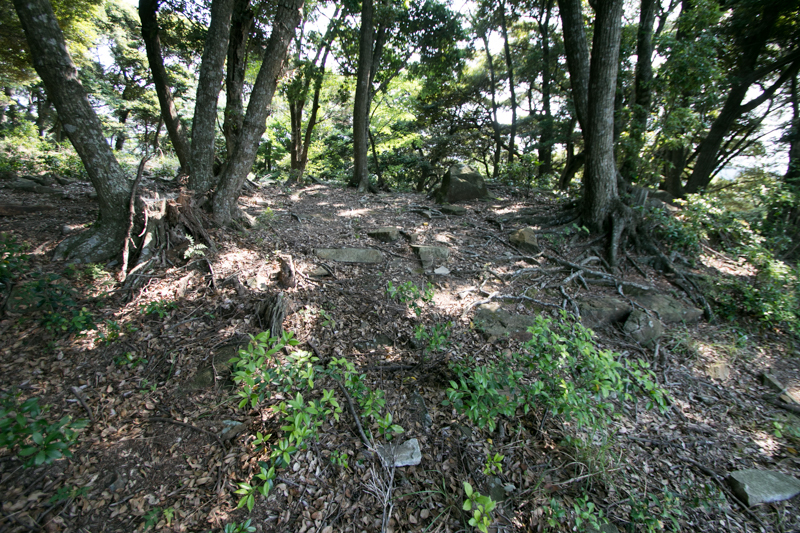 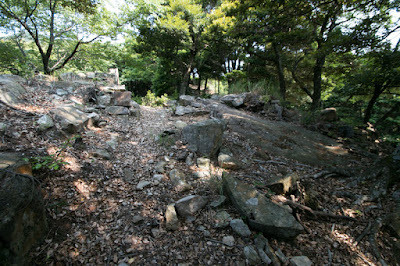 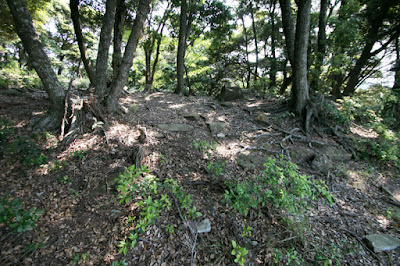 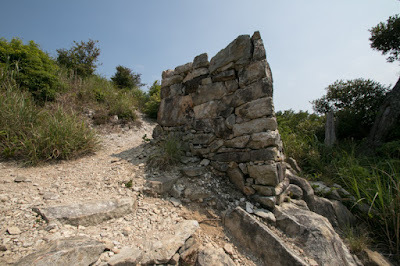 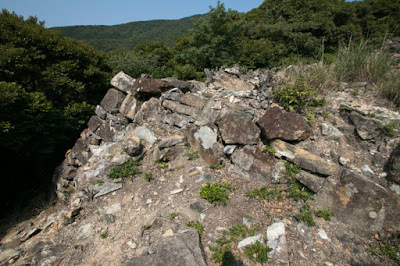 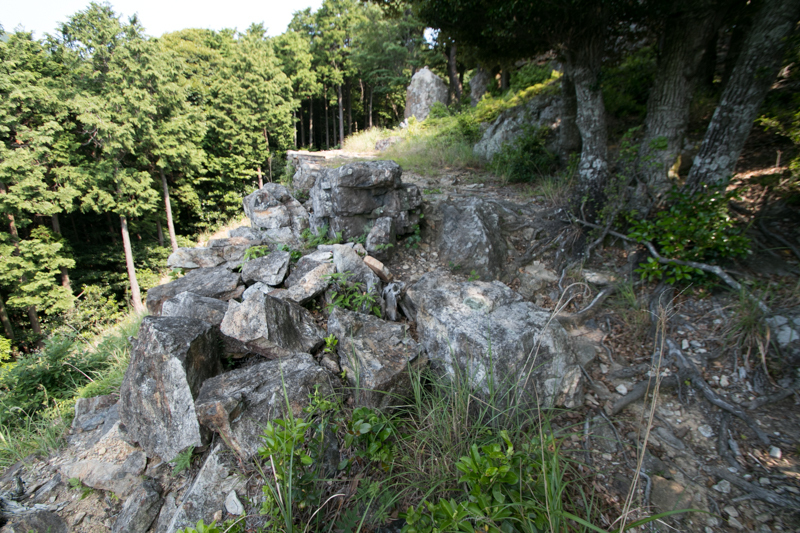 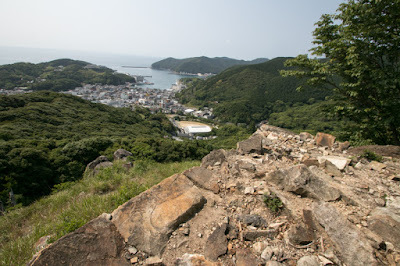 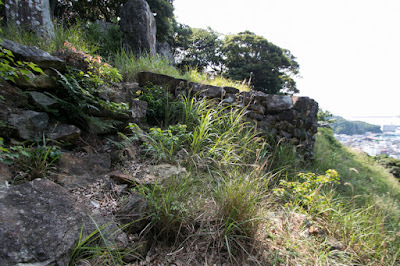 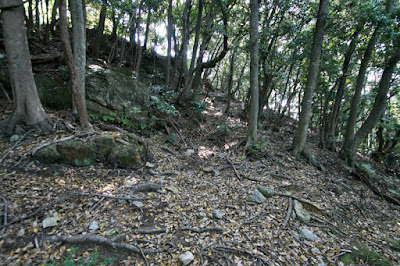 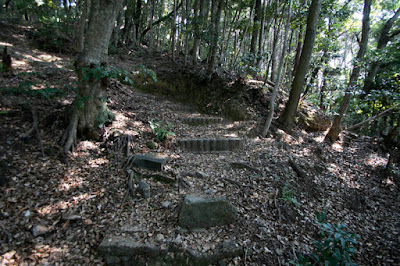 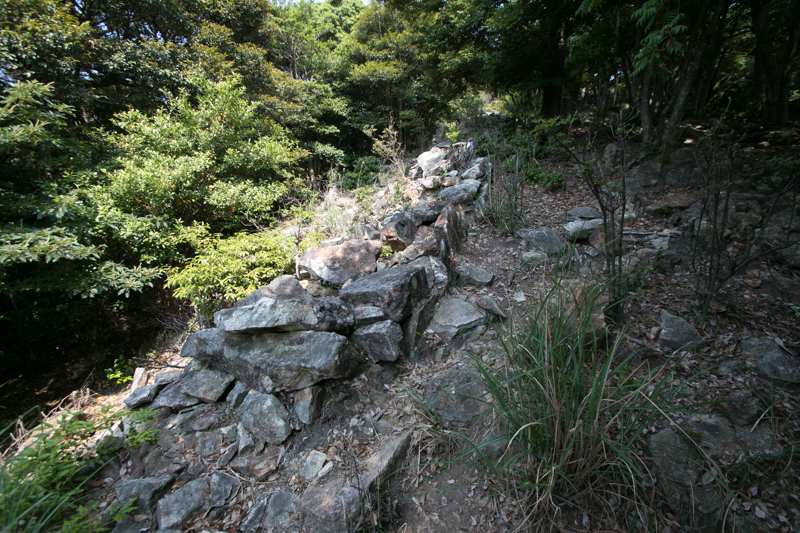 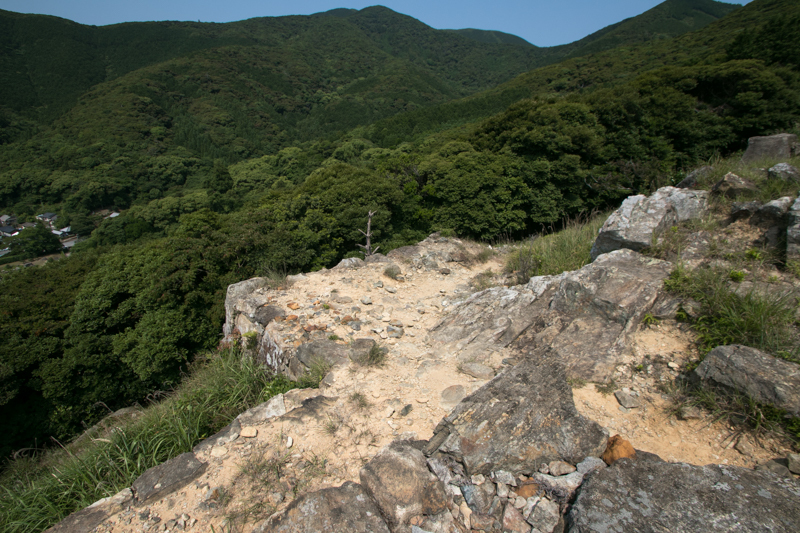 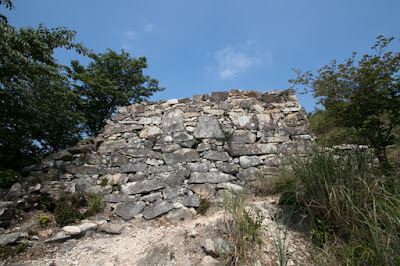 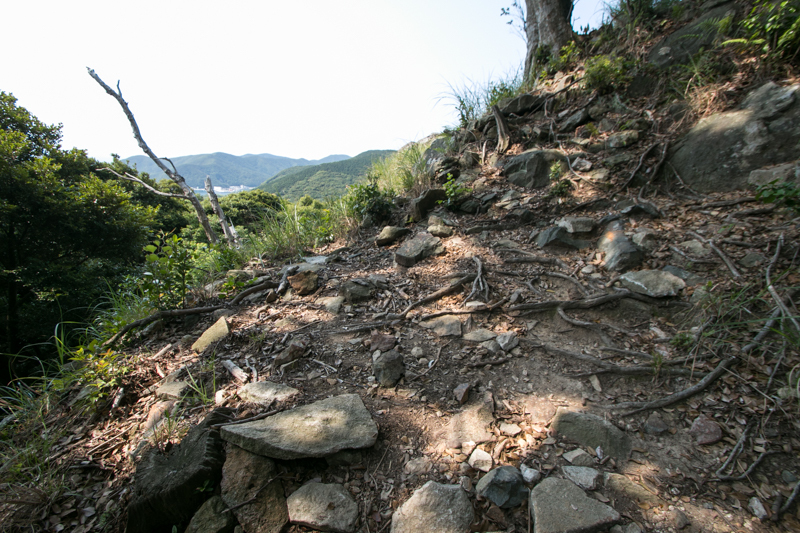 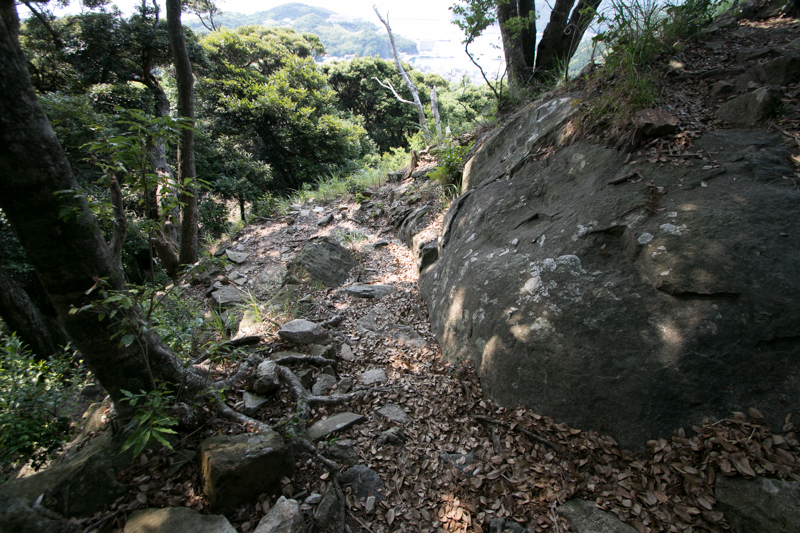 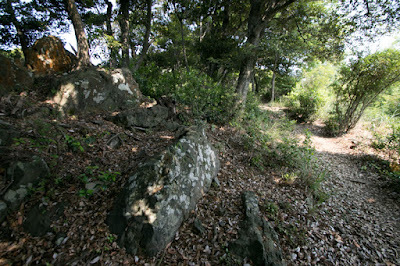 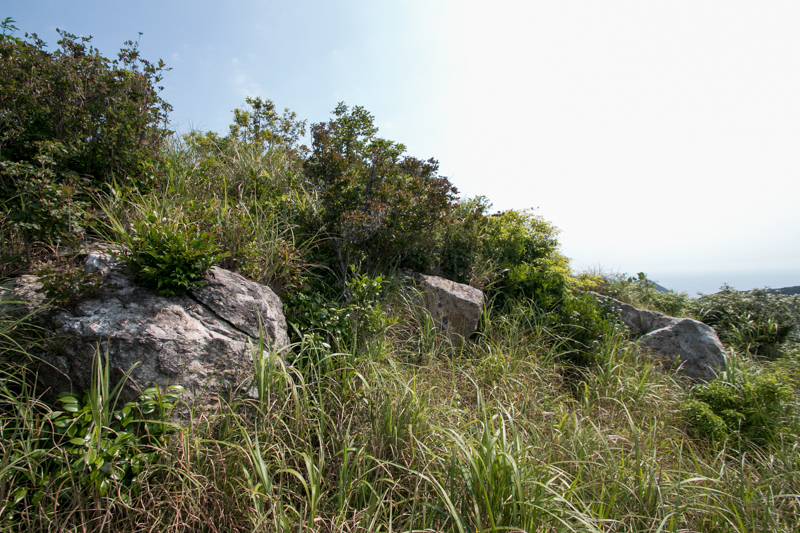 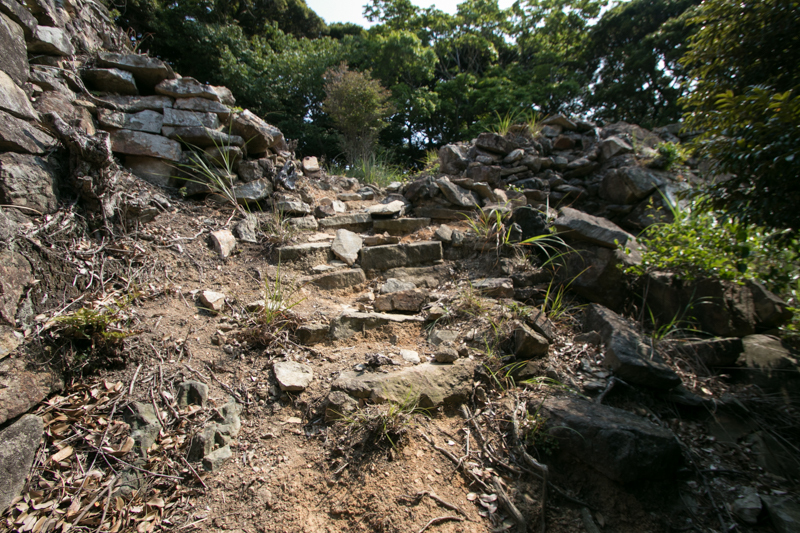 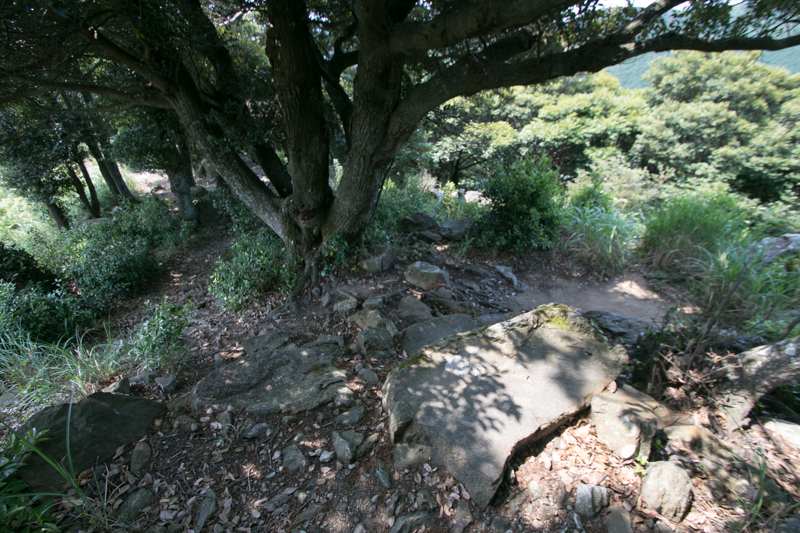 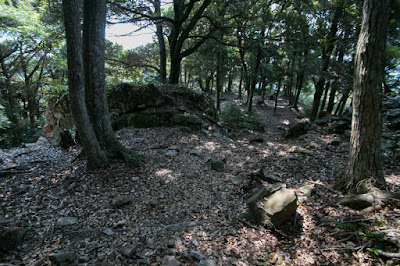 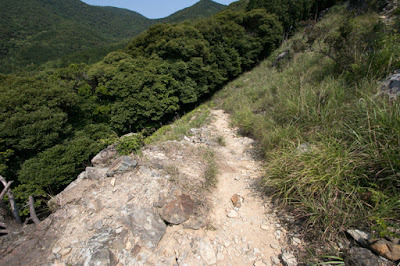 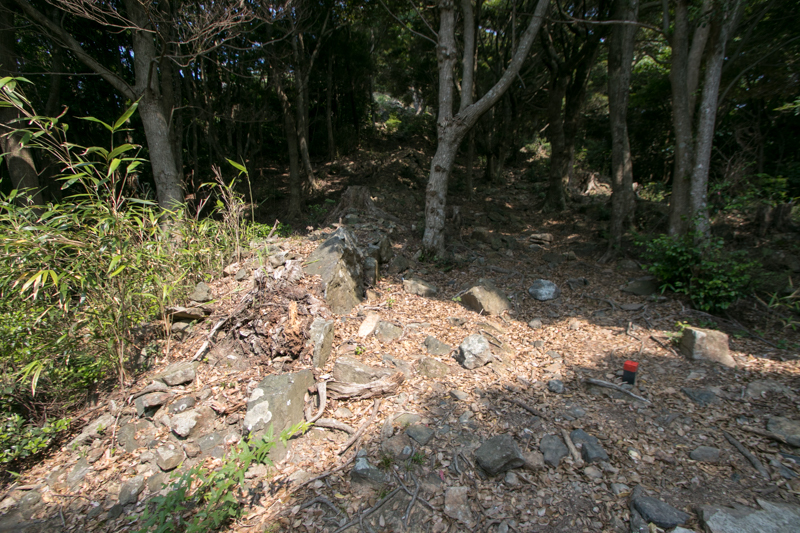 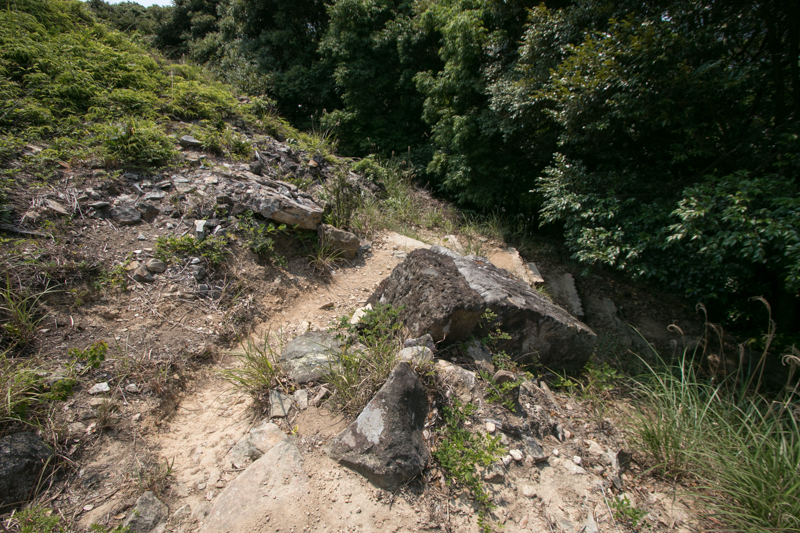 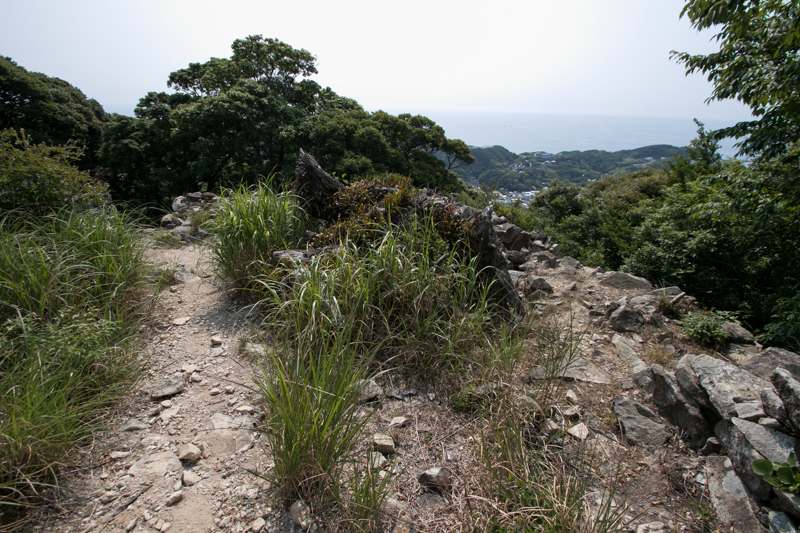 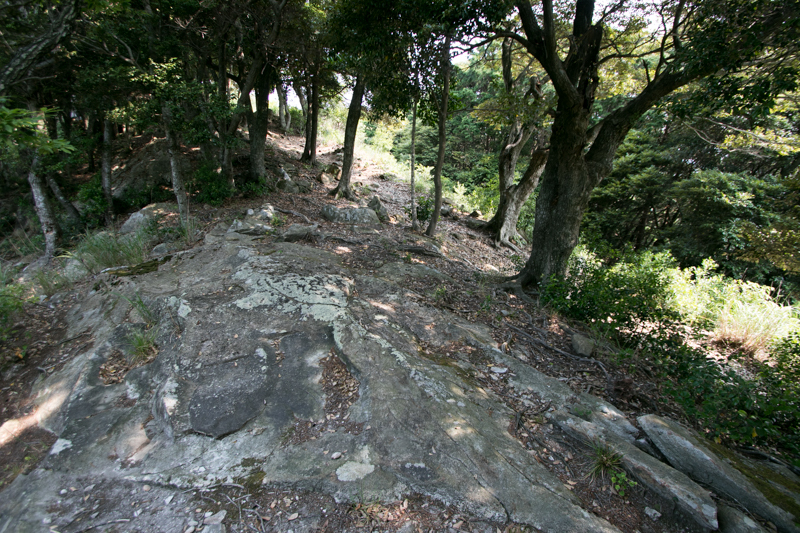 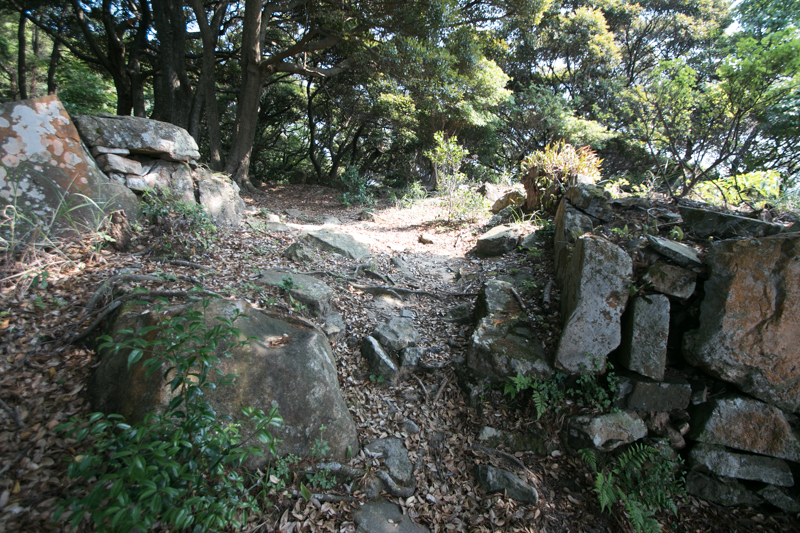 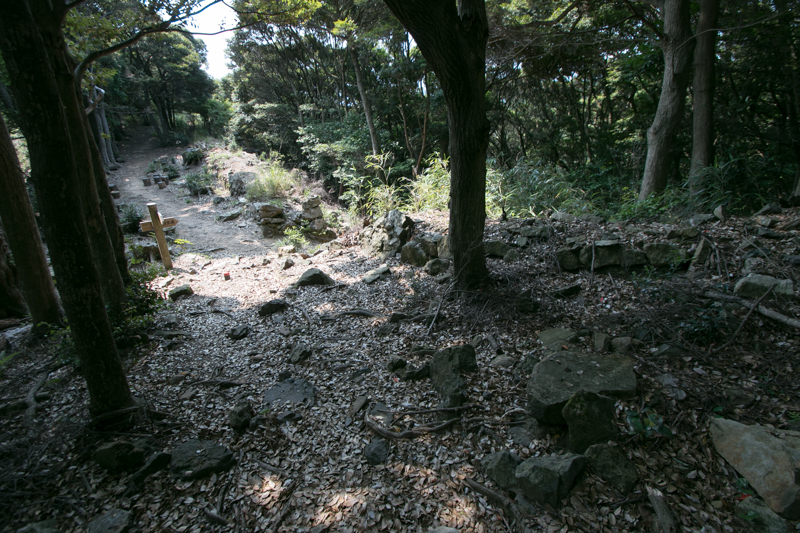 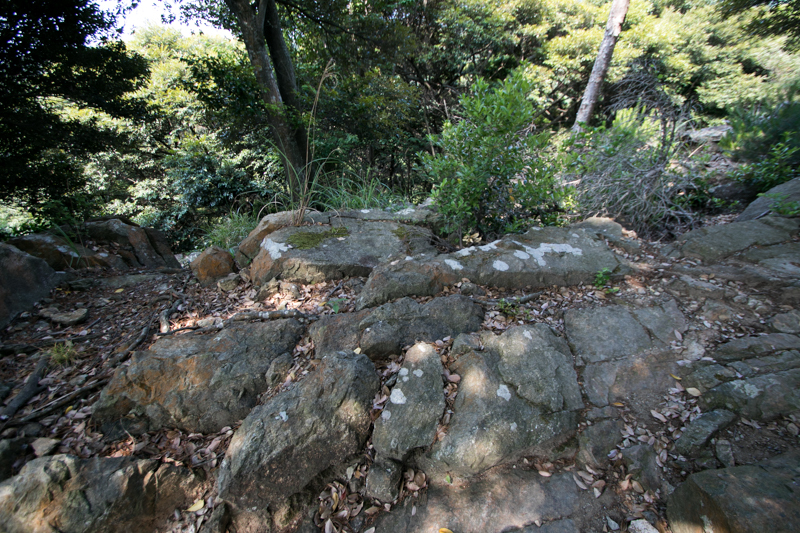 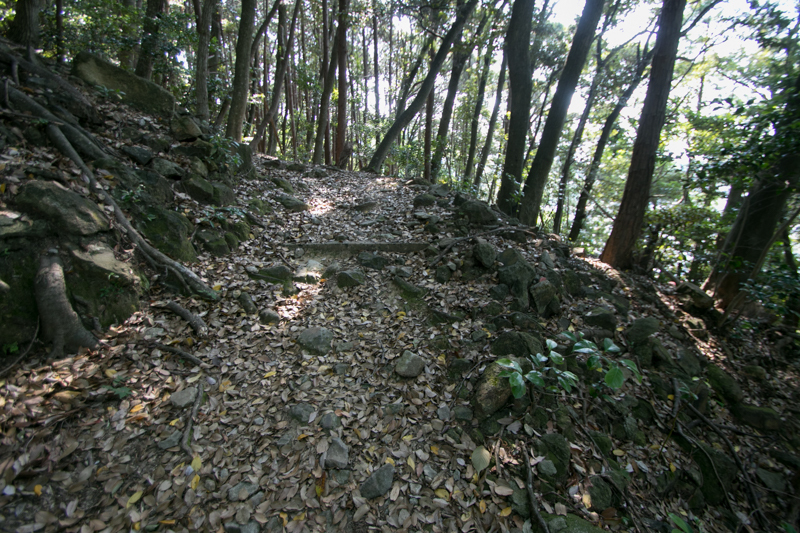 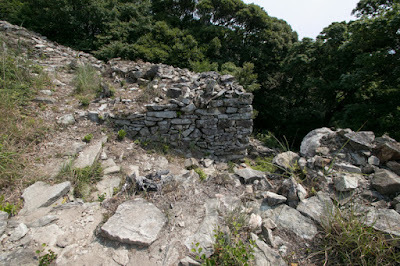 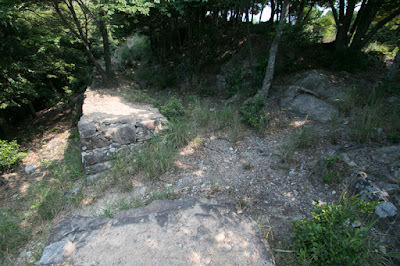 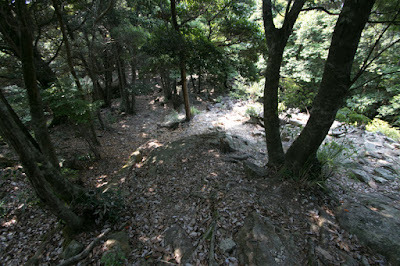 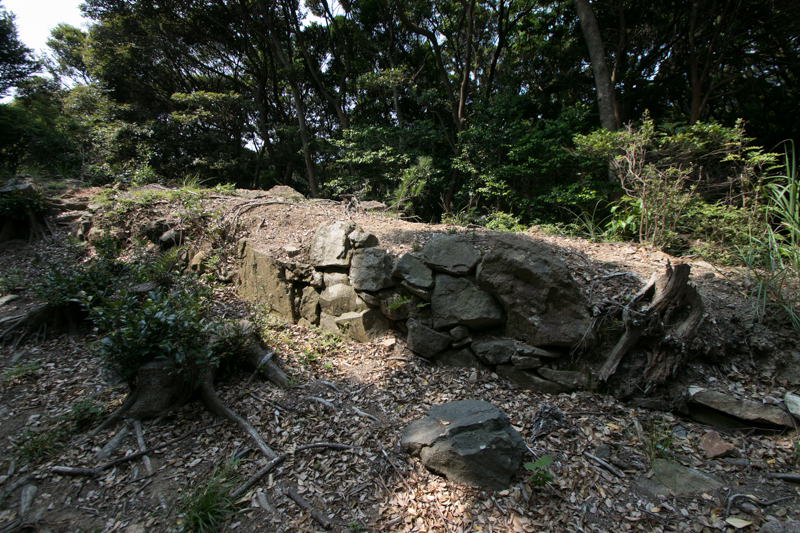 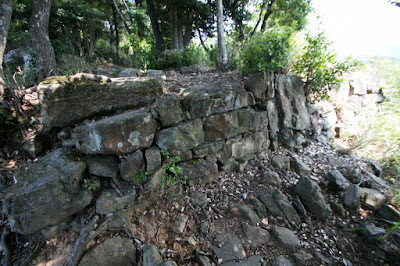 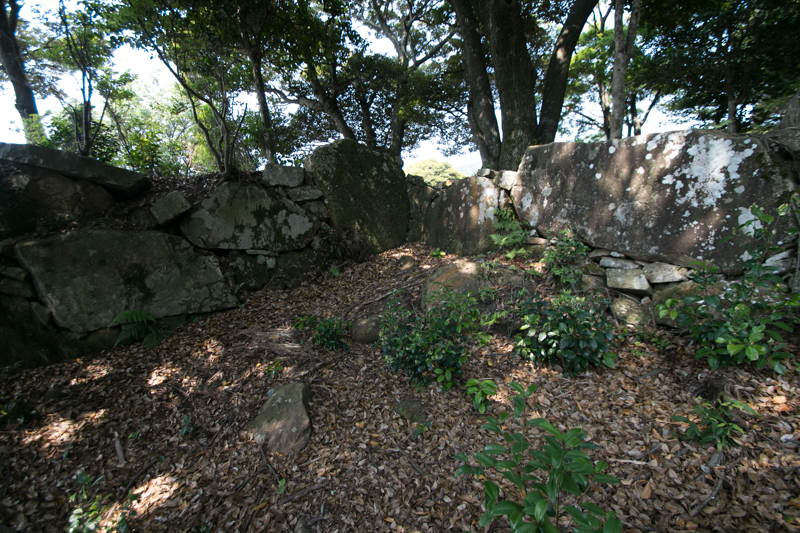 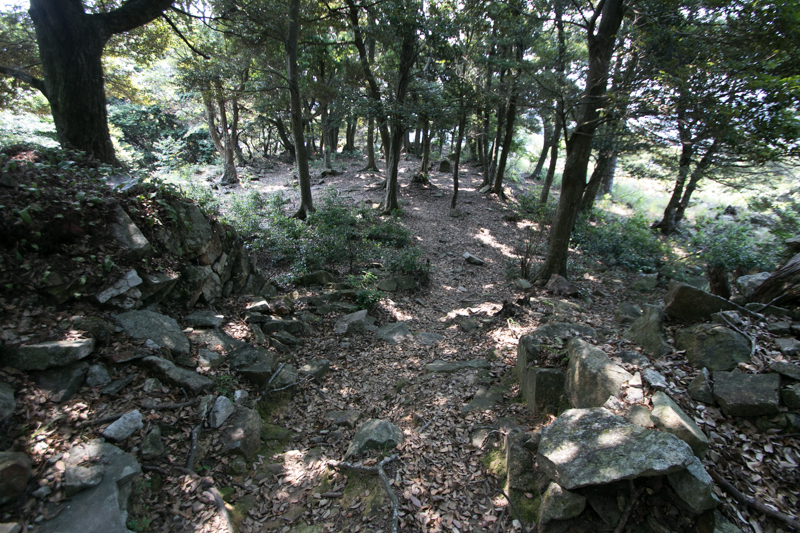 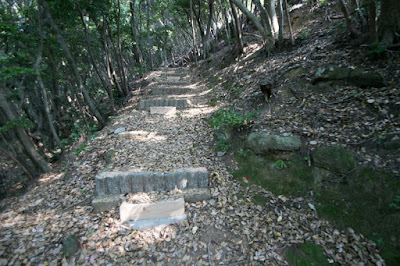 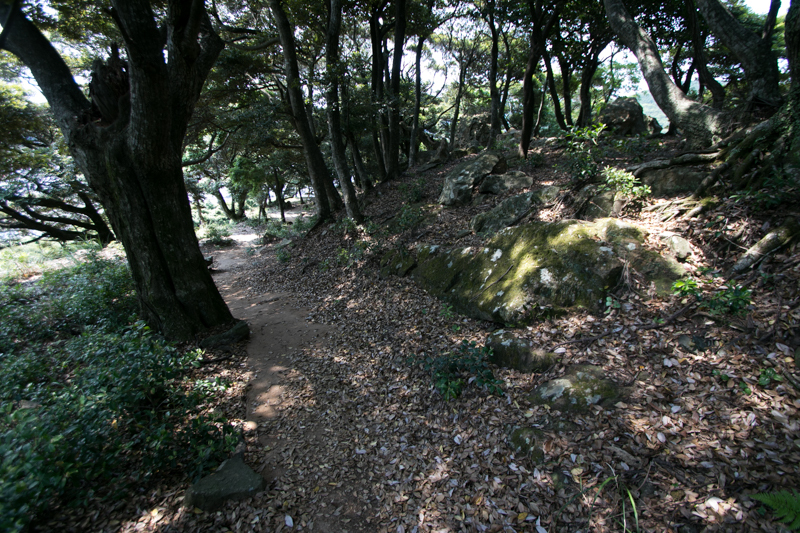 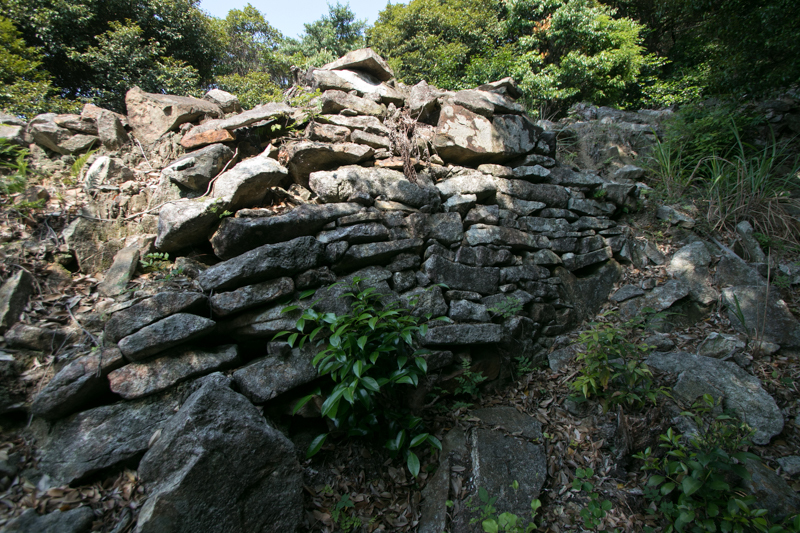 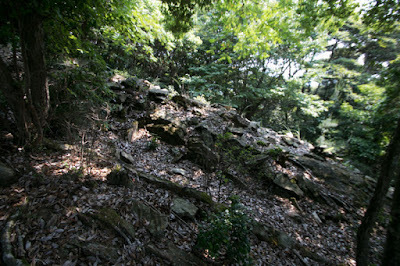 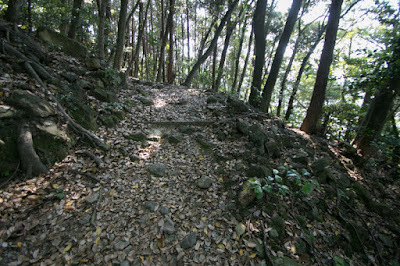 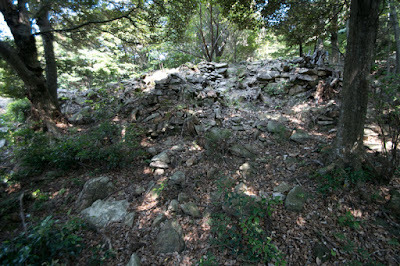 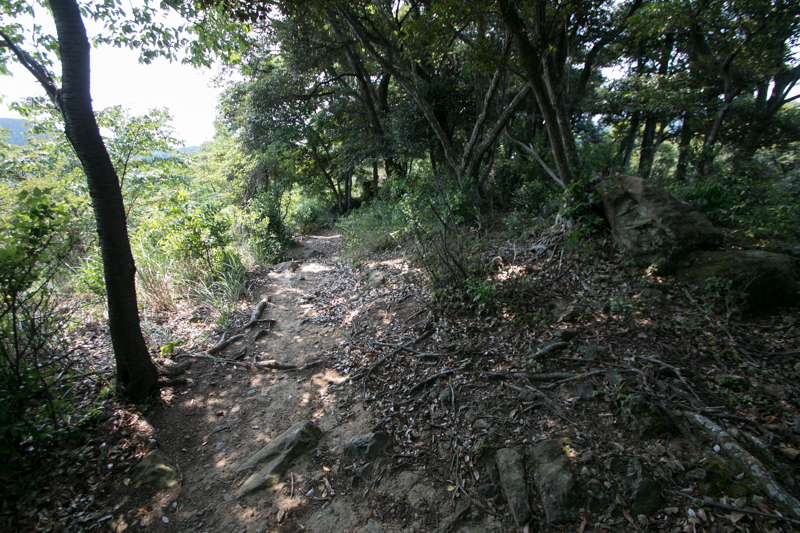 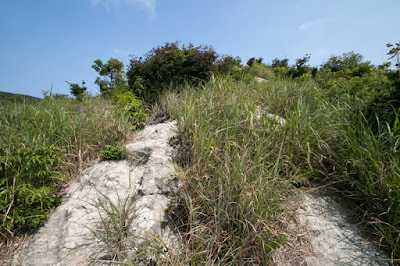 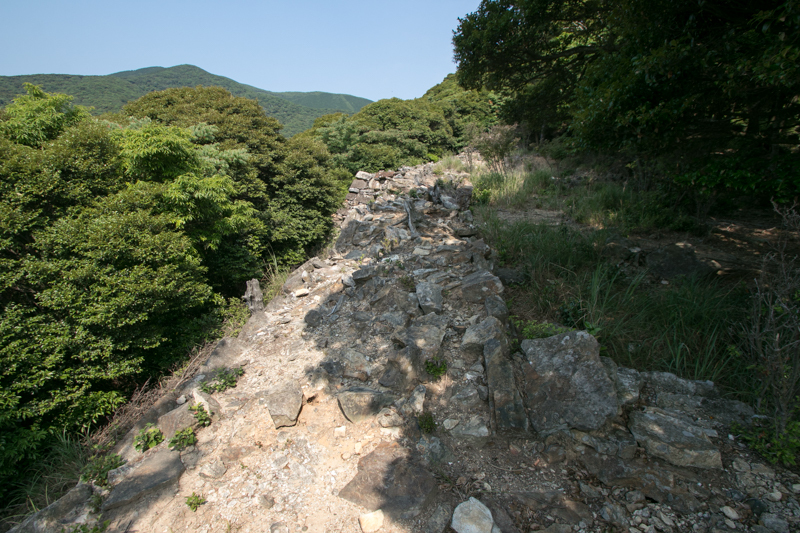 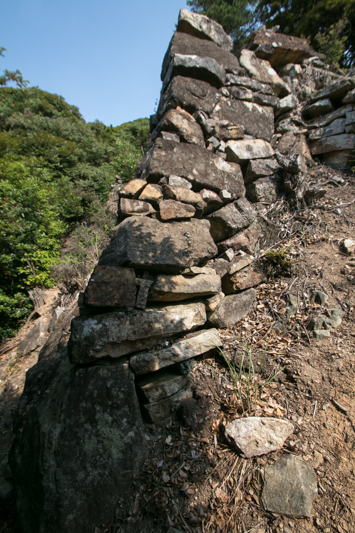 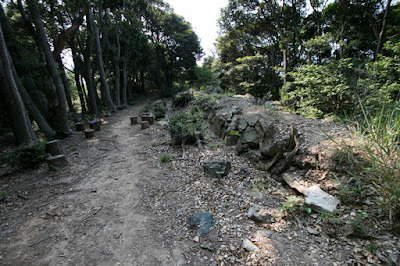 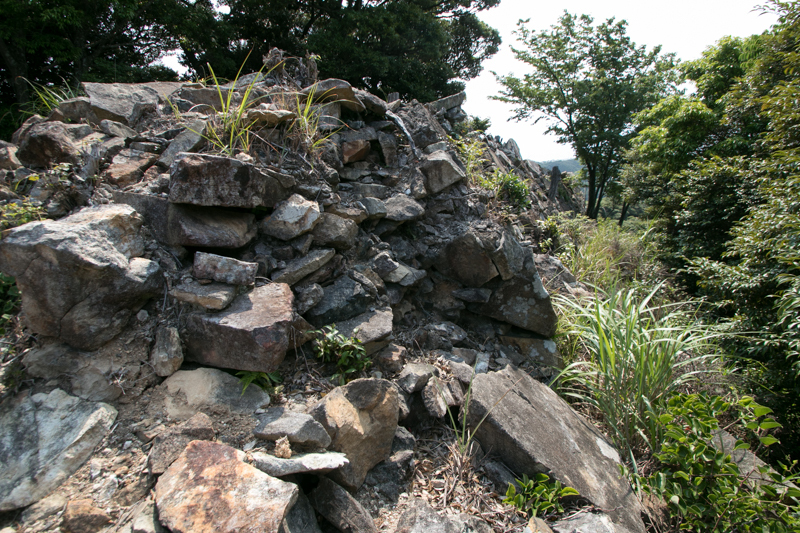 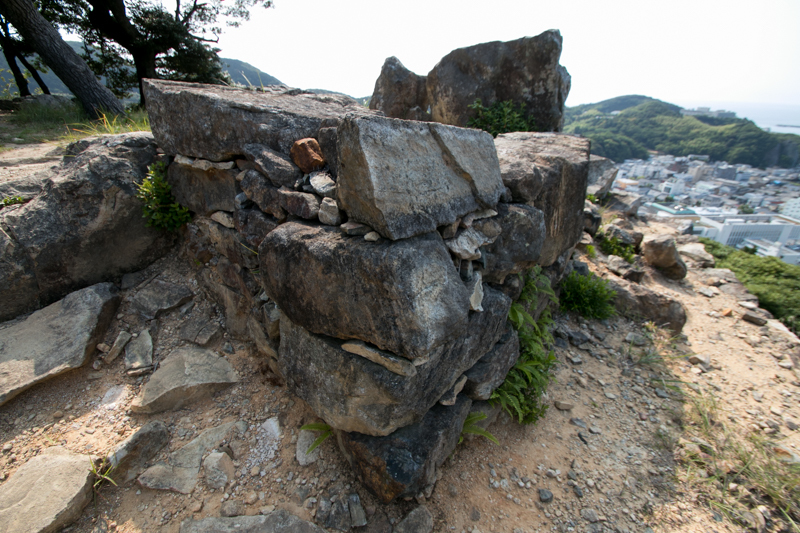 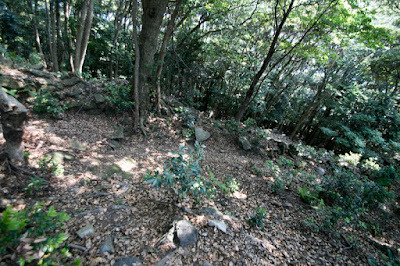 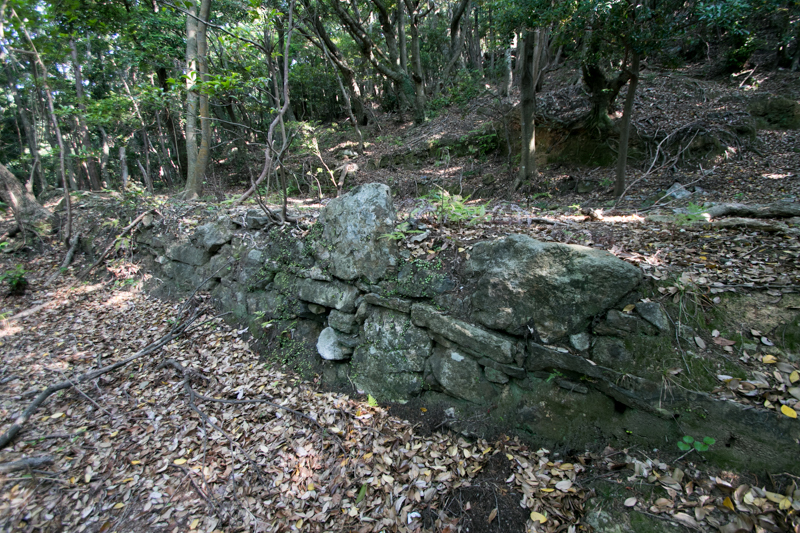 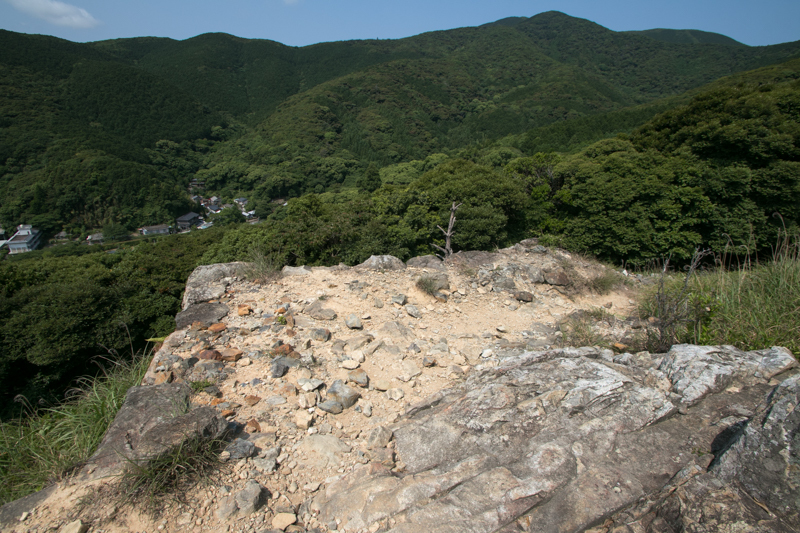 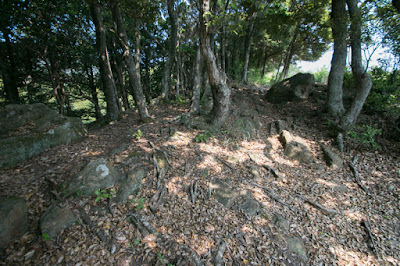 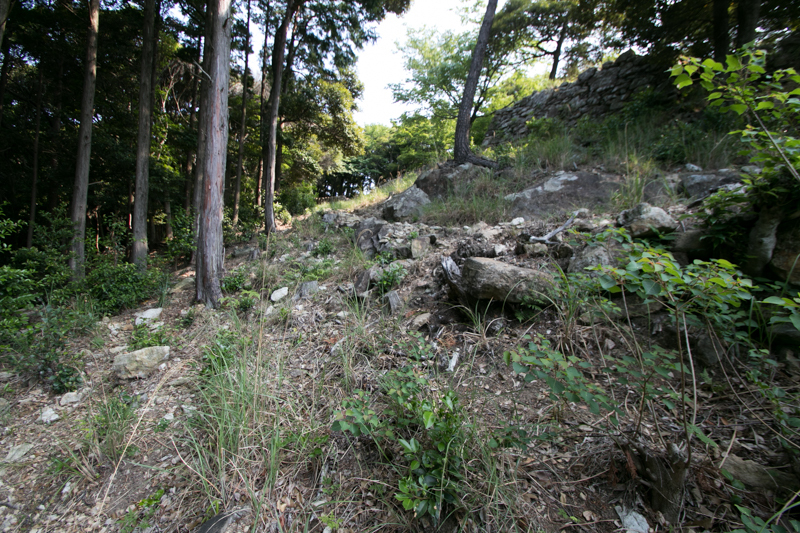 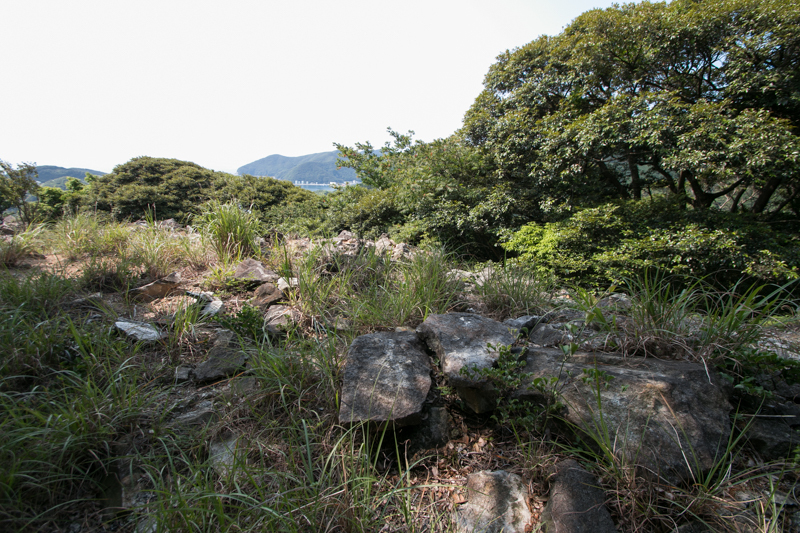 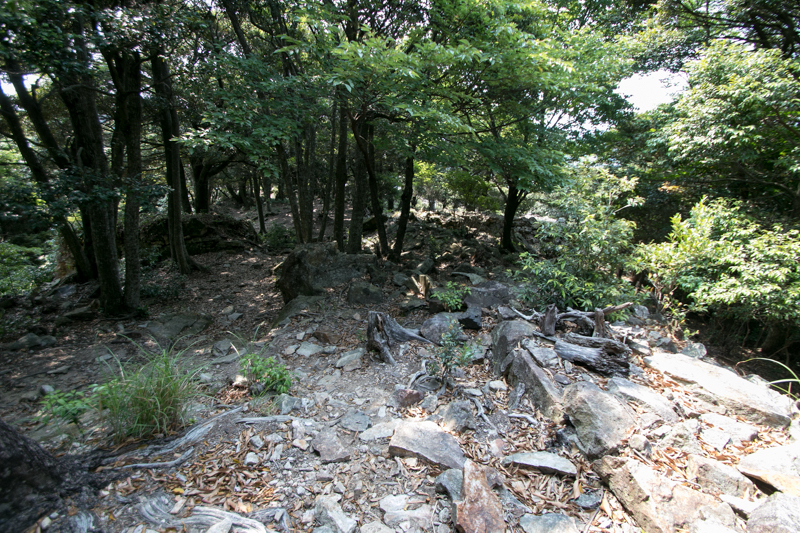 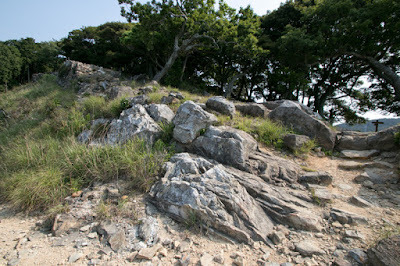 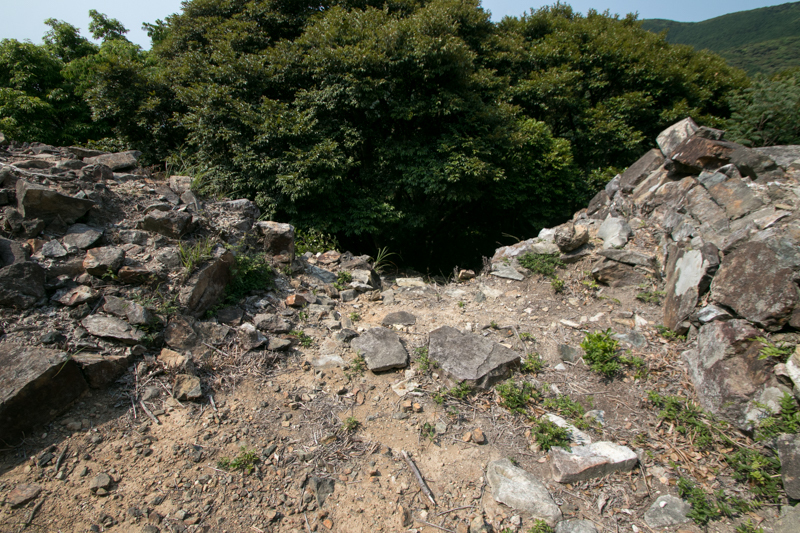 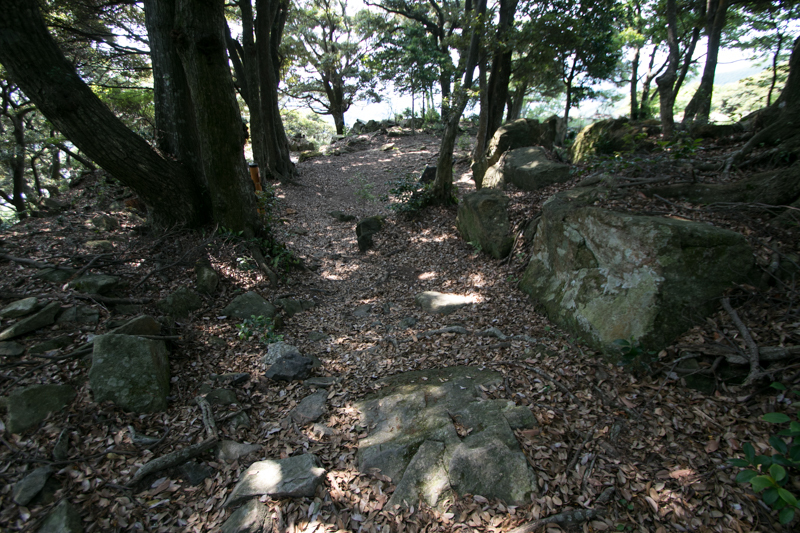 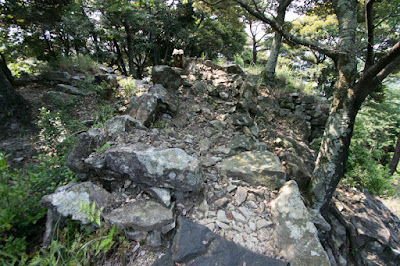 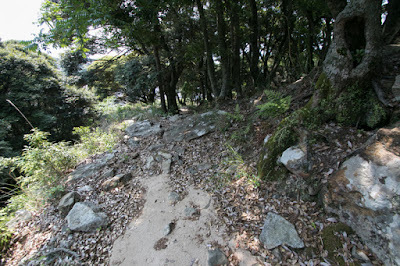 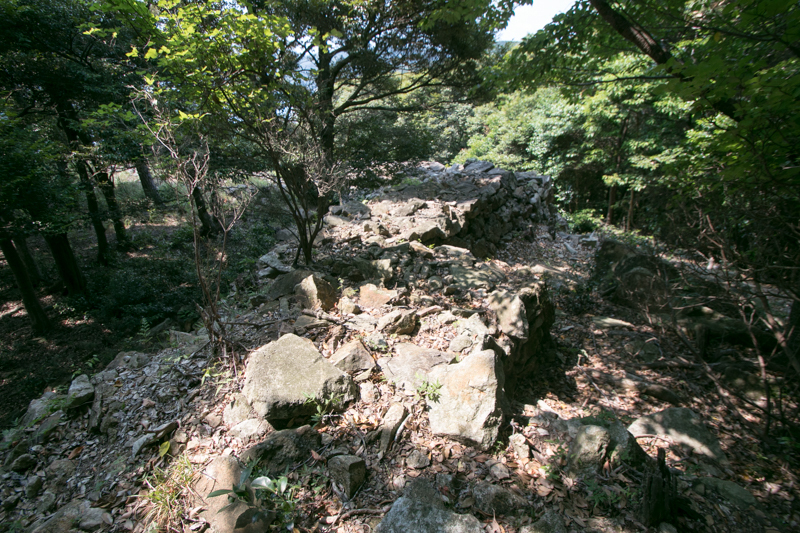 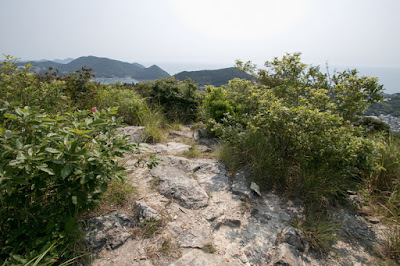 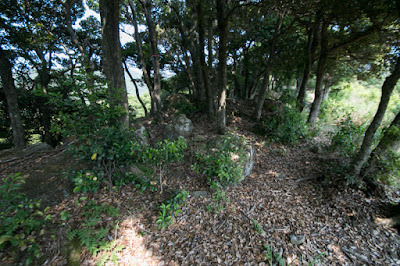 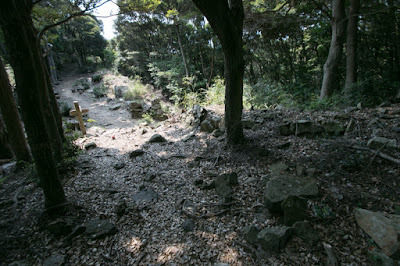 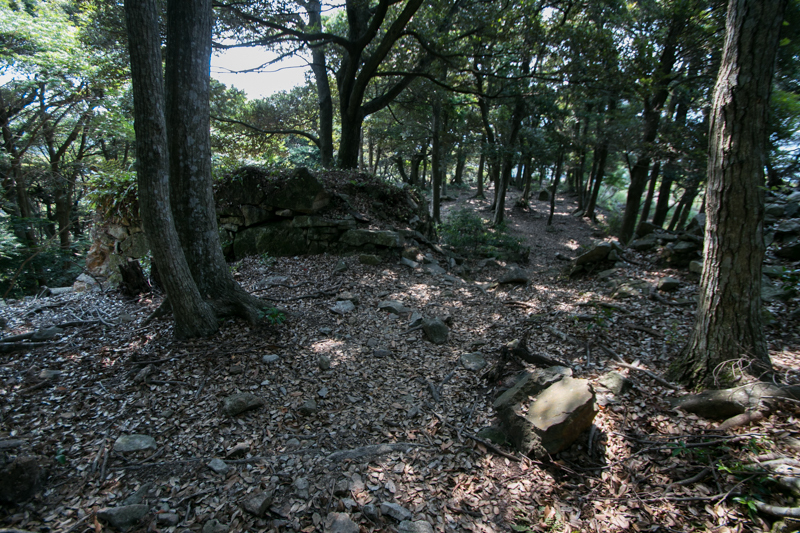 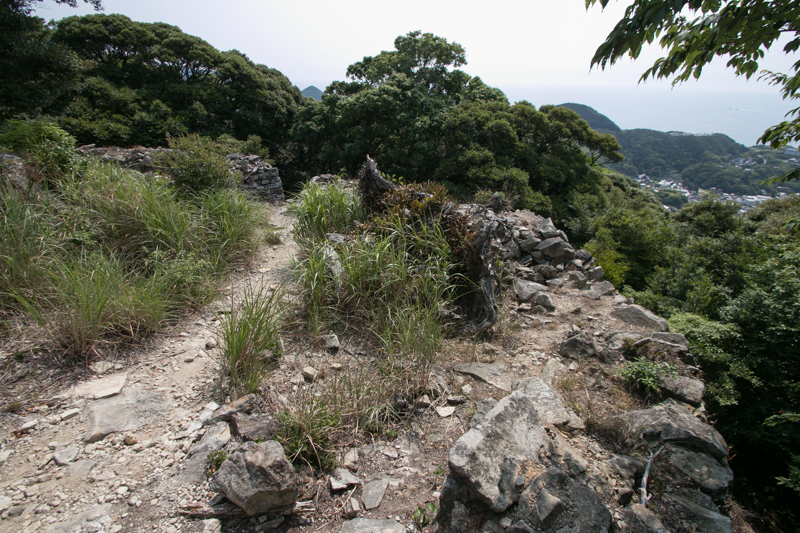 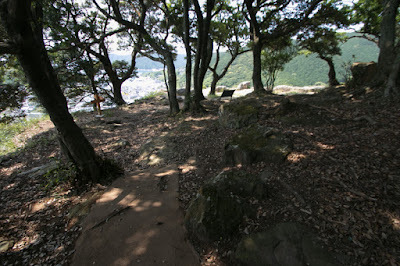 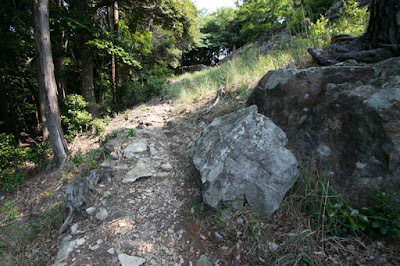 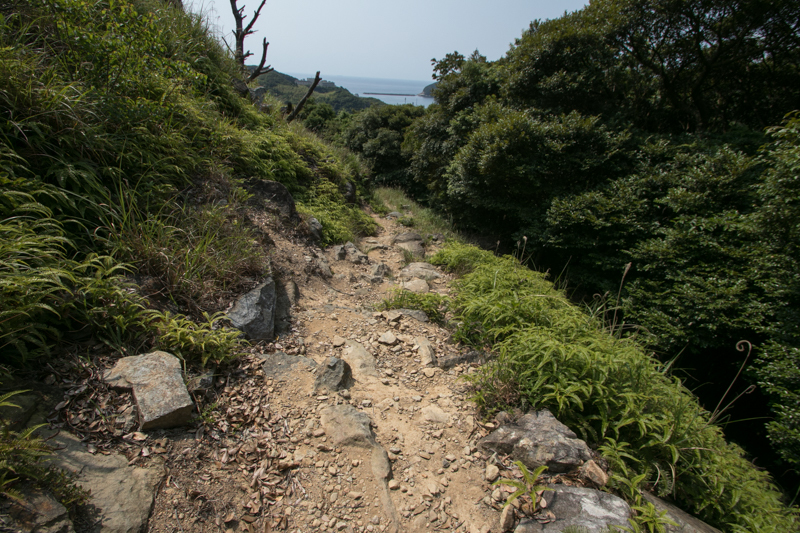 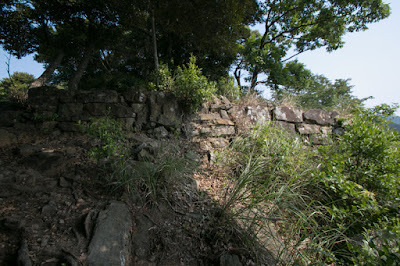 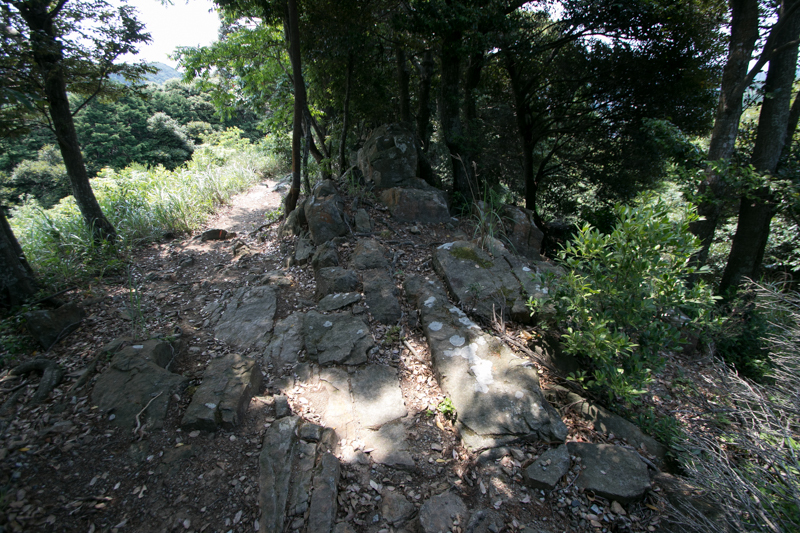 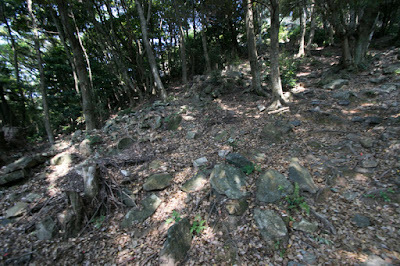 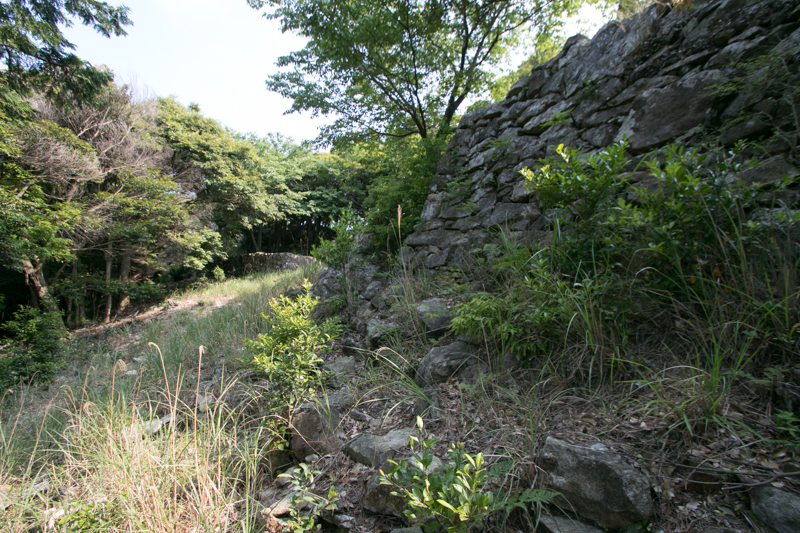 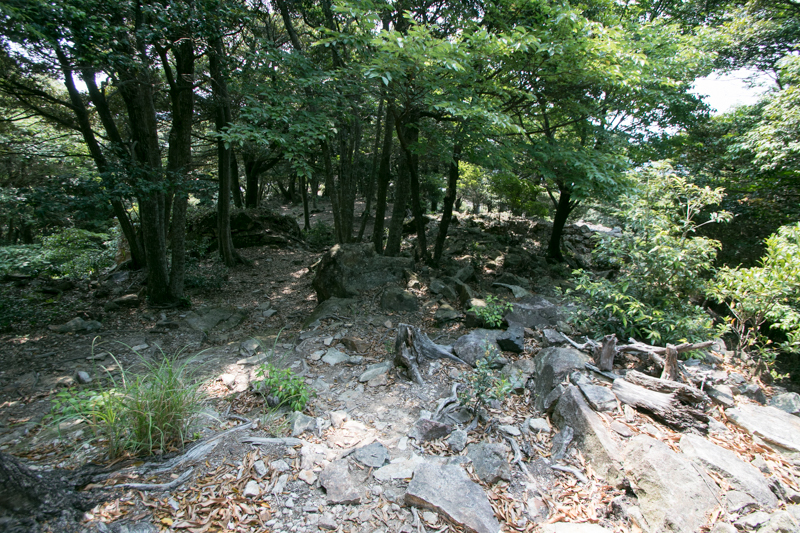 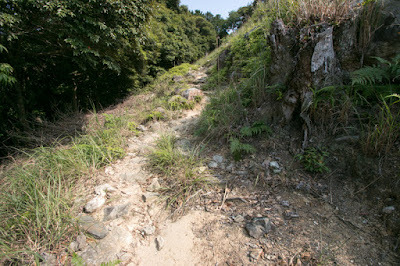 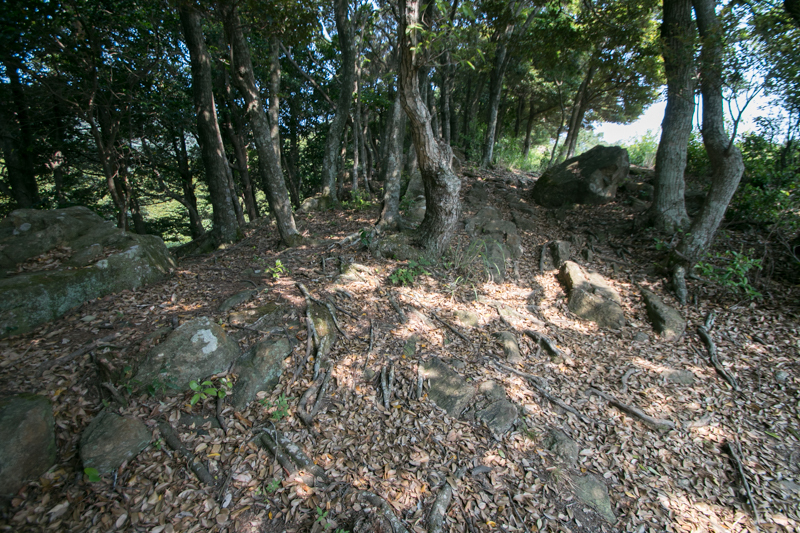 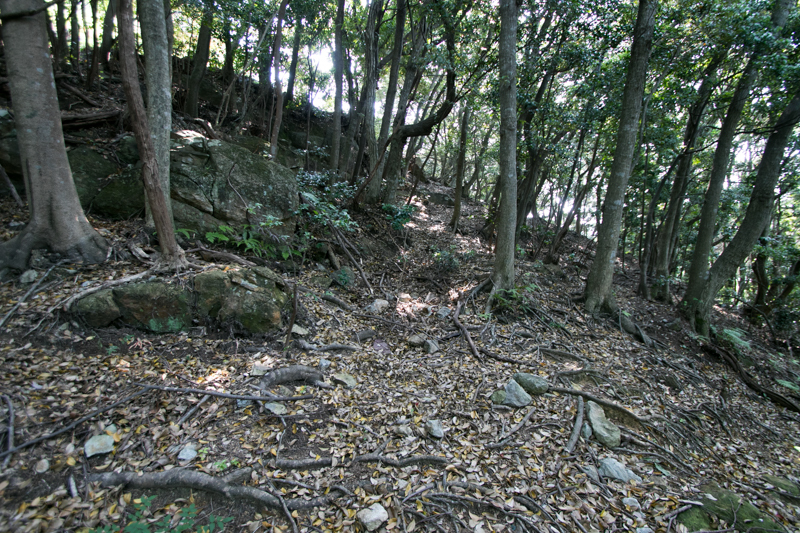 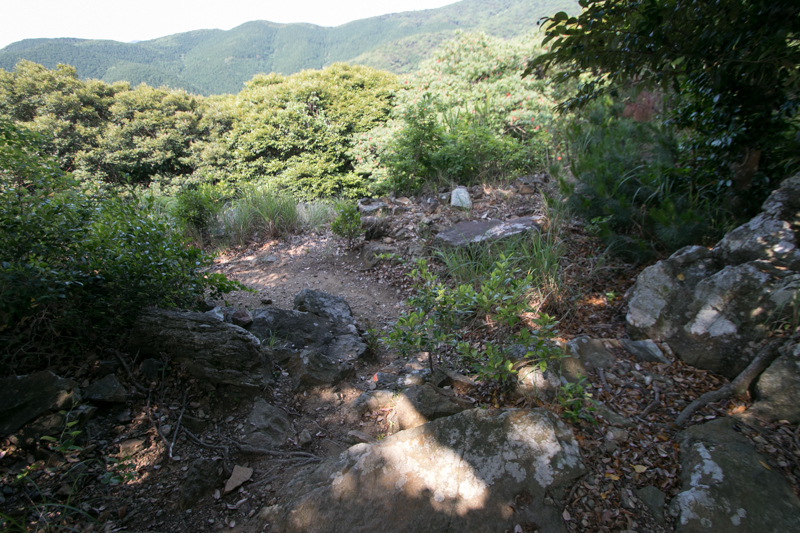 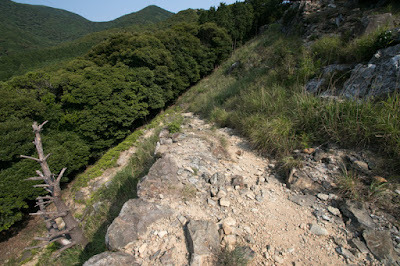 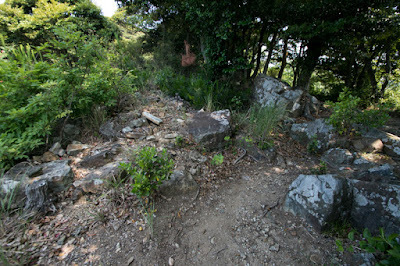 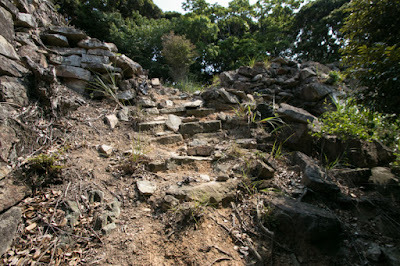 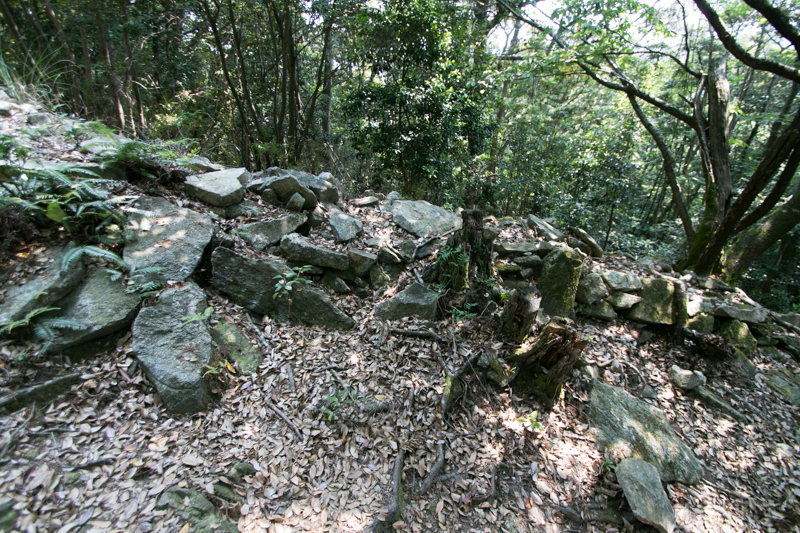 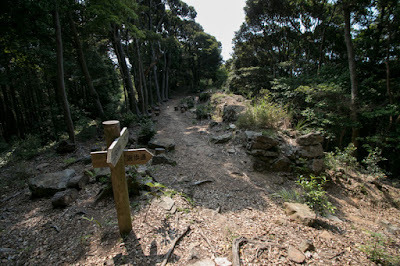 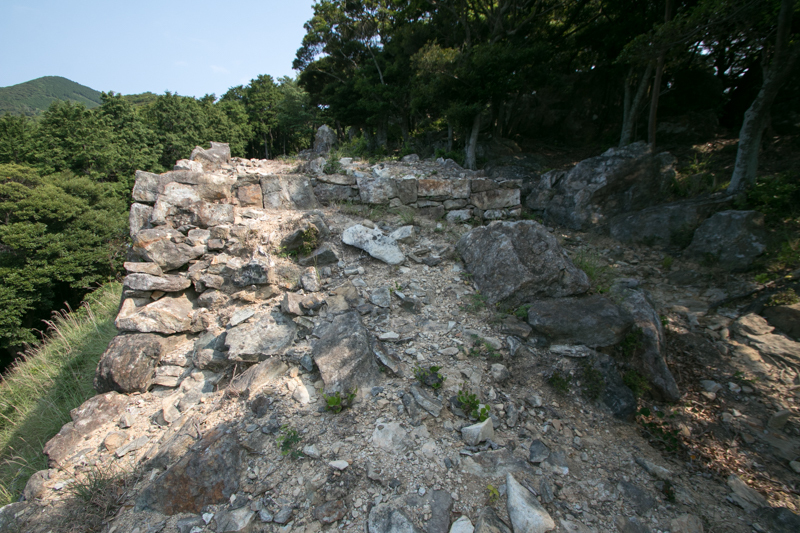 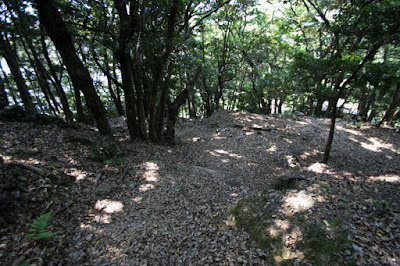 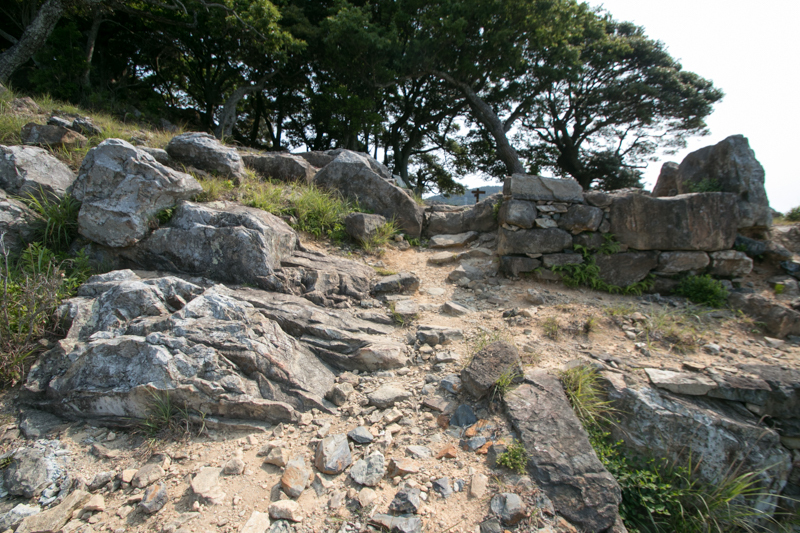 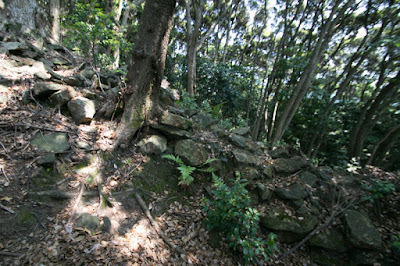 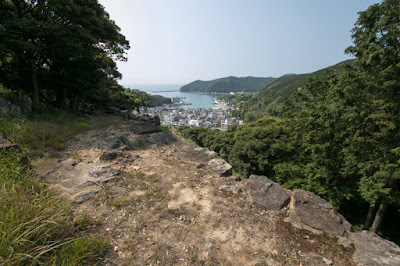 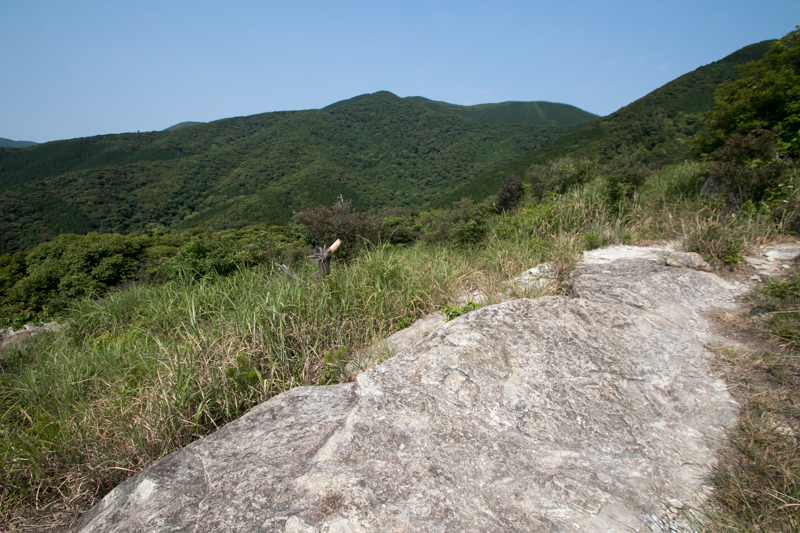 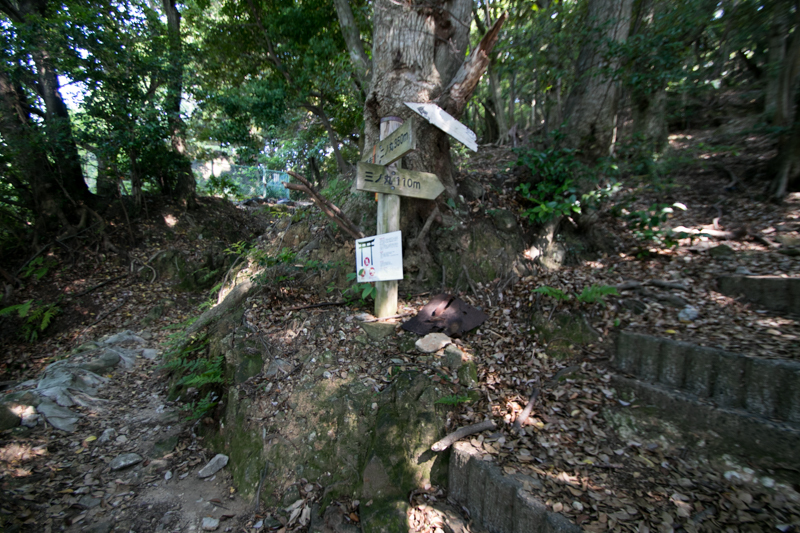 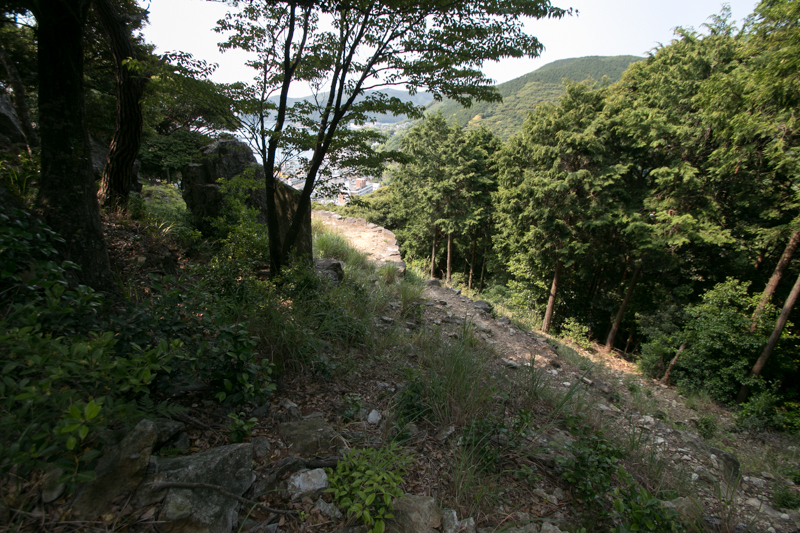 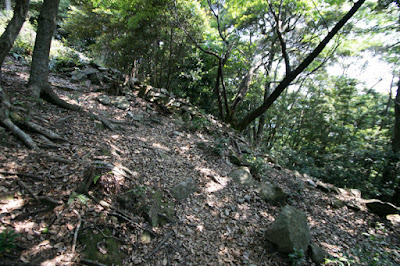 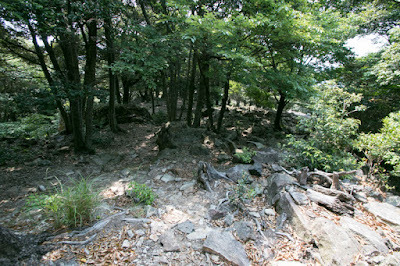 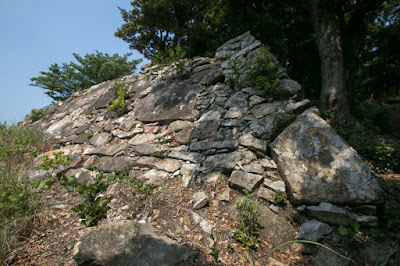 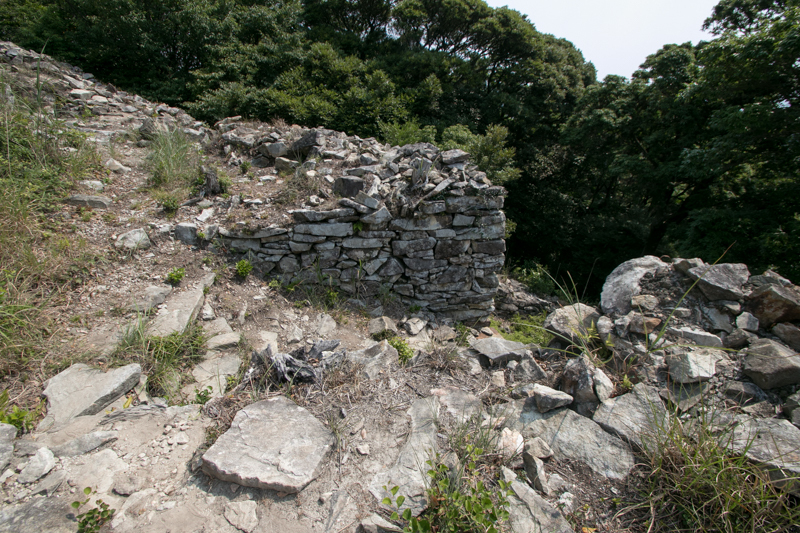 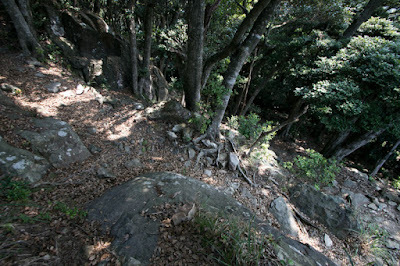 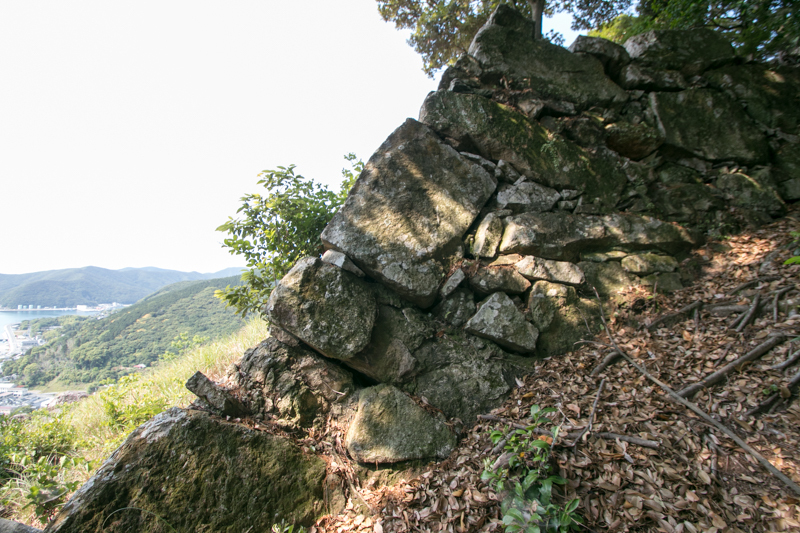 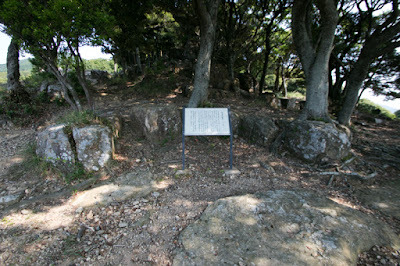 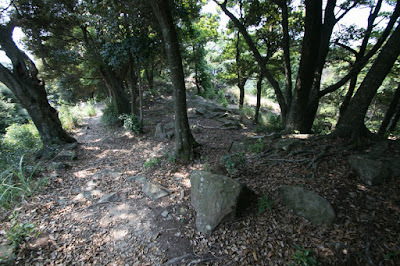 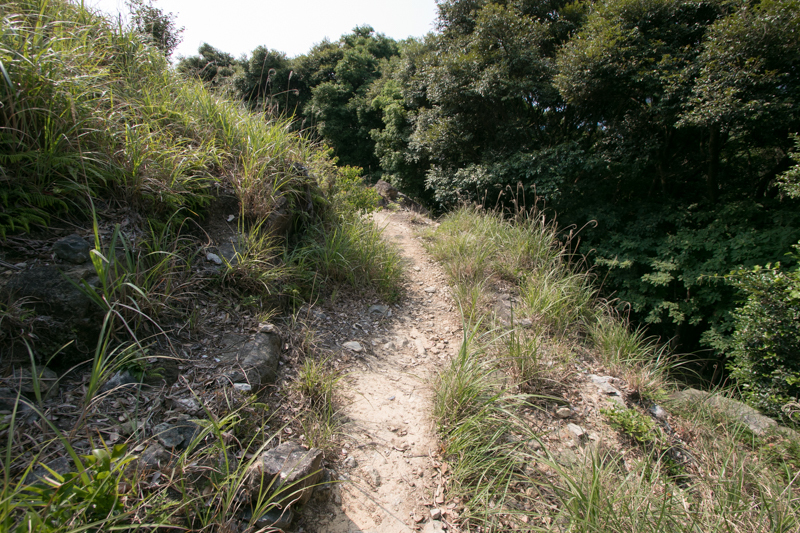 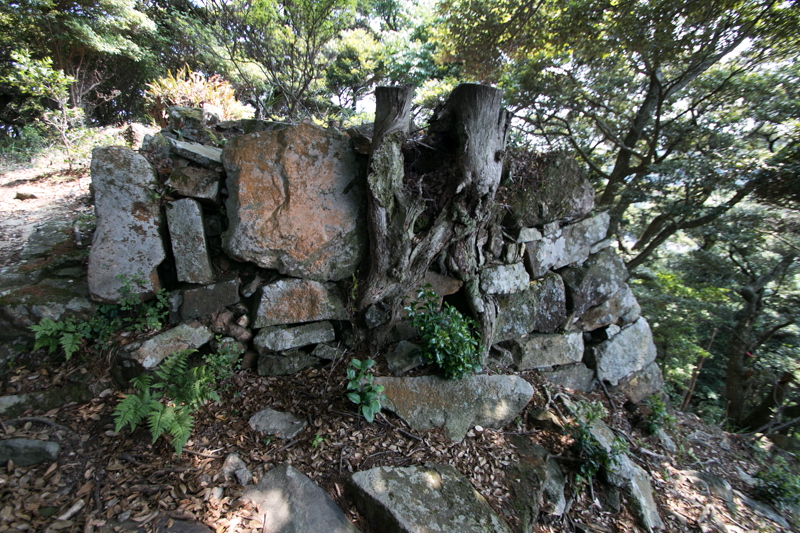 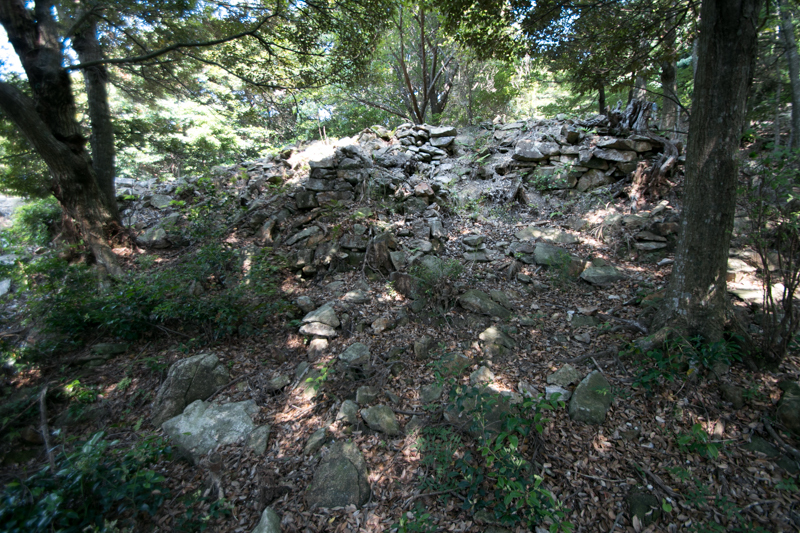 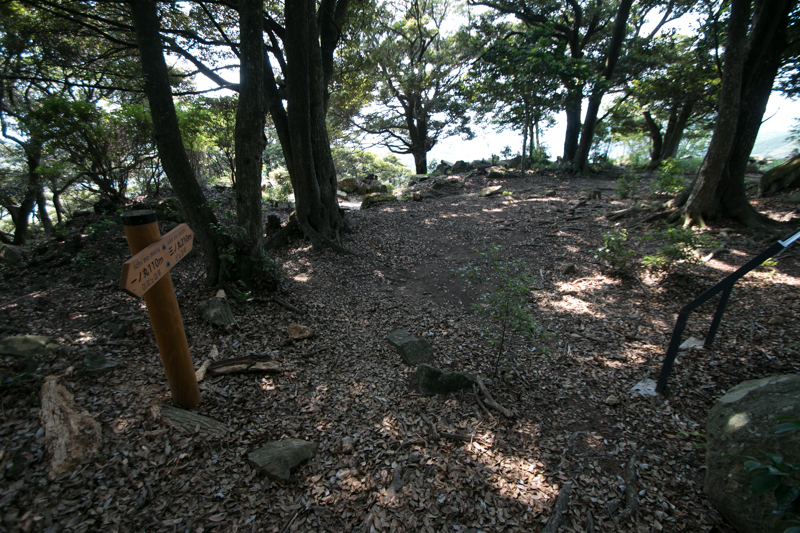 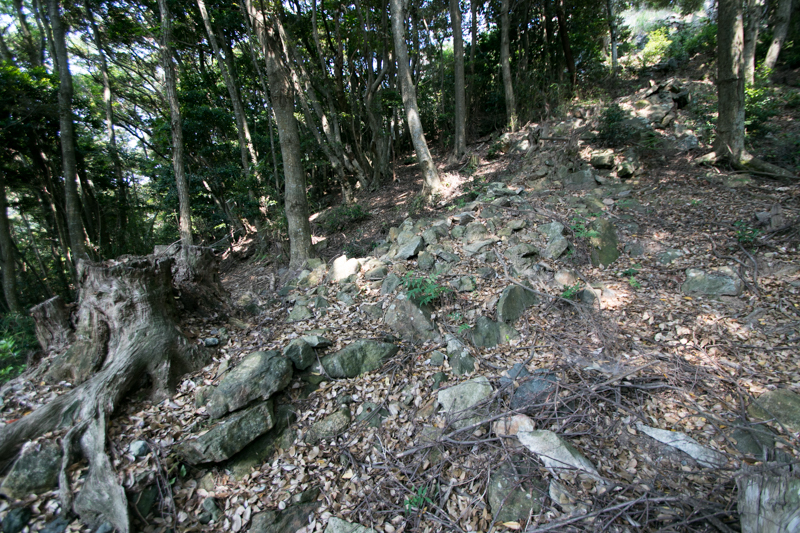 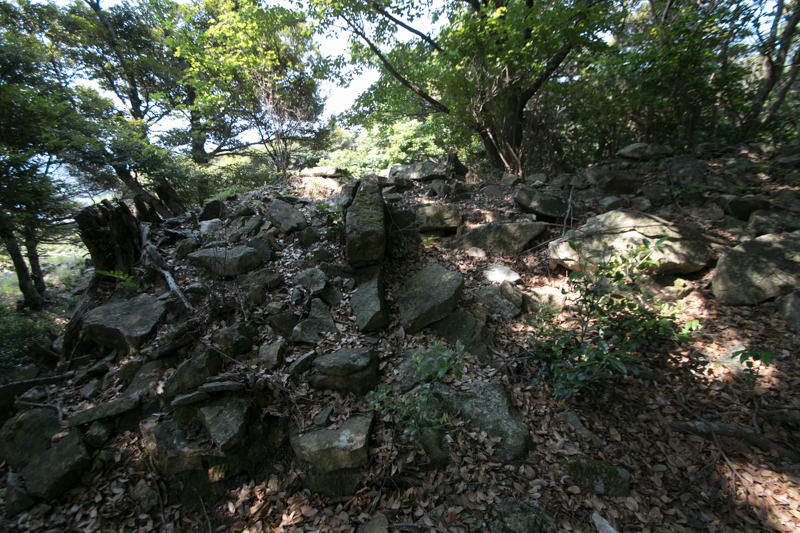 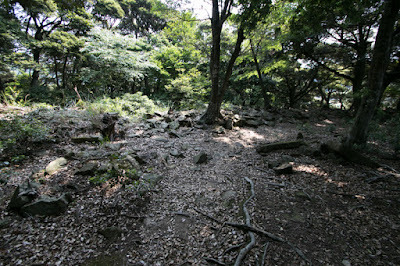 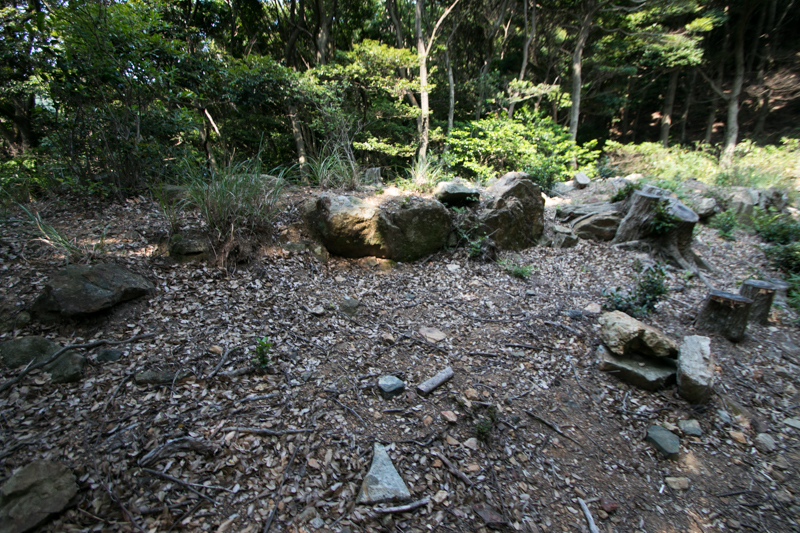 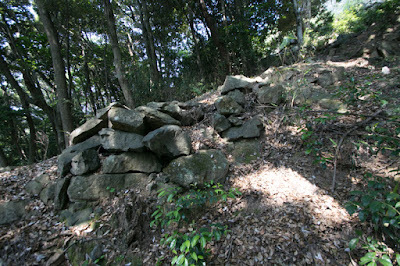 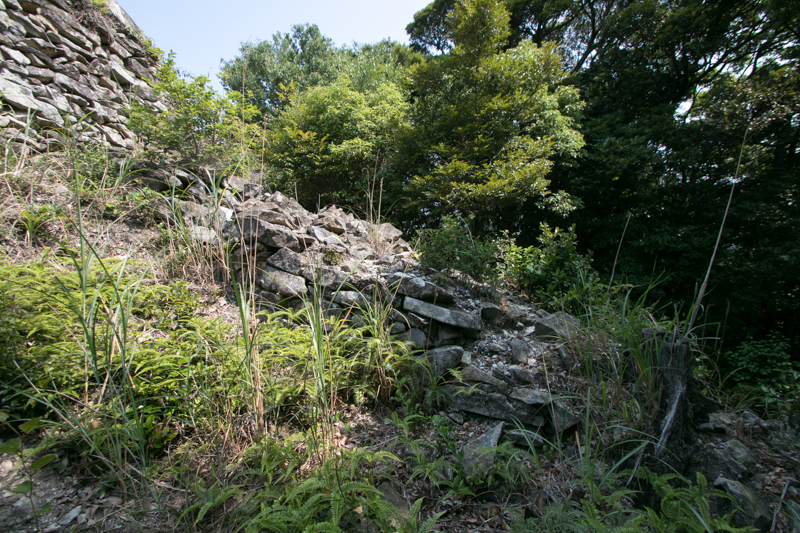 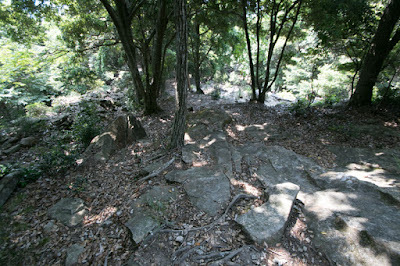 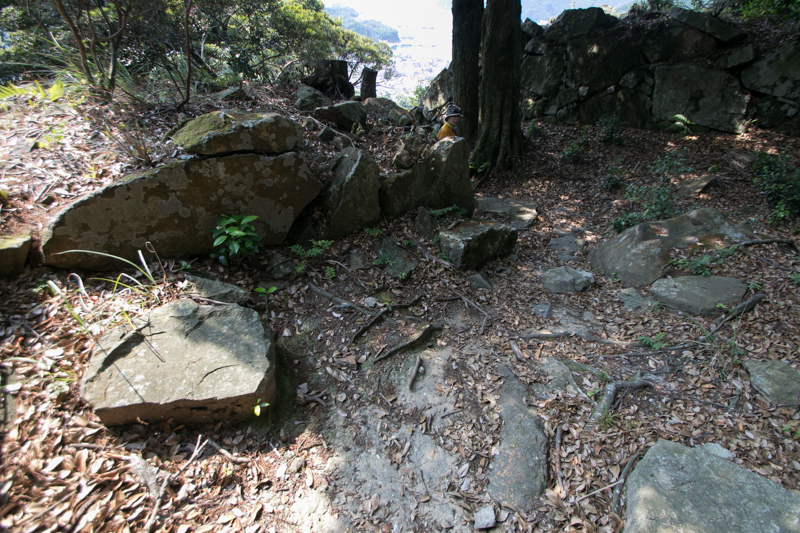 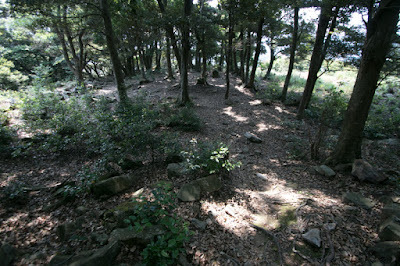 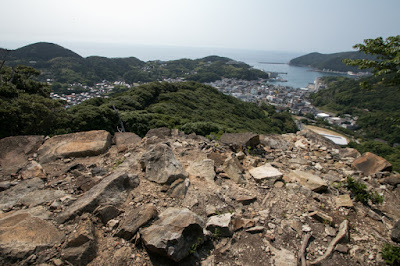 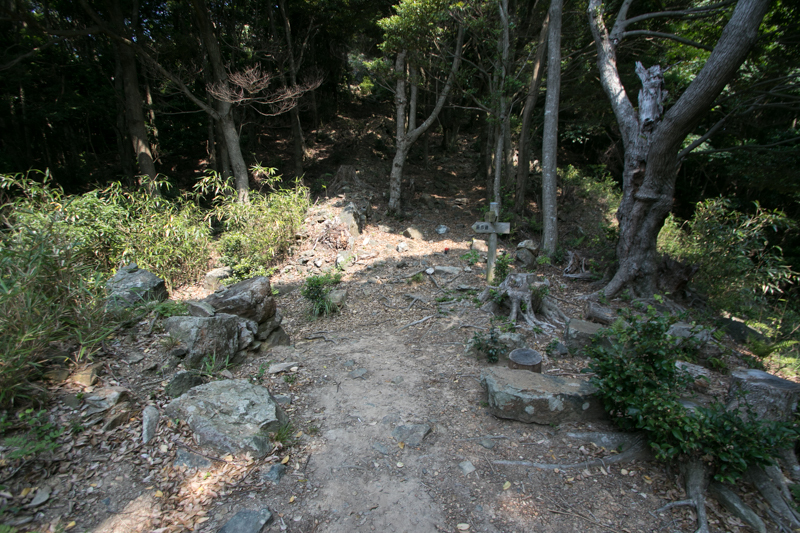 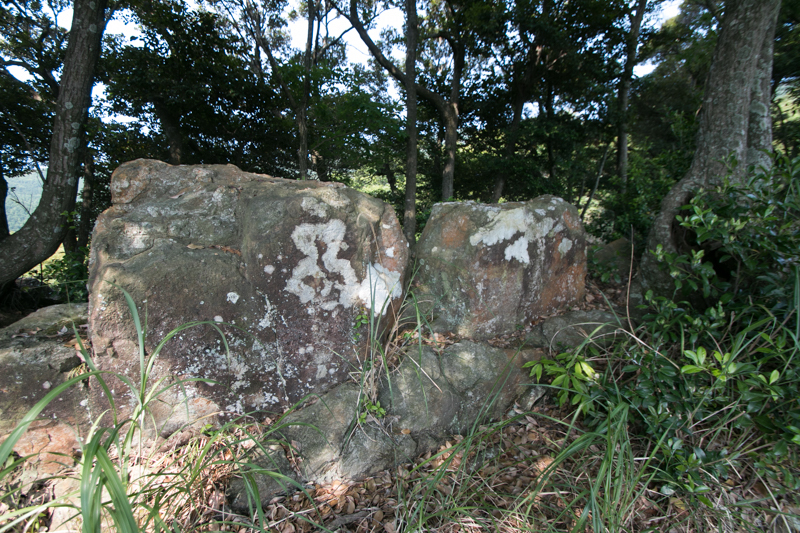 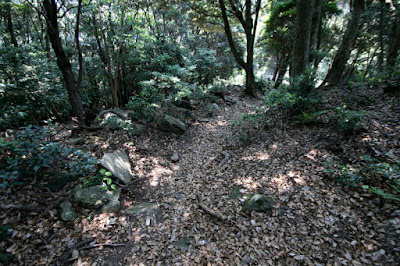 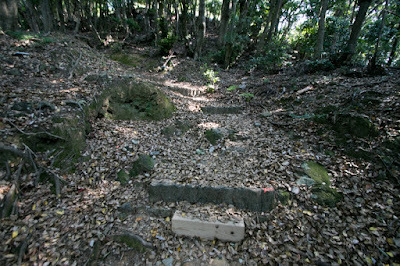 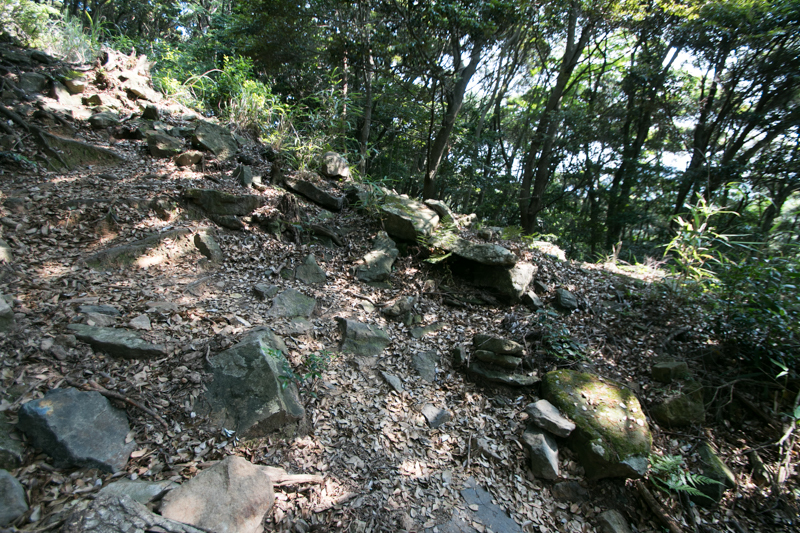 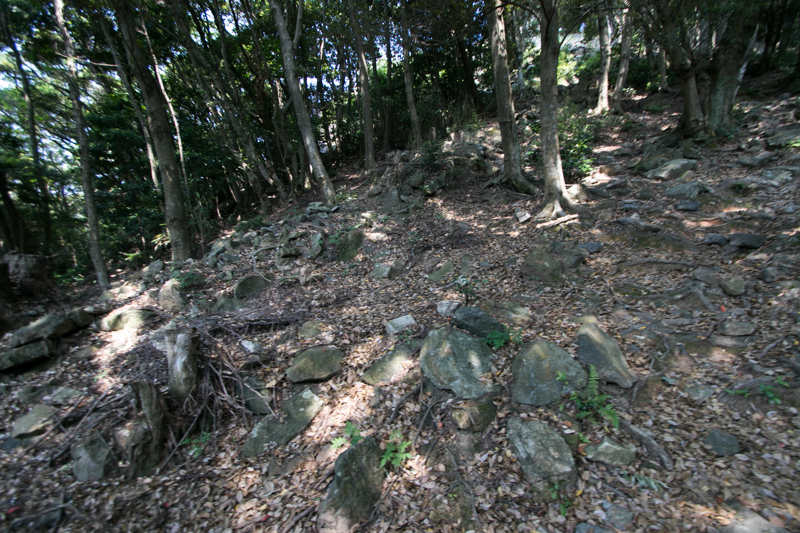 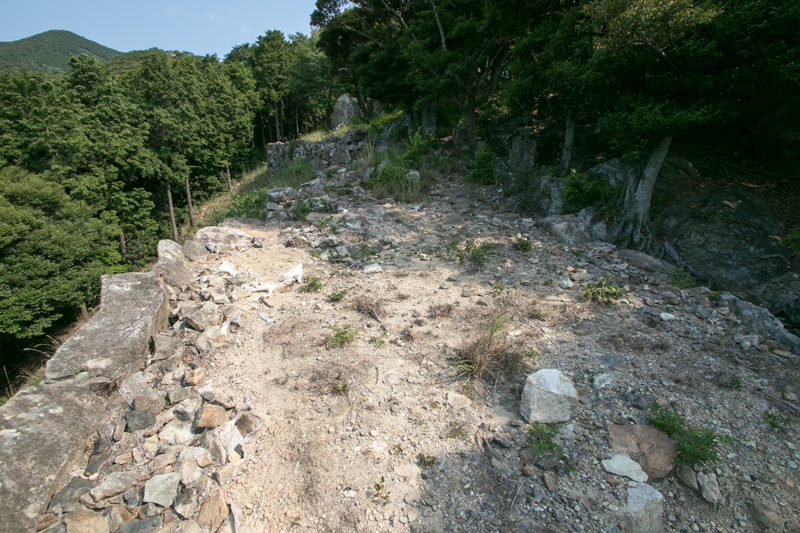 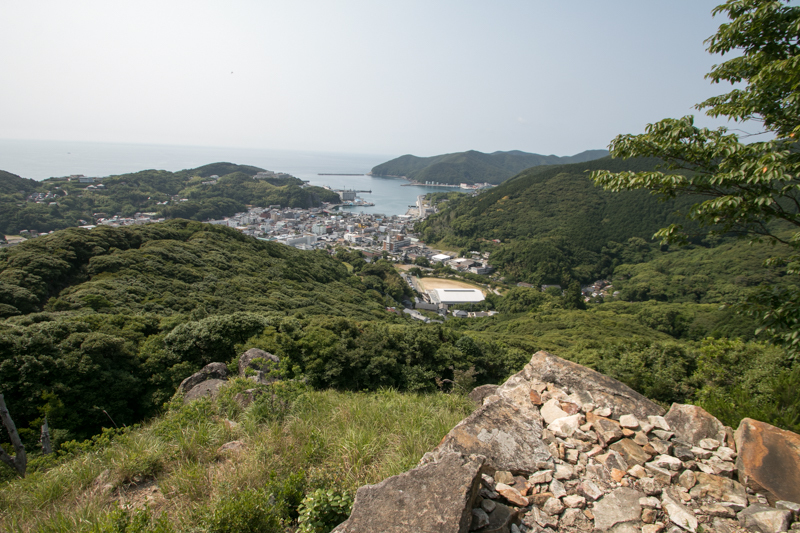 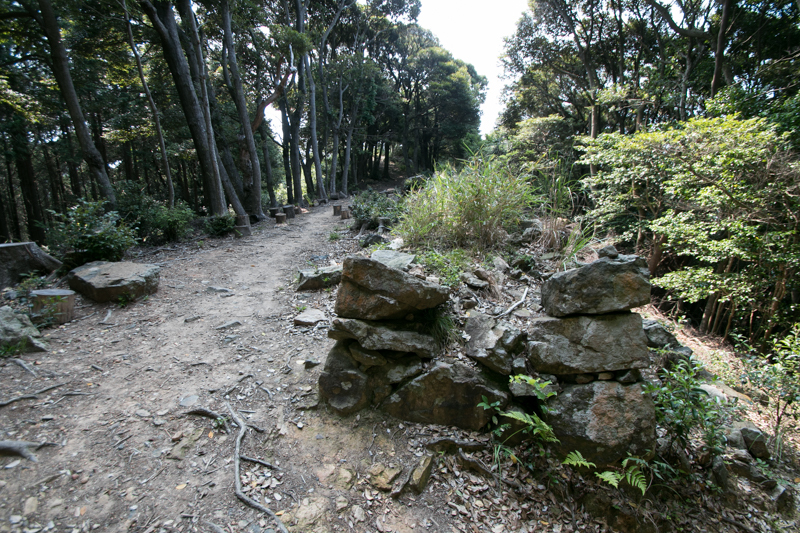 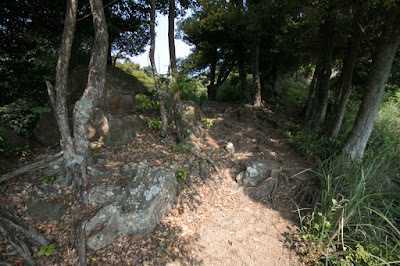 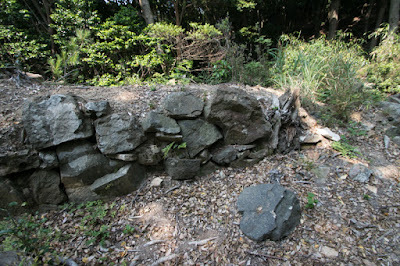 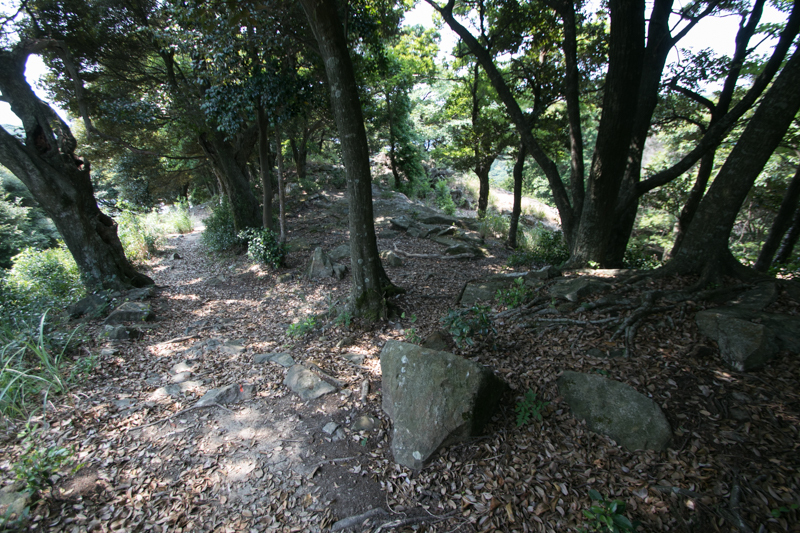 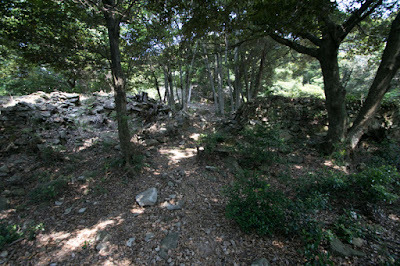 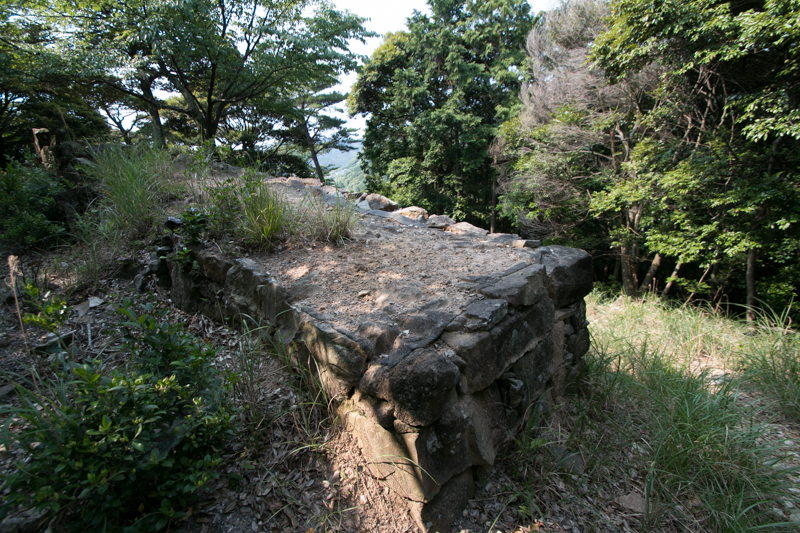 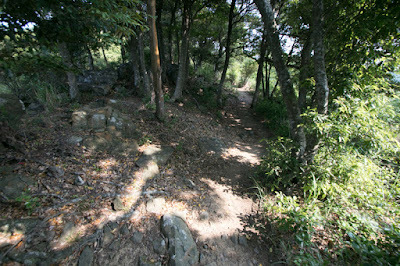 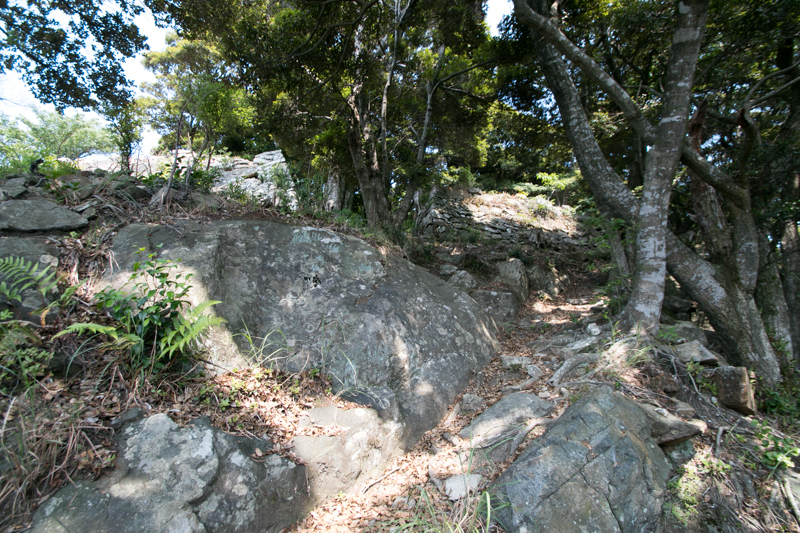 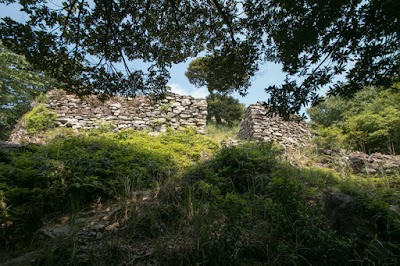 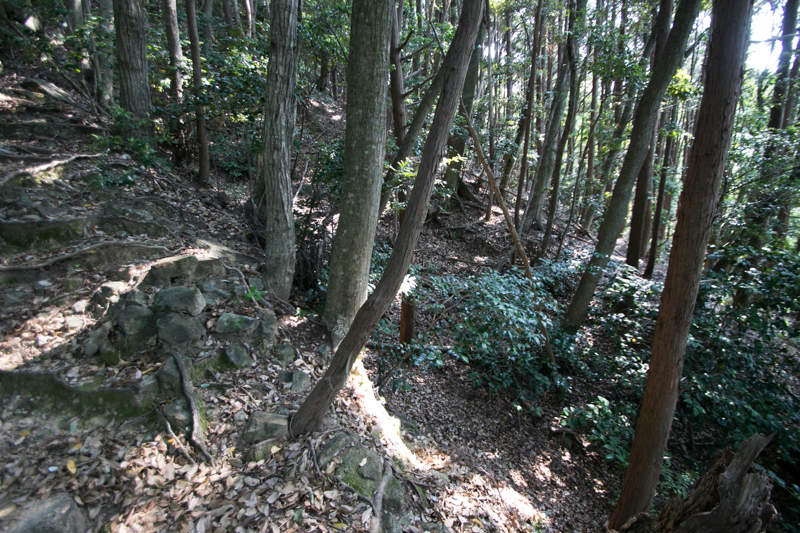 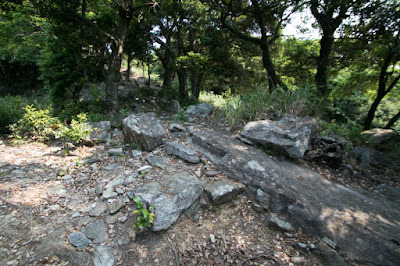 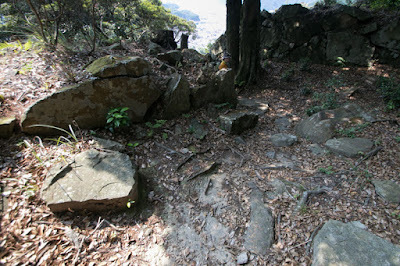 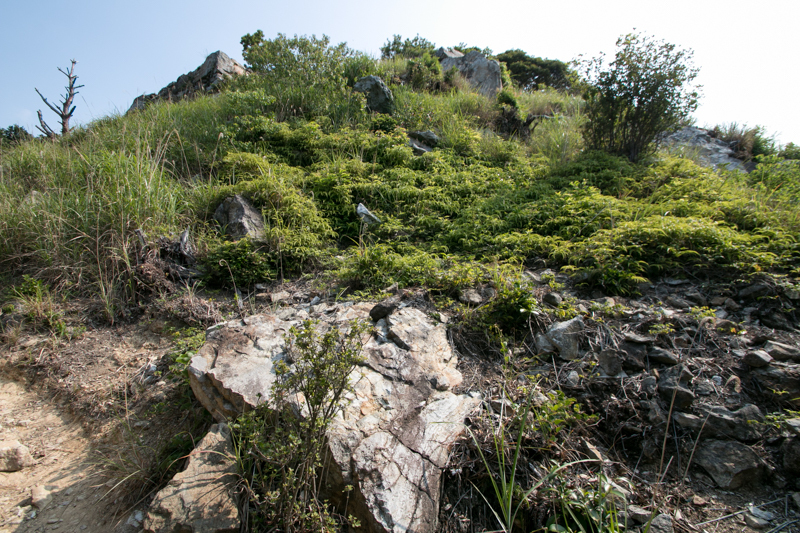 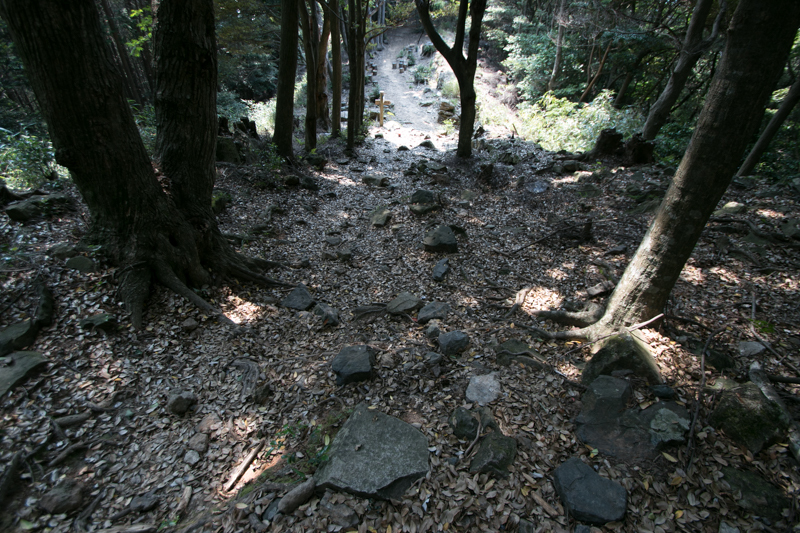 But considering its location, some fort might be built before that by So clan, the medieval lord of Tsushima island. 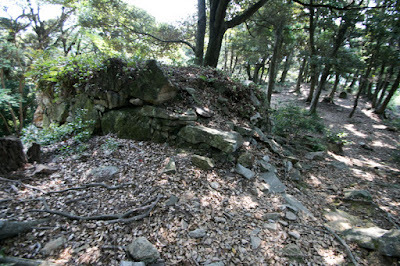 The origin of So clan is not clear but it might be originally a retainer of Dazaifu city, a vice capital of ancient Japan existed at current Fukuoka city. In 12th century Tsushima island was governed by Abiru clan, but in 13th century So clan ruined Abiru clan and rose to deputy governor of Tsushima island. 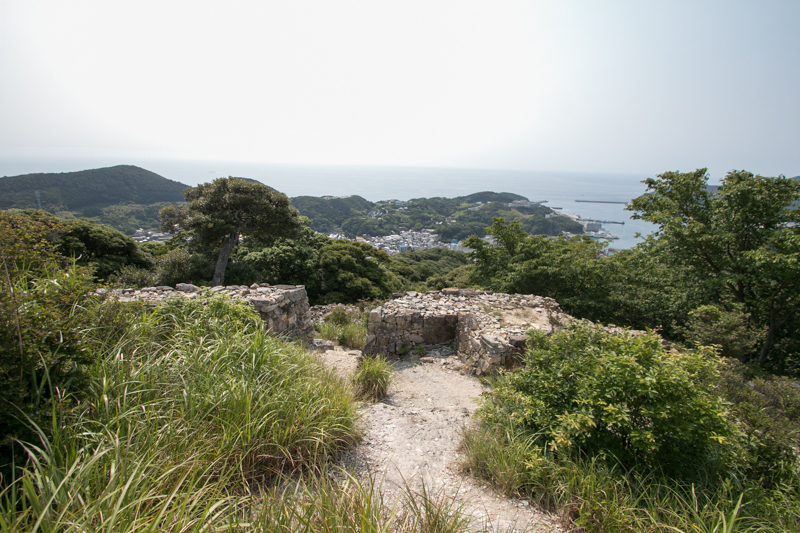 In 1274, the army of Chinese Yuan Dynasty and Korean Koryo Kingdom tried to invade Japan and at first attacked Tsushima island from its west coast. 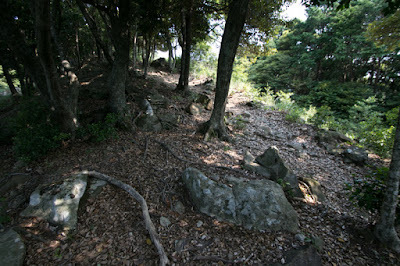 So clan desperately resisted against overwhelming enemy, but finally all of So army including the leader of So clan died in the battle. Next the allied enemy assaulted Iki island and also gave severe damage, then landed to Fukuoka area, but faced resistance of Kamakura Shogunate army and bad weather then finally retreated. Seven years after in 1271, Yuan dynasty and Koryo kingdom attempted second invasion to Japan. 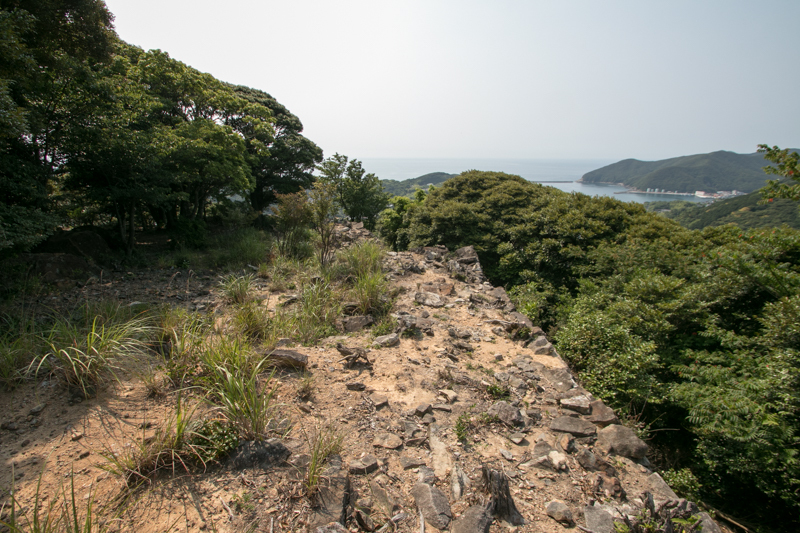 At this time Tsusima island and Iki island faced attack of the enemy again, but this time So clan prepared for the enemy and gave damage to them. At this time enemy army was stuck facing counter attack of Japanese army, and finally suffered fatal damage by typhoon and returned in vain. 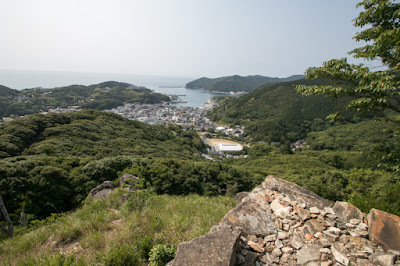 After the fall of Kamakura Shogunate, Shoni clan which activated at the defense battle against former assault of Yuan dynasty became the governor of north part of Kyushu island including Tsushima province. 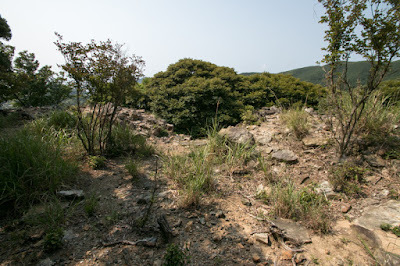 But Shoni clan lost their power during the battle against the South Court army, and was deprived their position by Sadayo Imagawa (1326-1420) who was appointed by Muromachi Shogunate. 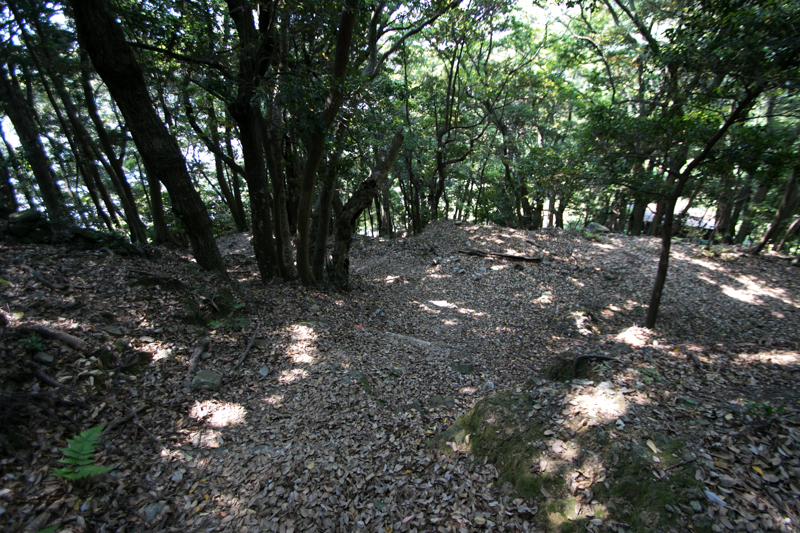 However, Sadayo Imagawa also lost his position being feared his power by Shogunate. 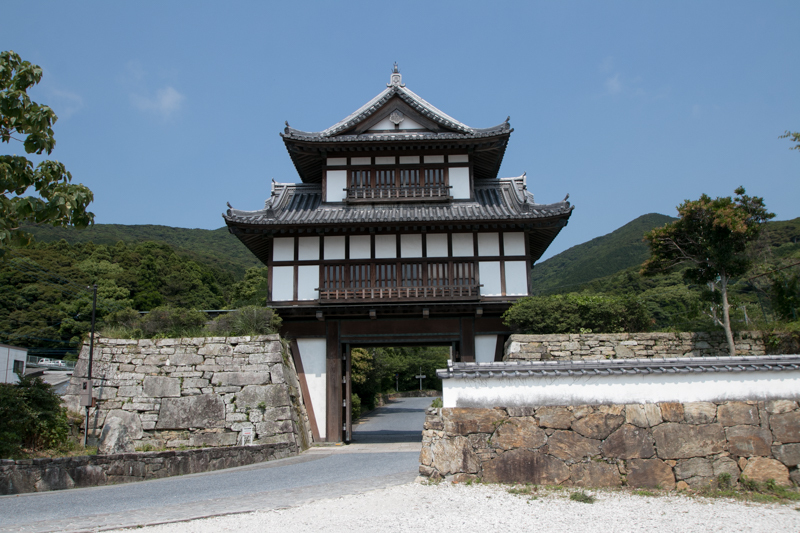 At this time So clan raised from deputy governor to the governor of Tsushima province. 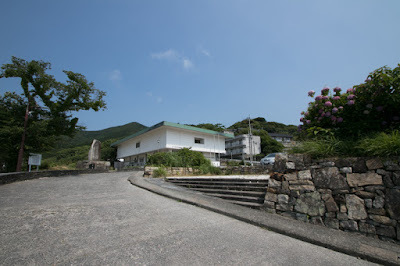 So clan at first resided at north island, then moved to south island and built their residence at Izuhara area. 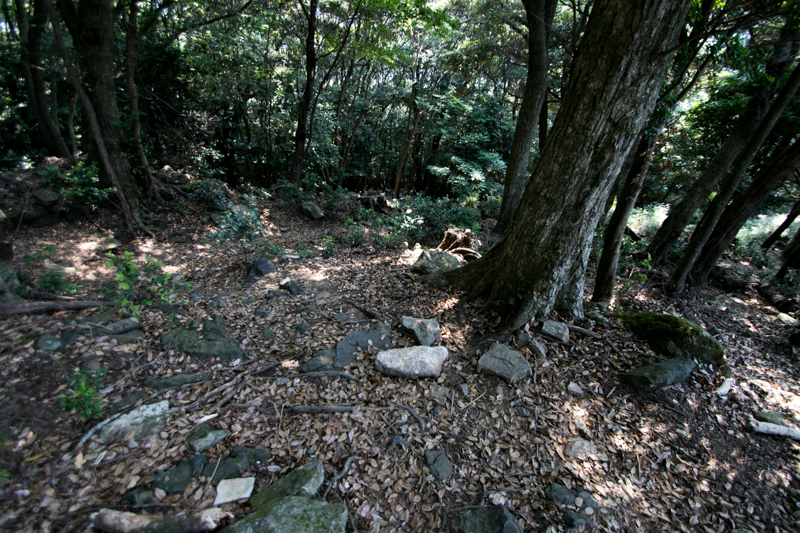 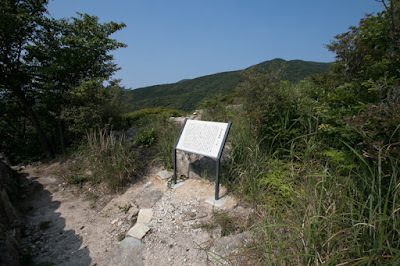 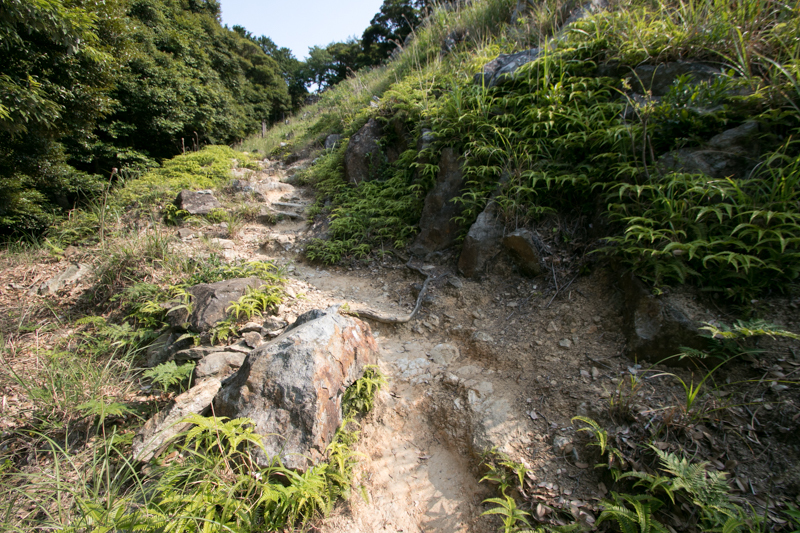 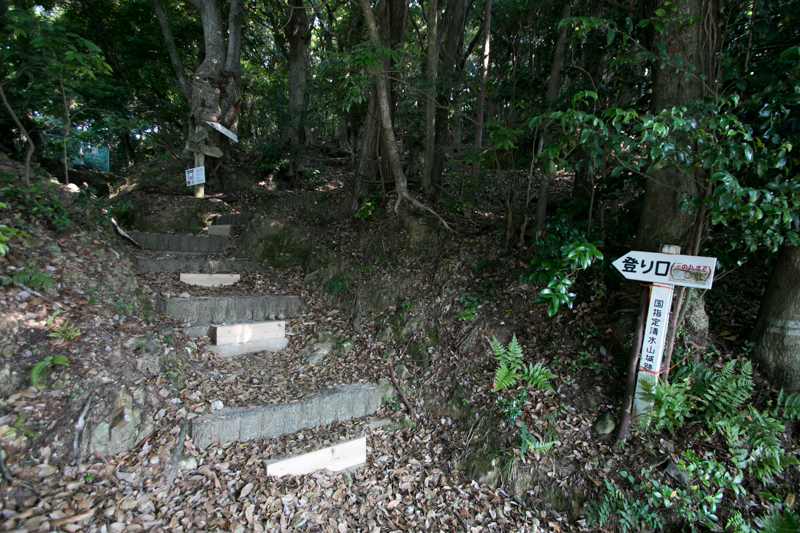 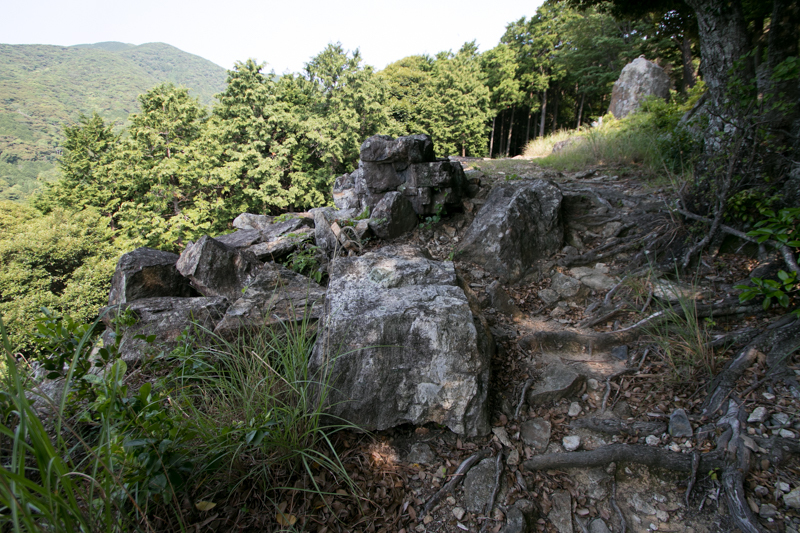 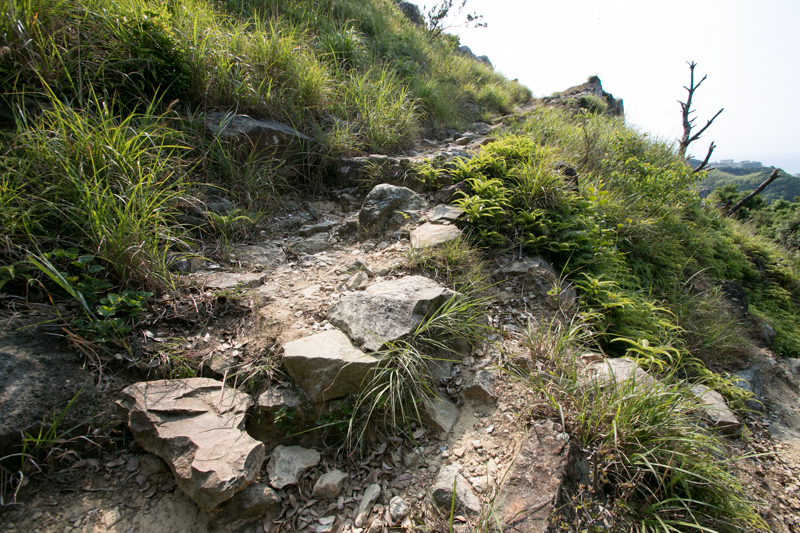 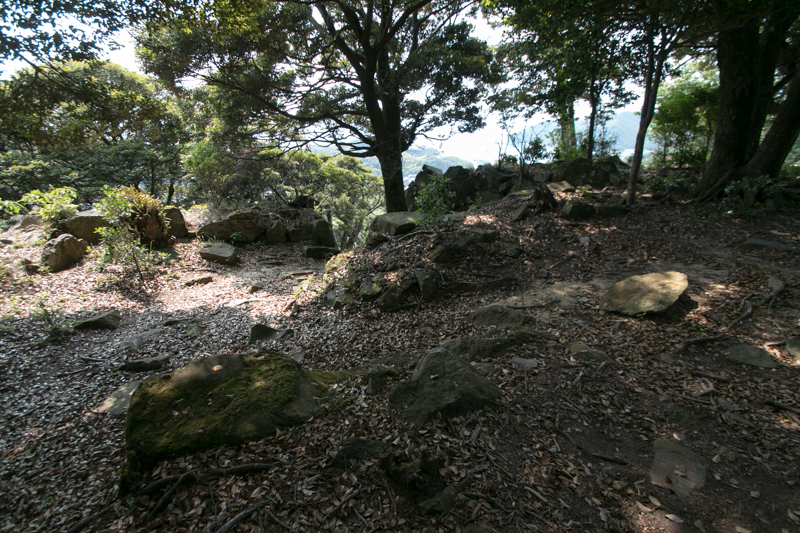 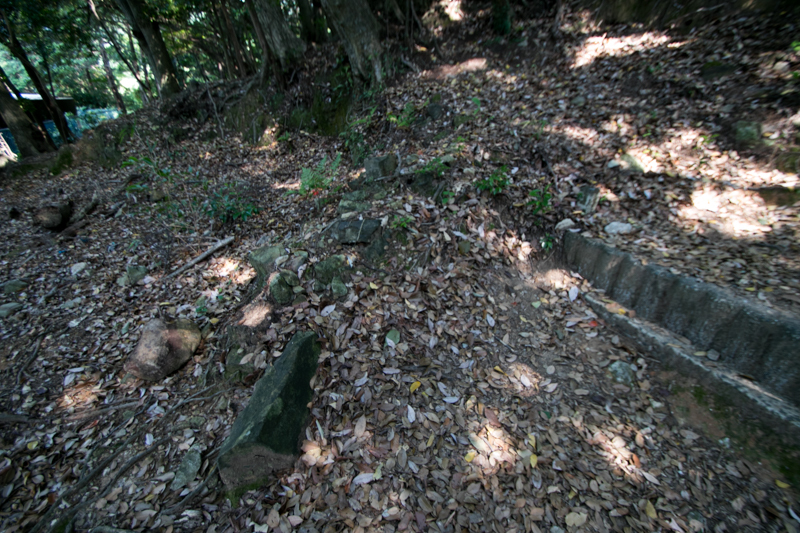 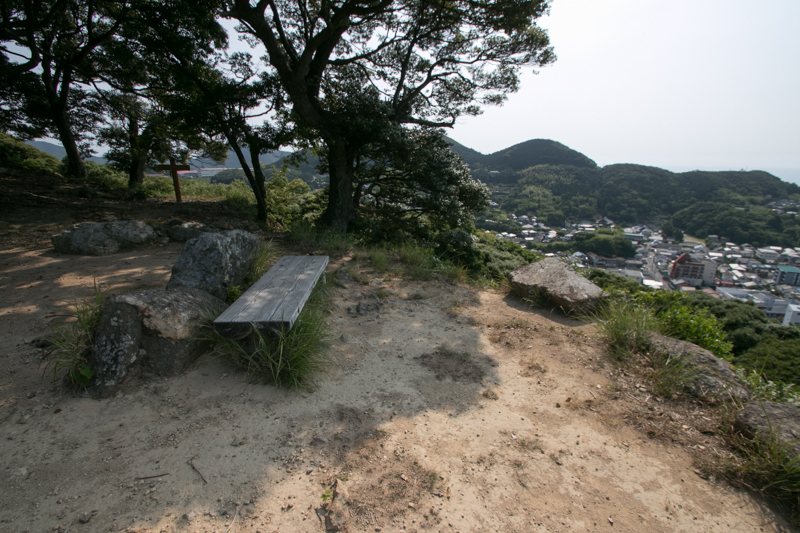 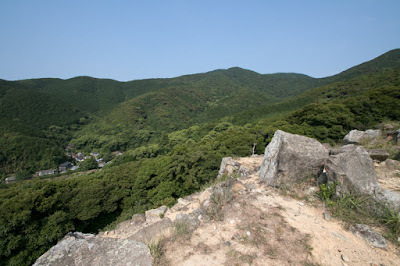 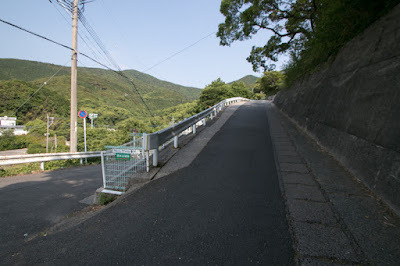 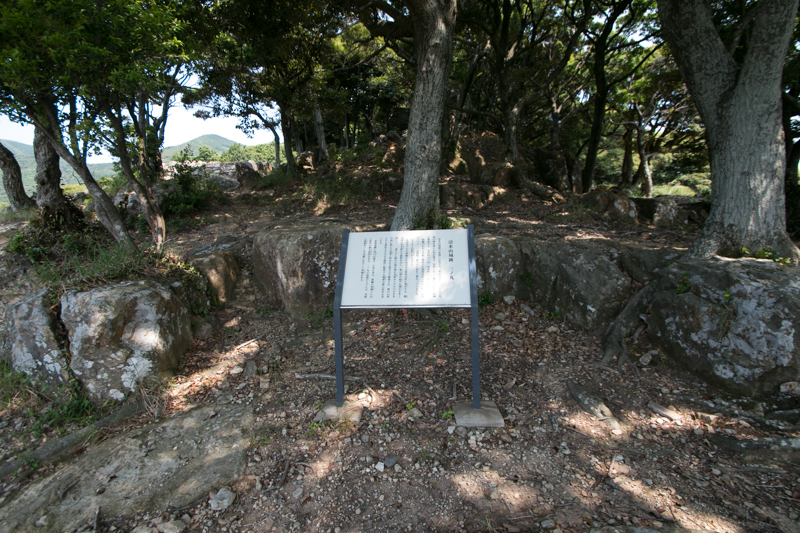 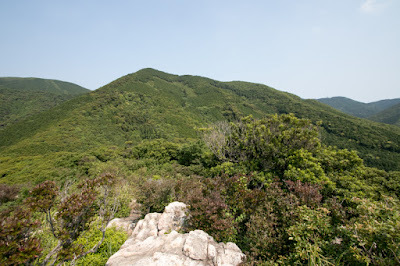 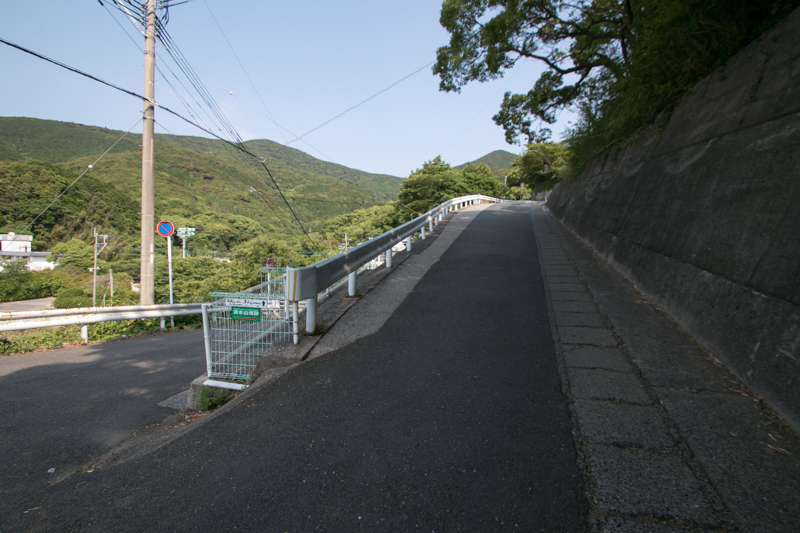 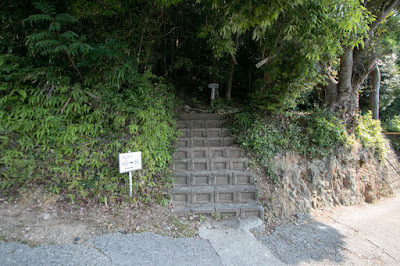 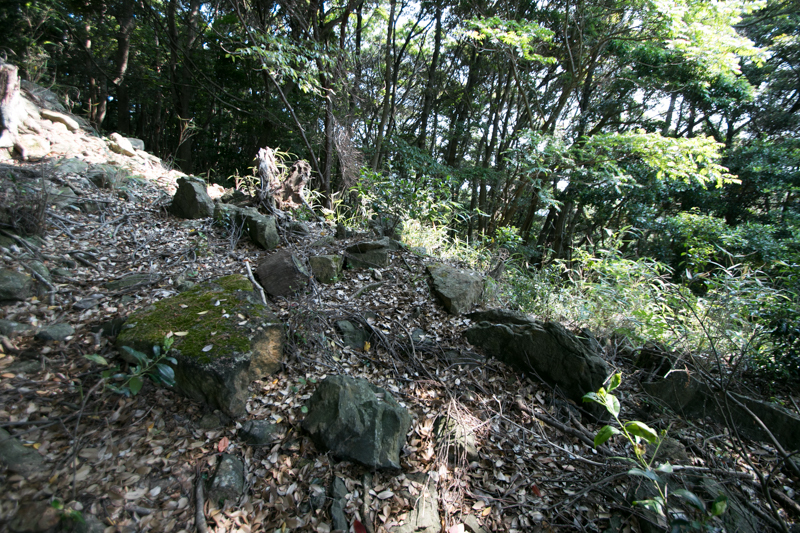 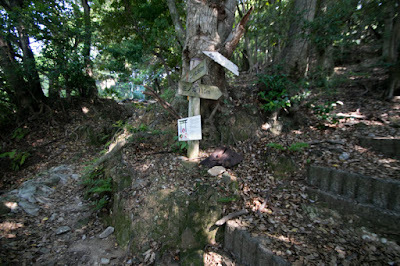 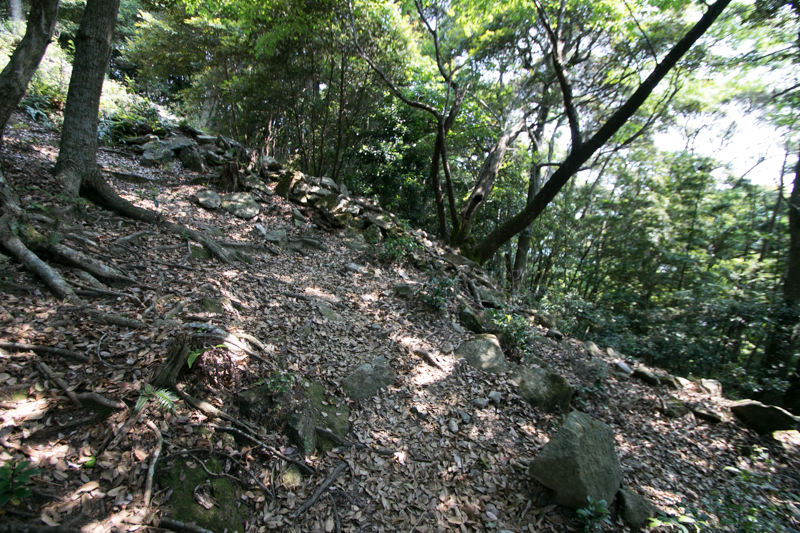 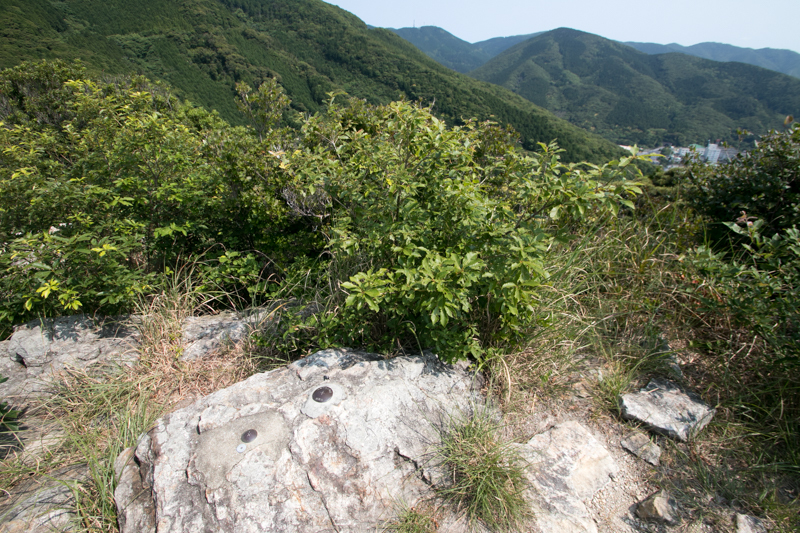 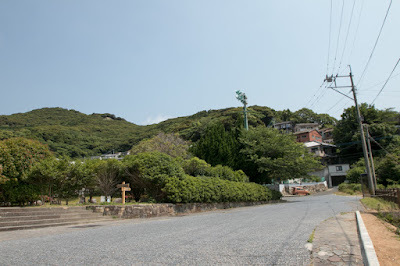 As Shimizuyama mountain locates just behind of the residence of So clan, there might be a fort on the mountain as an evacuation place in case of emergency. 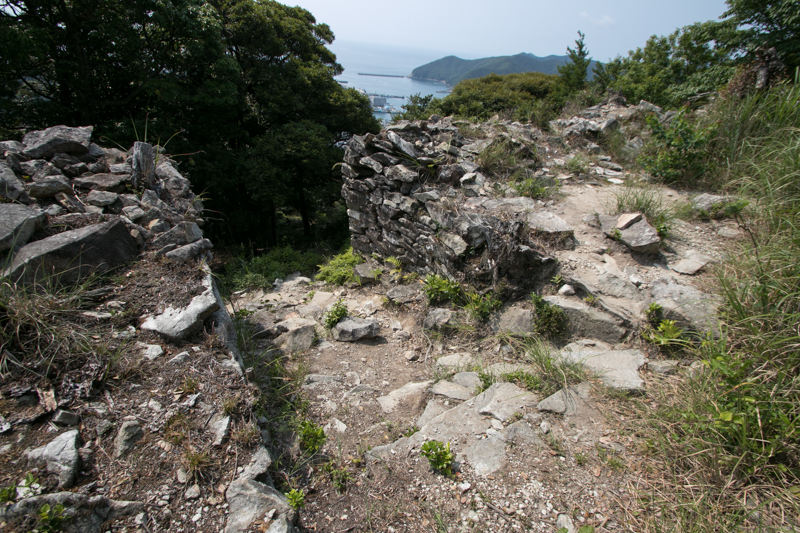 In 1419, Korean Joseon Dynasty assaulted Tsushima island, but faced counter attack of So army then finally retreated from island. 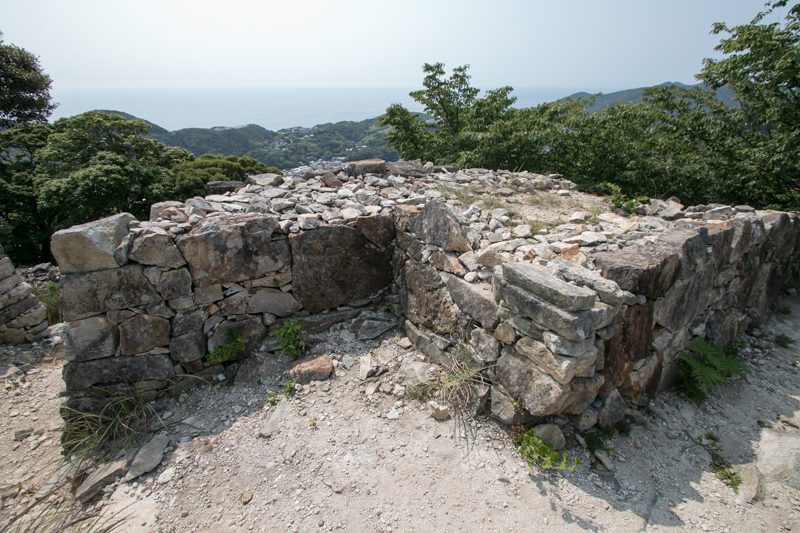 After that So clan utilized its geographical location and trade limitation policy of Joseon Dynasty, became the trade window between Japan and Korea and gained profit. 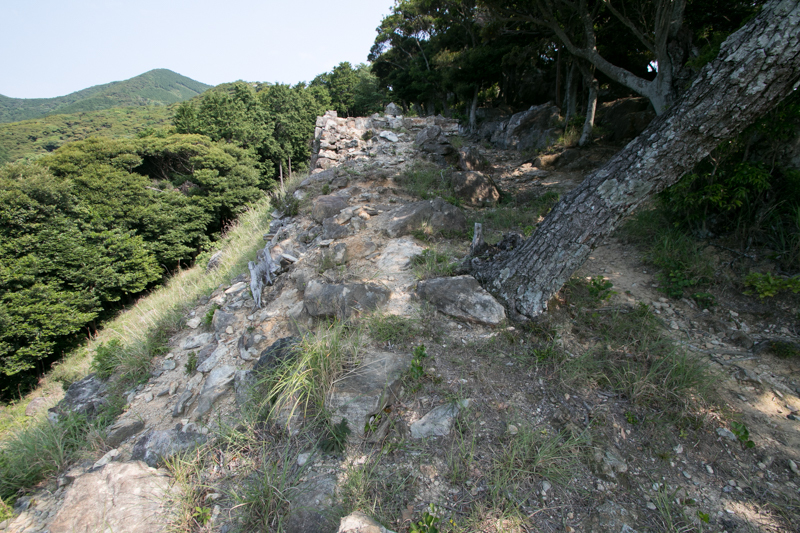 Based on this profit, So clan supported declined former master Shoni clan and made expeditions toward Kyushu island. After several defeats So clan and Shoni clan once recovered Hakata port and restored their power. But facing the counter attack of Ouchi clan, the strong warlord of Suo province (Yamaguchi prefecture), Shoni clan lost Hakata city then So clan left Shoni clan. 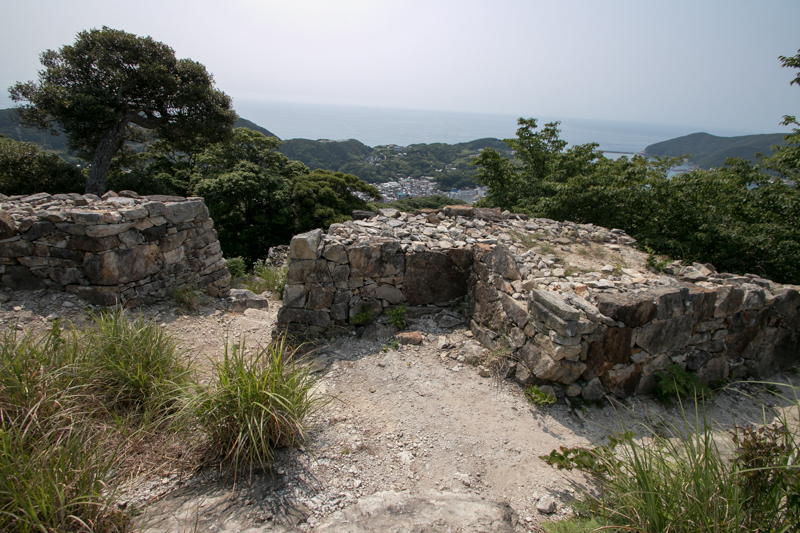 In 16th century, because of the loss of territory at Kyushu island and strong limitation of trade by Joseon Dynasty, So clan significantly lost their power. Attempt of rebellion at Korean port in 1510 failed, and trade port was limited to current Busan area. 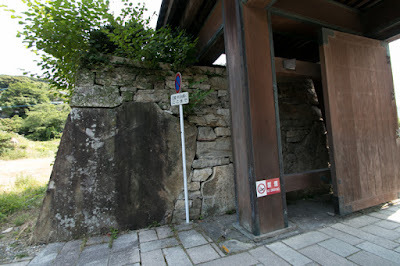 So clan tried to keep the amount of trade even by sending fake trade mission of Muromachi Shogunate. 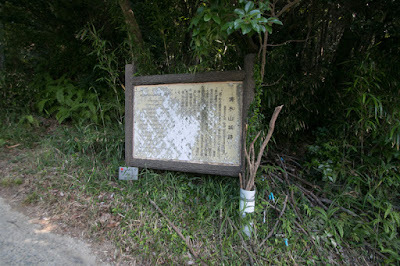 In the middle of 16th century, So clan suffered from internal conflicts but united their family again. 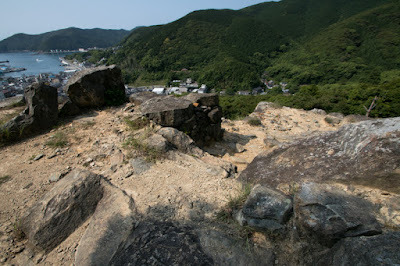 In 1587, when central ruler Hideyoshi Toyotomi (1537-1598) made Kyushu campaign against Shimazu clan, So clan followed to Hideyoshi and was approved as the lord of Tsushima island. 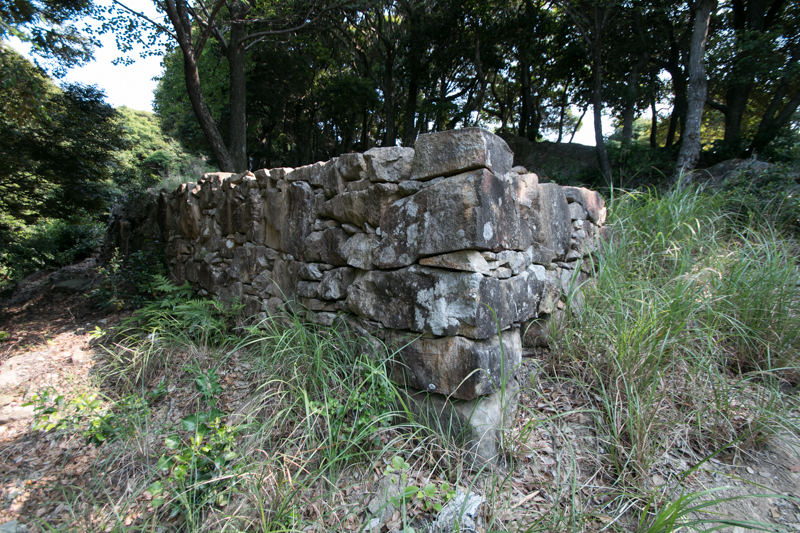 It seemed So clan built stable authority being supported by central power. But this was an another burden for So clan. Hideyoshi who united Japan in 1590 attempted foreign expansion as next step, and So clan was ordered to coordinate his expedition. 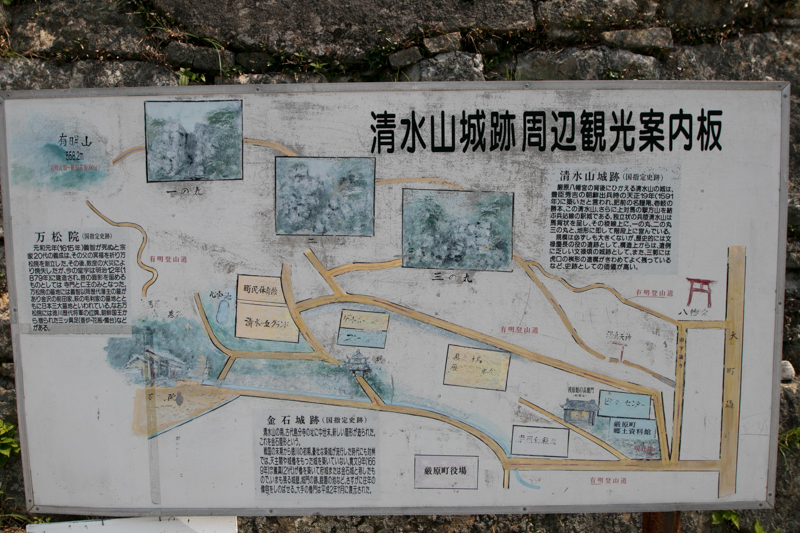 In spite of desperate negotiation of So clan, the campaign started in 1592. As Tsushima island located at the main route toward Korean peninsula, Hideyoshi built Shimizuyama castle to secure this intermediate point. Shimizuyama castle has a mysterious structure compared with other castles of main land built at same age. 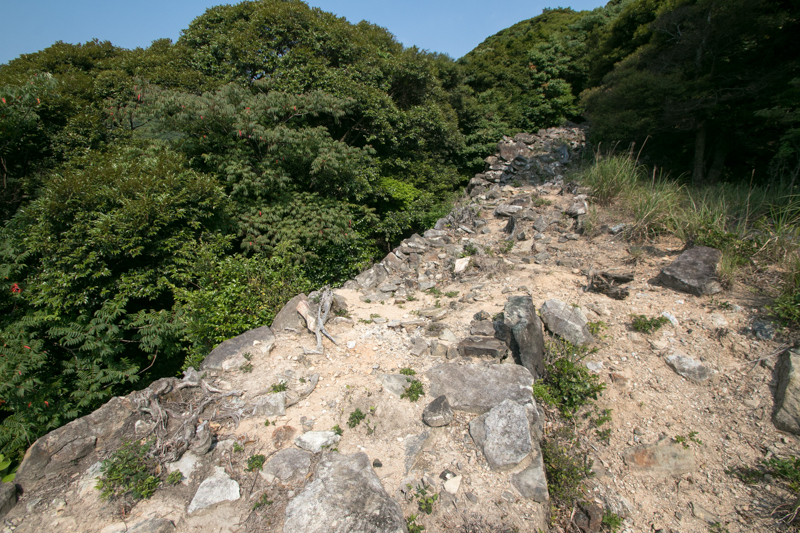 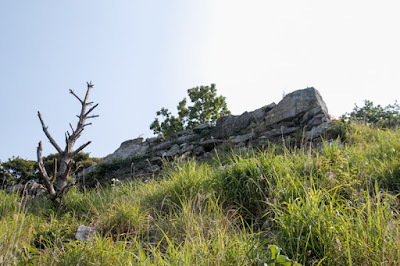 The castle consist of three terraces from the top to the halfway of the mountain, and stone walls built at each side of slope connecting these three terraces like corridor. 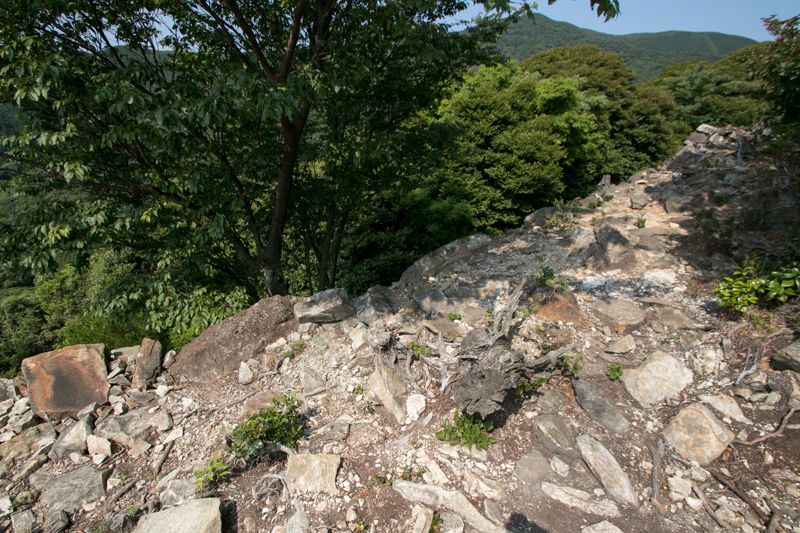 Central area of the castle is a oblong shaped area of 50 meter long and 20 meter wide at the top of the mountain. 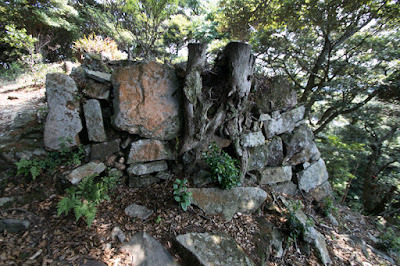 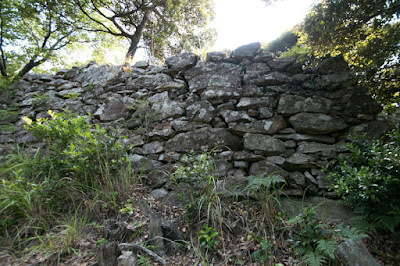 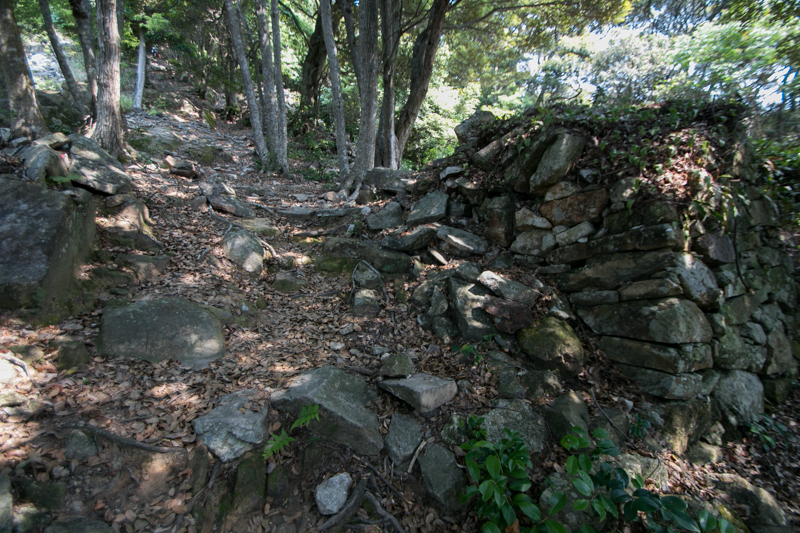 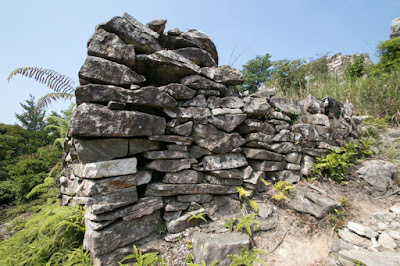 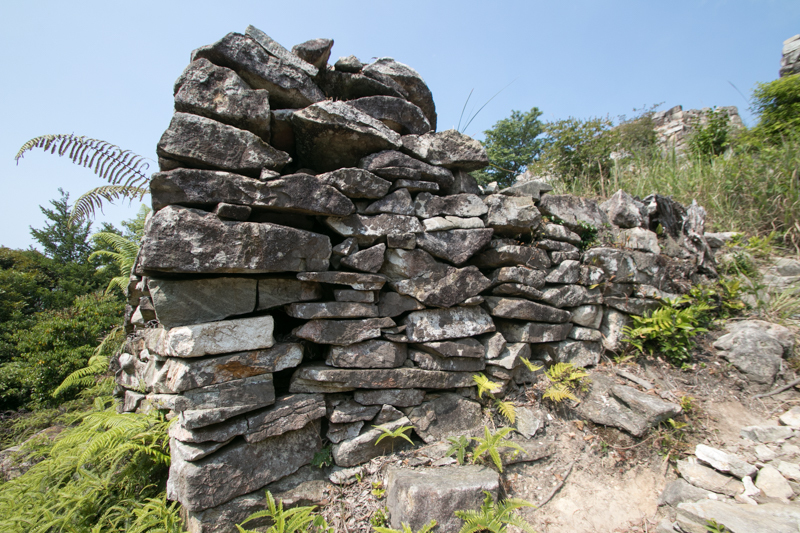 This area is wholly surrounded by stone walls, but these walls is a traditional one built by placing small stone bricks. 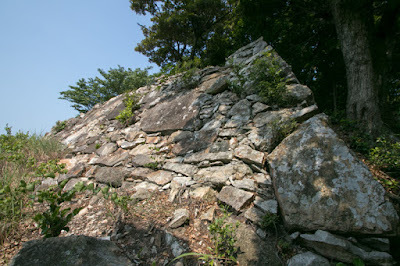 This is a local technology seen at north part of Kyushu island, and might be built So clan. 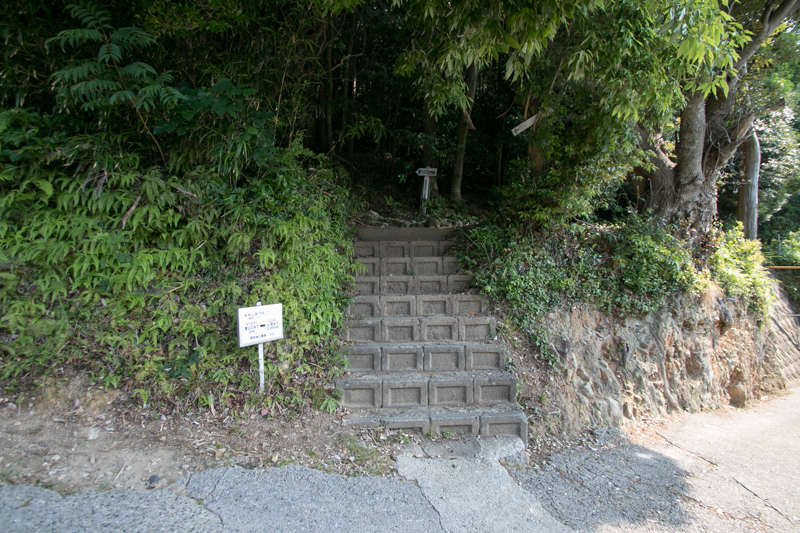 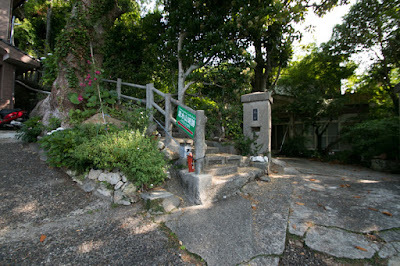 But front gate of this area is a Masugata style complex gate, an advanced technology brought by Toyotomi clan. 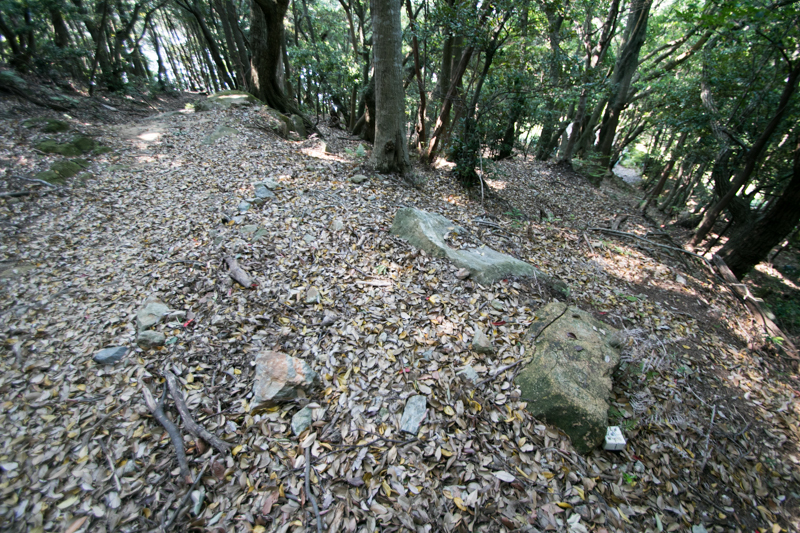 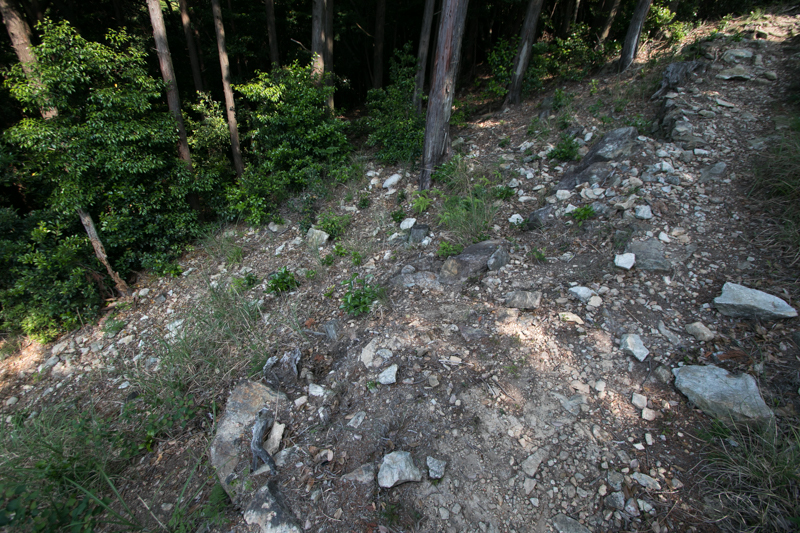 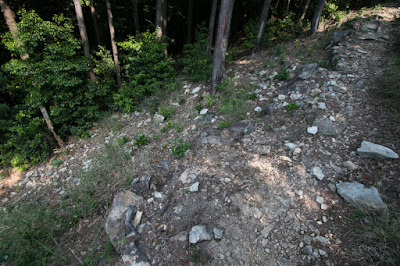 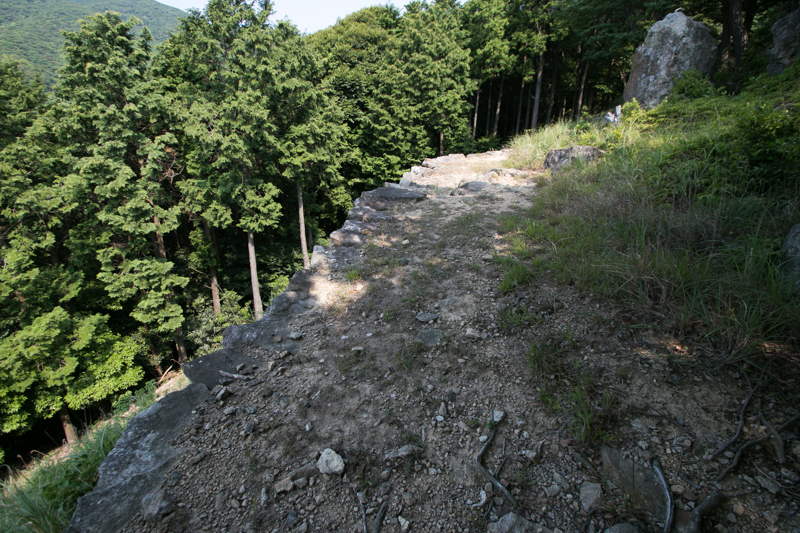 Secondary area is built the edge of hilltop area above steep slope. 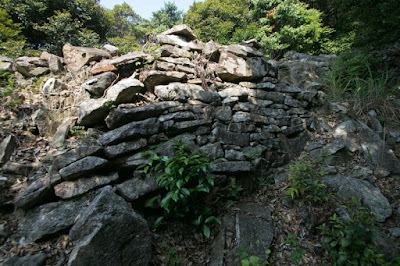 At the south line there is a large size Masugata style gate with folded path decorated by large stones, and basement of turret of 10 meter long square with tall stone wall at the next. 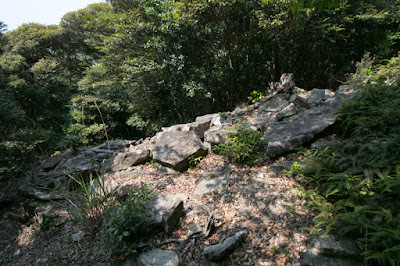 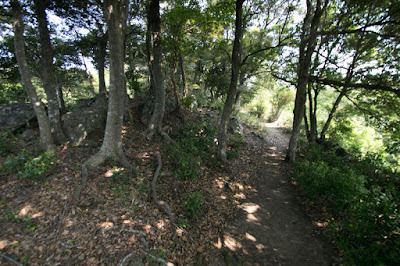 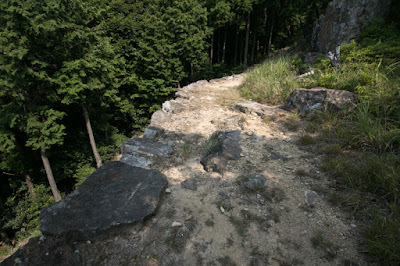 As this point is prominent seen from hillside, there might be a symbolic building around this area. 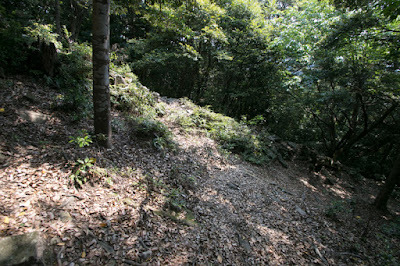 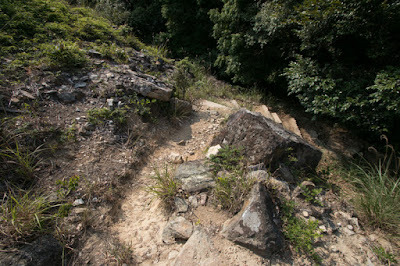 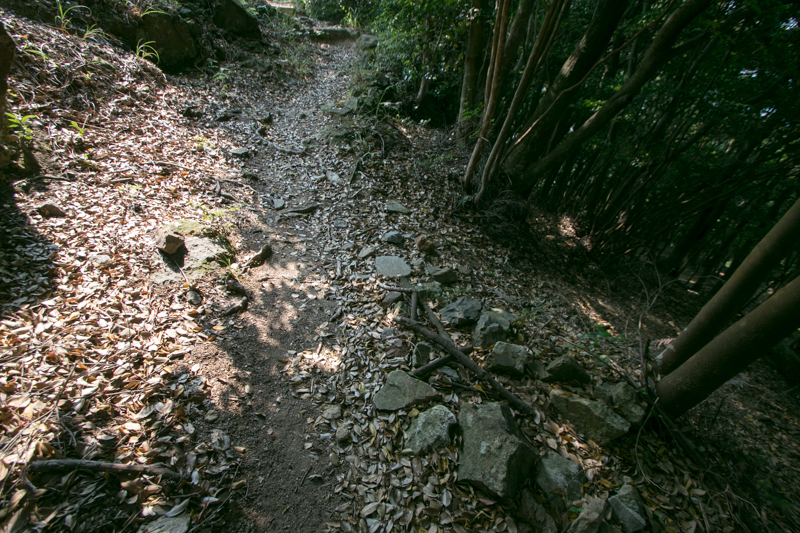 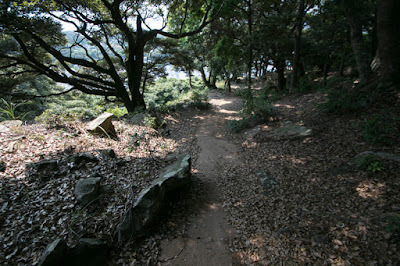 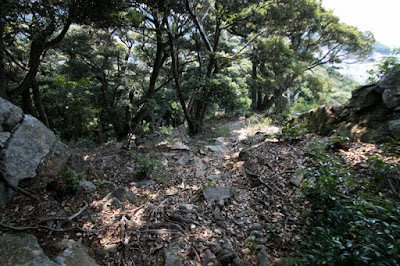 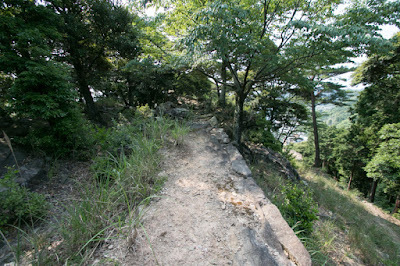 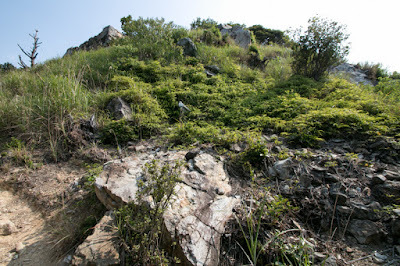 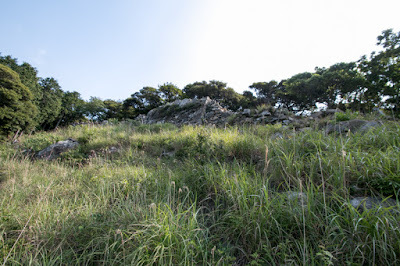 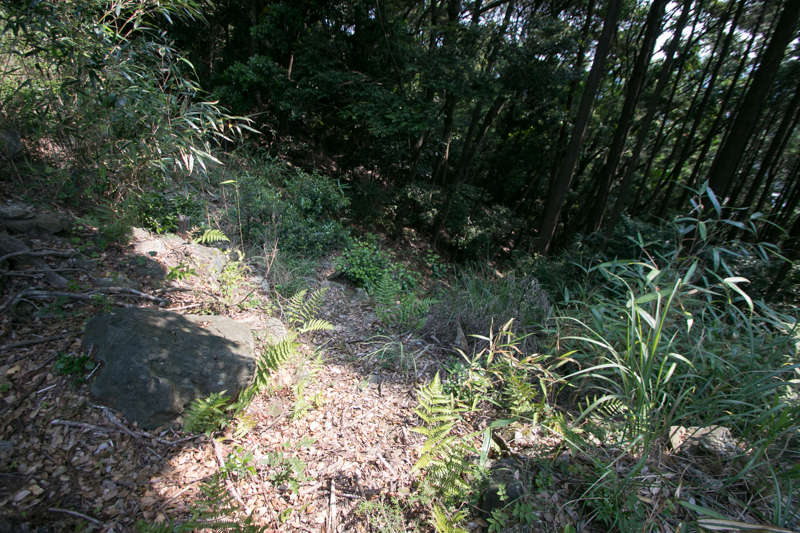 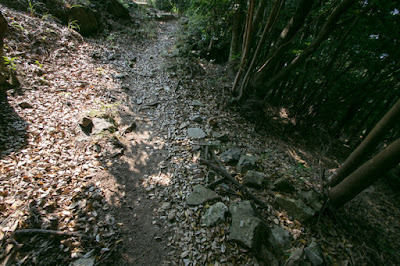 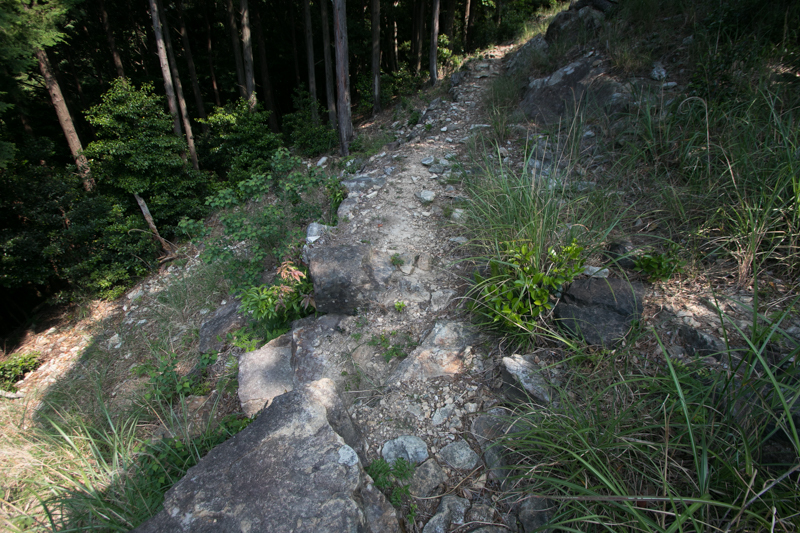 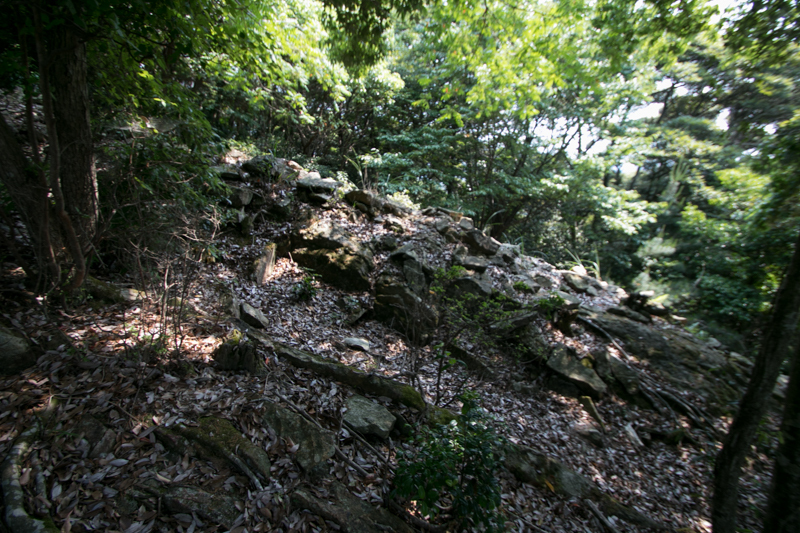 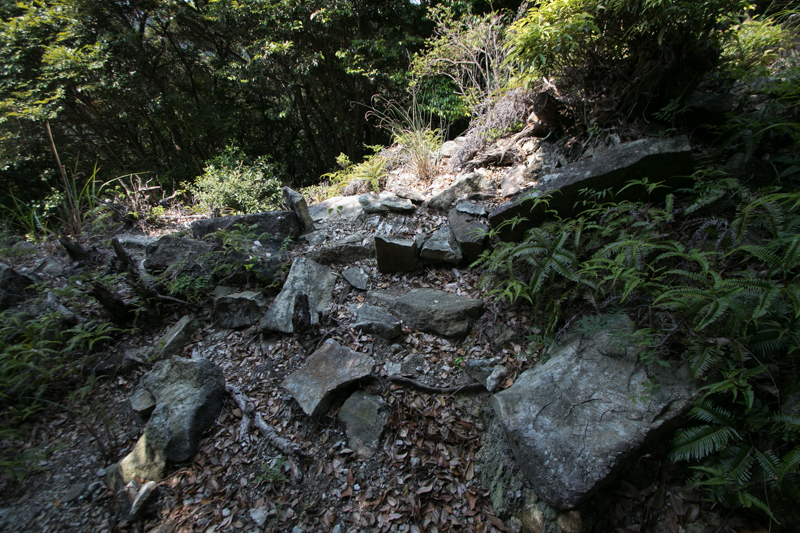 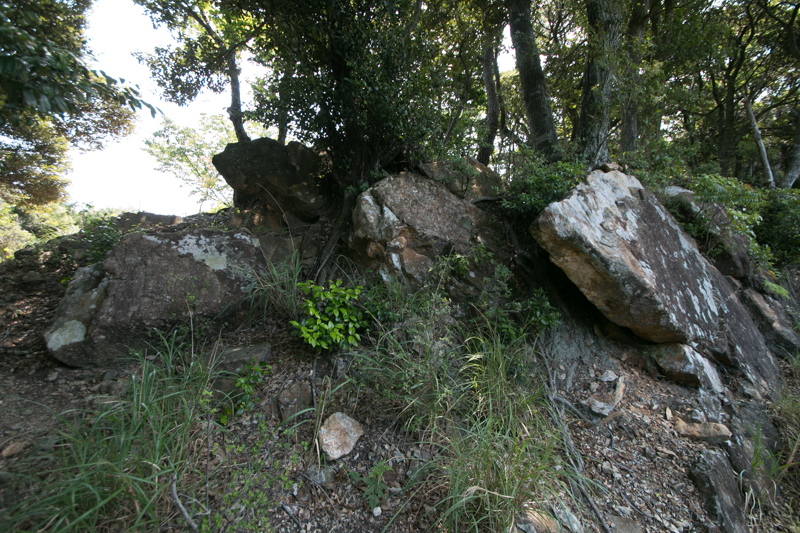 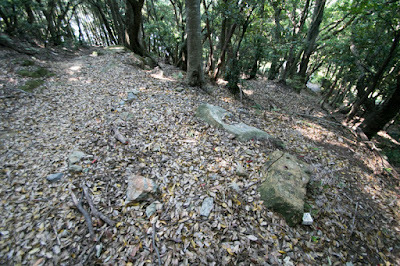 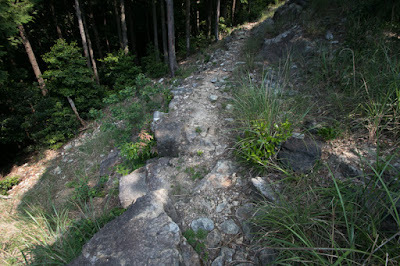 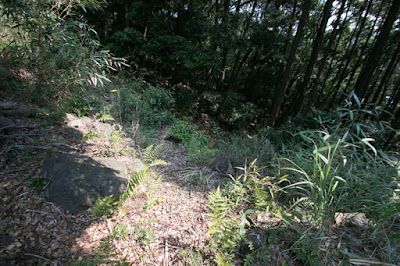 About 100 meter below of secondary area, third area exists which continues over 200 meter long on gentle slope. 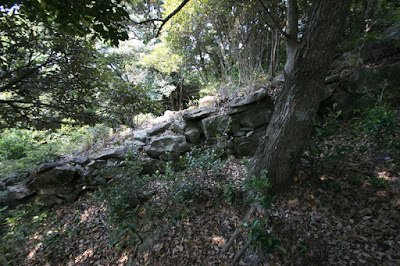 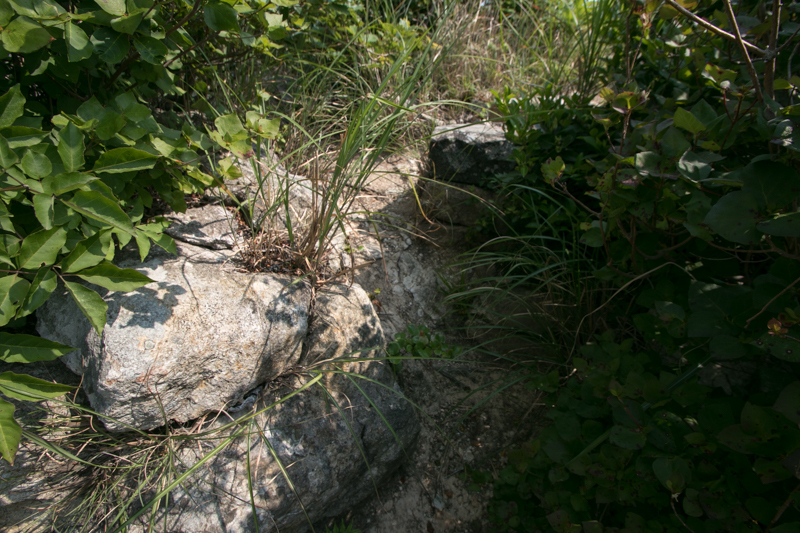 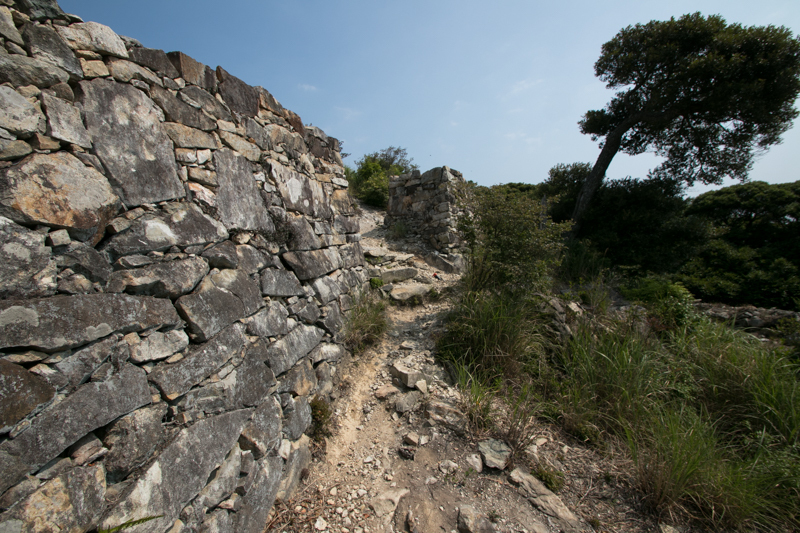 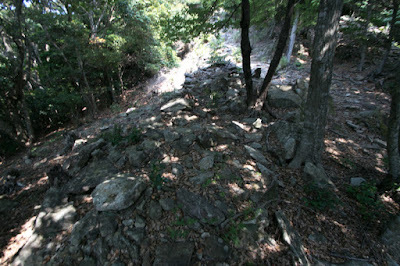 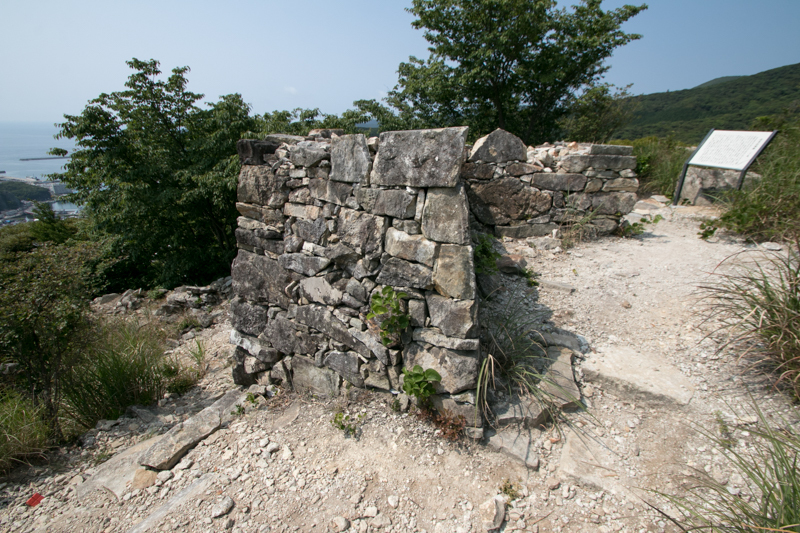 There are several projections at stone walls, which enabled side attack to the enemy tried to climb the wall. 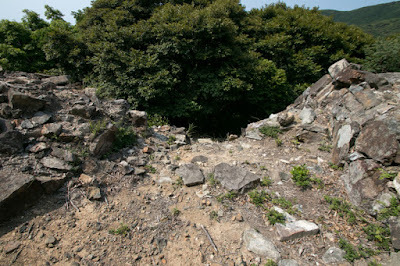 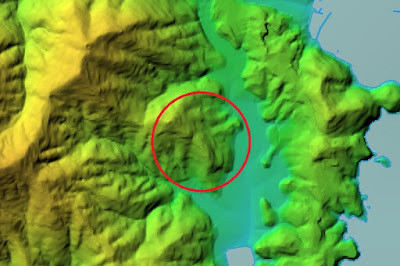 At the south edge of the area there might be a turret, and main gate of the castle might exist at the next of this turret. Generally the technology used for this castle is the latest one at that time, but usage of this castle is not clear. 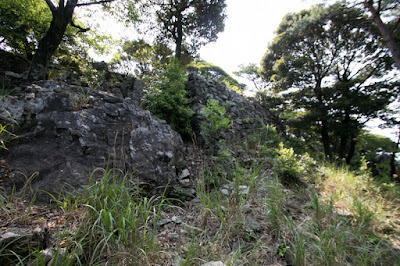 The hilltop area is too small to place the headquarter, and whole castle is too narrow to hold large army. 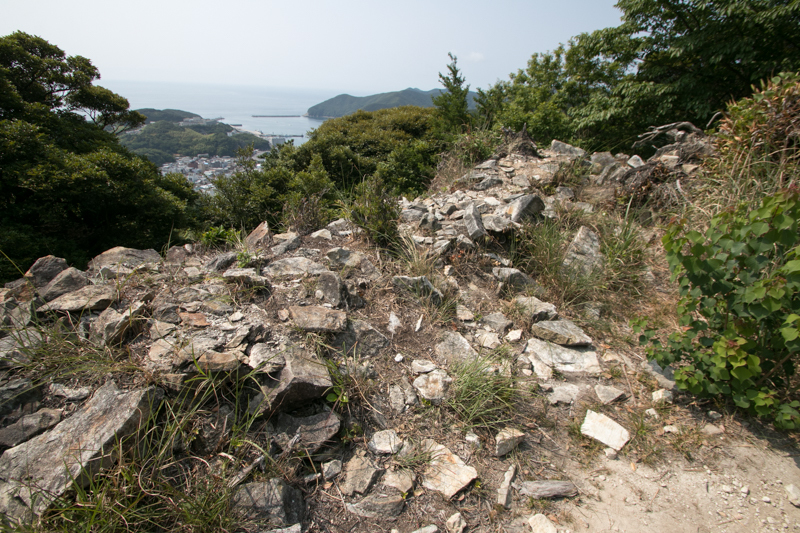 There is no ruin of well which is necessary for the siege, and line of stone wall does not include important facilities such as residence of So clan or Izuhara port. 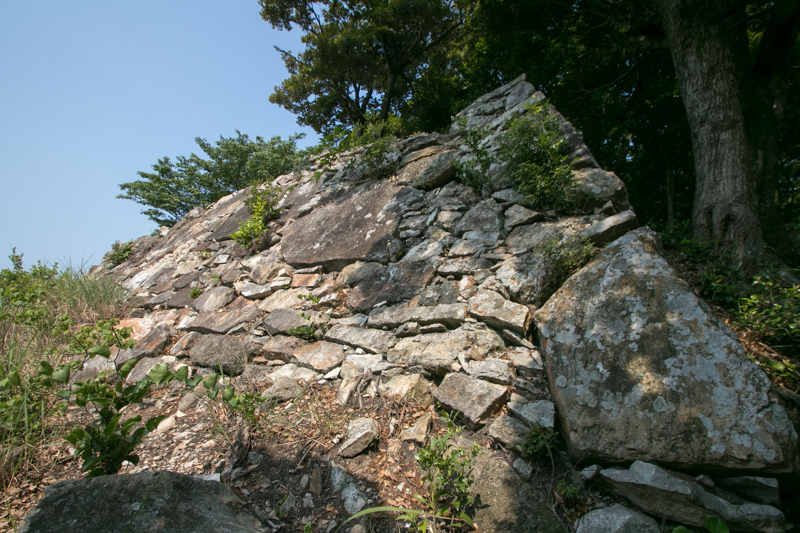 Probably this castle is built by advanced technologies to show the authority of Hideyoshi toward foreign countries, and also as a prototype of castles built during the campaign. Additionally, just above the residence of So clan, it might be a pressure of Hideyoshi toward So clan, to made them work hard on negotiation with the peninsula. 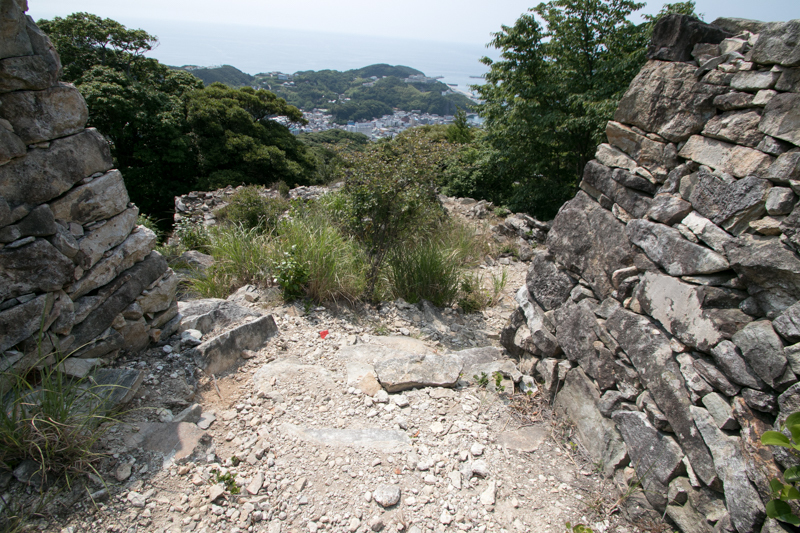 Along with the cease of the campaign in 1598 Shimizuyama castle might be abolished. 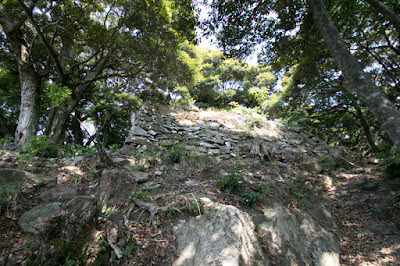 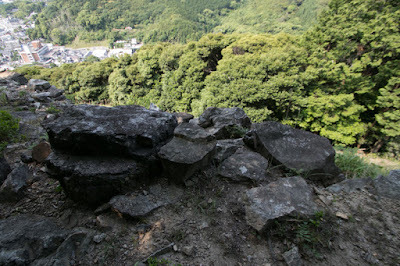 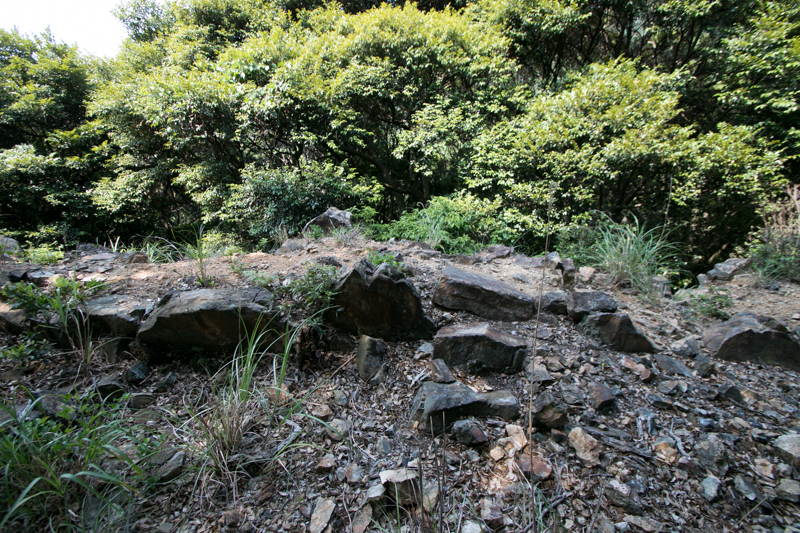 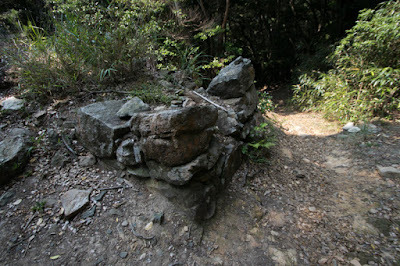 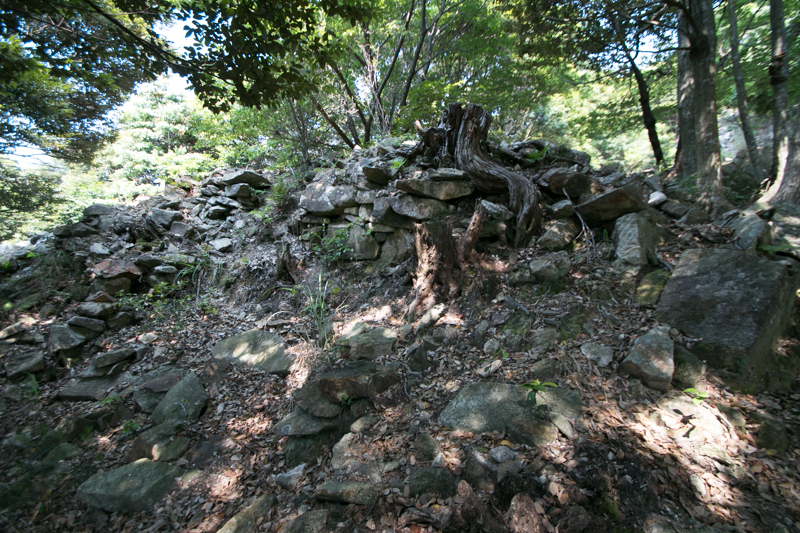 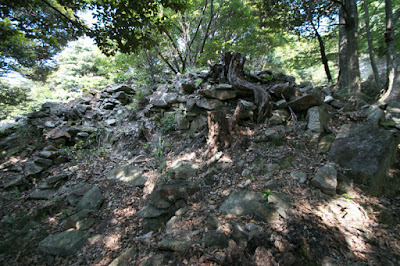 Today no building remain but stone walls of the castle well remain on the mountain. So clan remained as the lord of Tsushima domain and worked as a window toward the peninsula throughout Edo era. 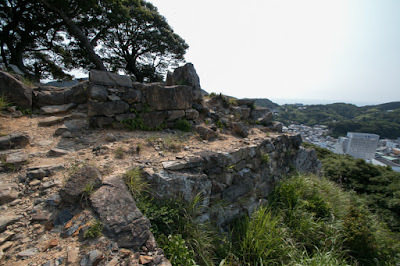 Takamasa Mori later reformed or built Tsunomure castle and Saiki castle (Oita prefecture), two brilliant castles compared with his small territory. 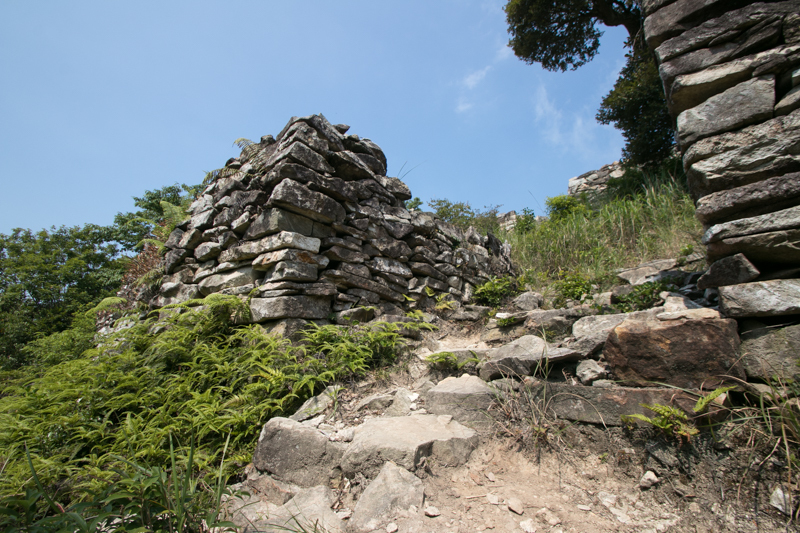 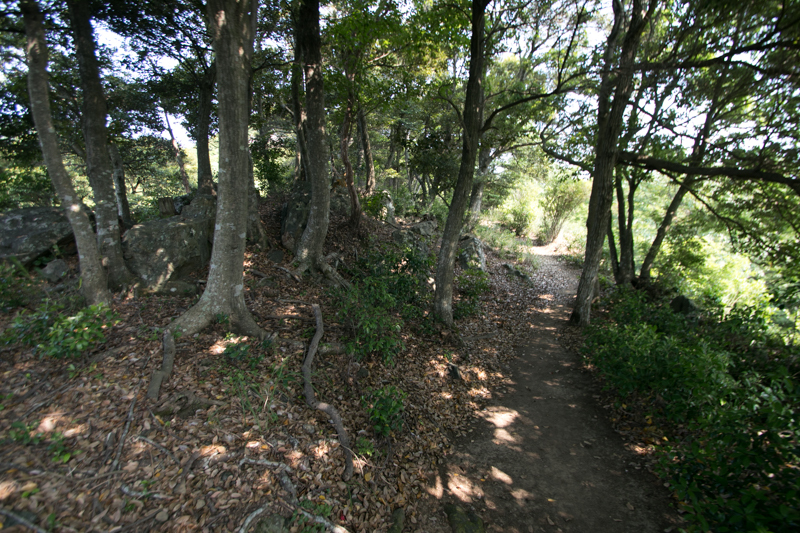 Today castle ruin is used as a corridor toward Ariakeyama mountain which is known as a place of good scenery, and Tsushima island is also crowded as an entrance from the peninsula. 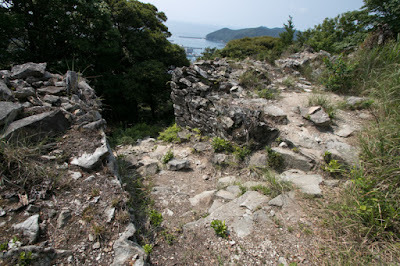 Castle ruin at the edge of Japan still looks down the ships sailing across Tsushima straight, which becomes a peaceful corridor totally different from tensioned period of its construction along with Kaneda castle, the ancient ancestor of Shimizuyama castle. 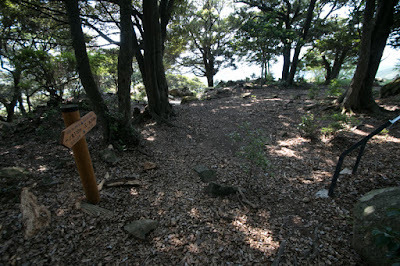 20 minutes drive from Tsushima airport or 10 minutes drive from Izuhara port to hillside. 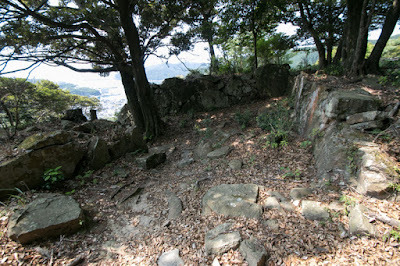 Another 30 minutes walk to hilltop castle.